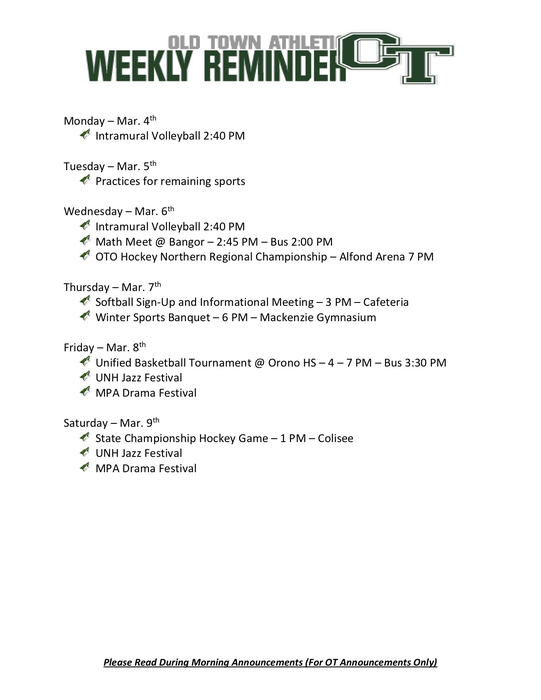 Sophomores will be touring UMaine, Husson University or EMCC on Thursday, April 25th. Permission slips are due by the end of the day on Tuesday, April 23rd. No late slips will be accepted. Please see Ms. Dow in the Career Center if you have questions. 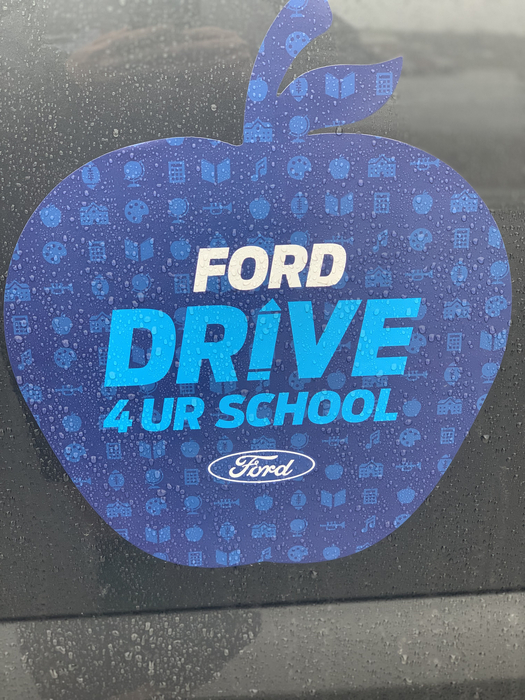 Darlings Ford Drive 4 UR School event at OTES! 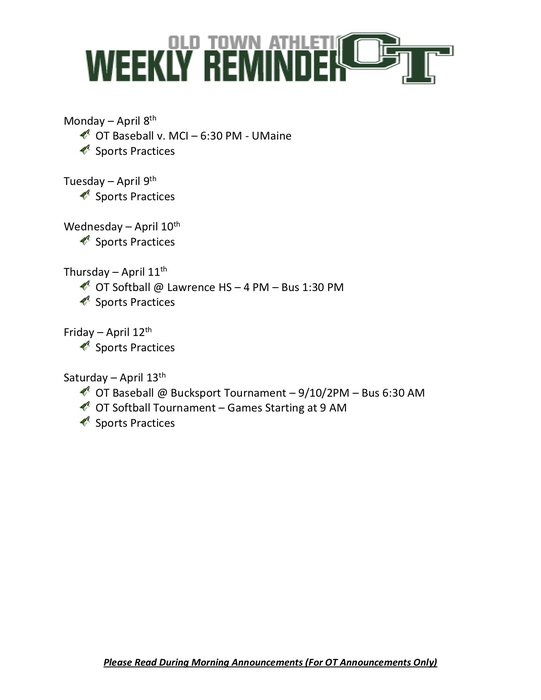 Come support our Baseball and Softball Teams! 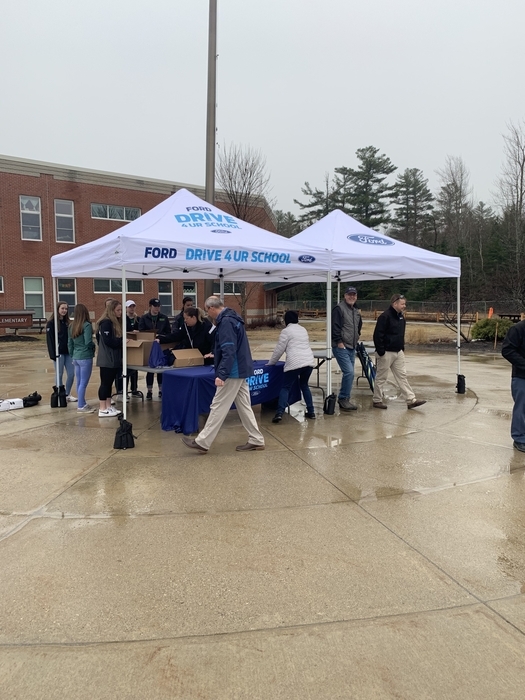 Rain doesn’t scare the fords at Darlings! 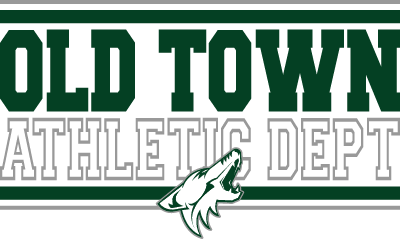 Track meet today at MDI is canceled due to weather and facility conditions. No makeup date has been announced yet. 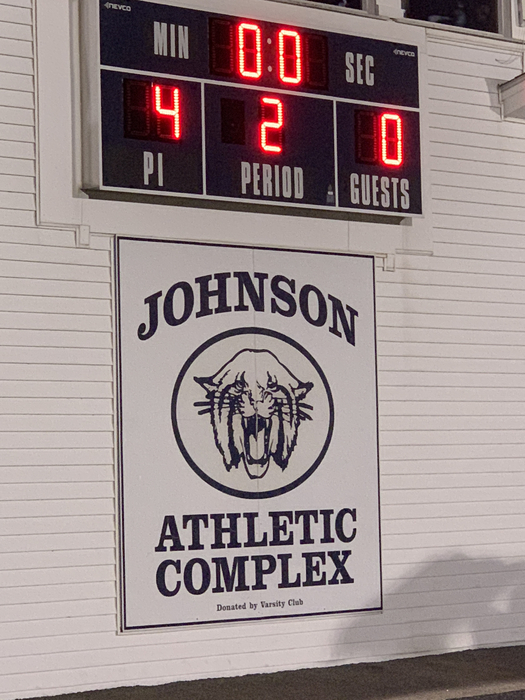 Couple of great games for the JV programs v. Brewer today. Baseball won 13-11, Softball lost 8-4.... Great couple of opening day games! 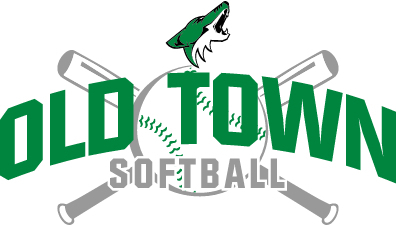 OT Softball opened the season today on the turf at H.A. 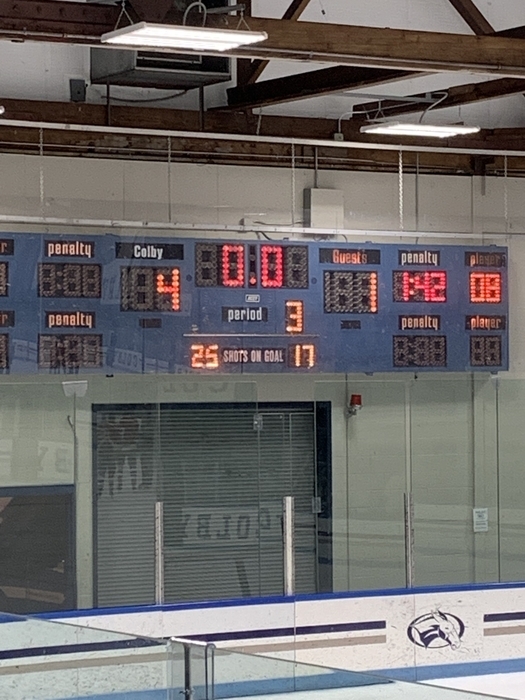 OT with the 8-0 win against Orono.... Next game is on the road to ELL! 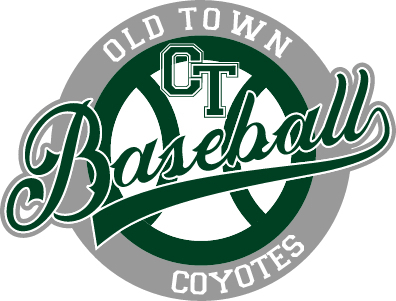 Couple of good wins for the OT Baseball team today v. Orono - Varsity opening up with a 13-3 win, JV won a shortened game 6-3... Next game on the road to ELL. 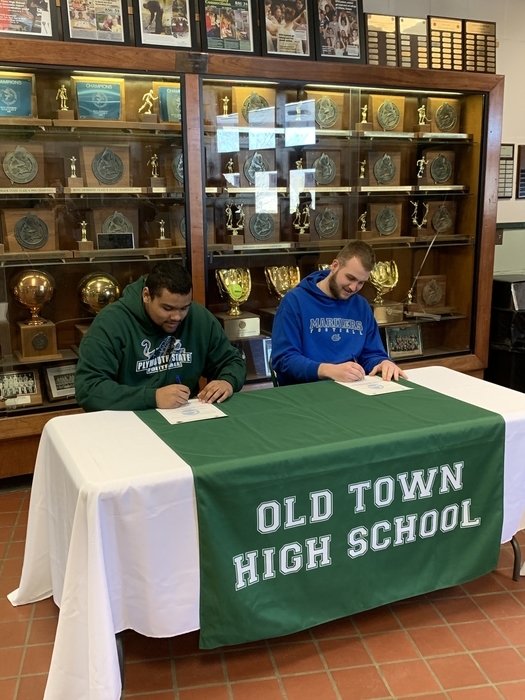 Special day for two OT Football Players as they sign letters of intent and continue playing football at the next level... J. Spencer to play for MMA and D. Mitchell to play for Plymouth State next year! 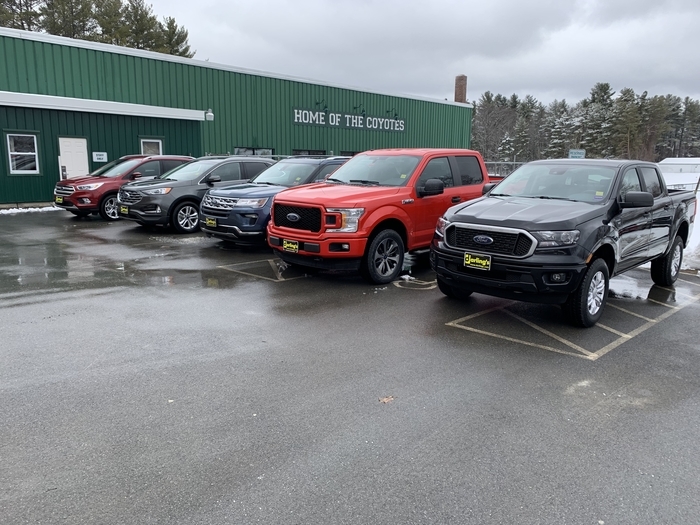 Looking for a new car or truck? 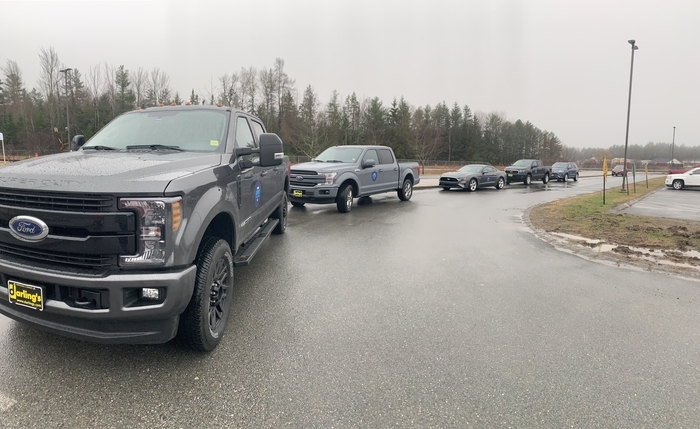 Ever wanted to try a Ford vehicle out? 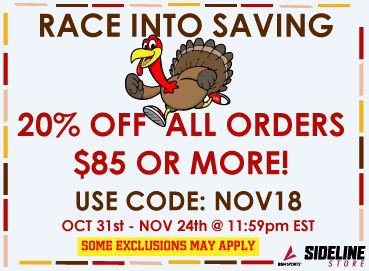 Well we have a deal for you! 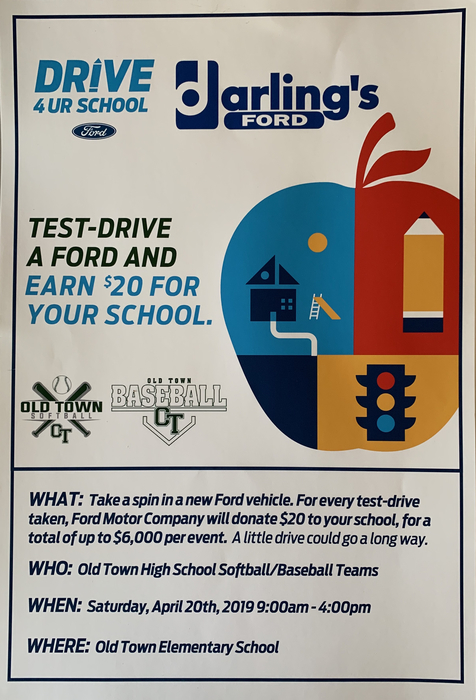 Come support our OT Baseball and Softball program by test driving a Ford Vehicle on April 20th at OTES - Also, text drive a car and get your current car washed! 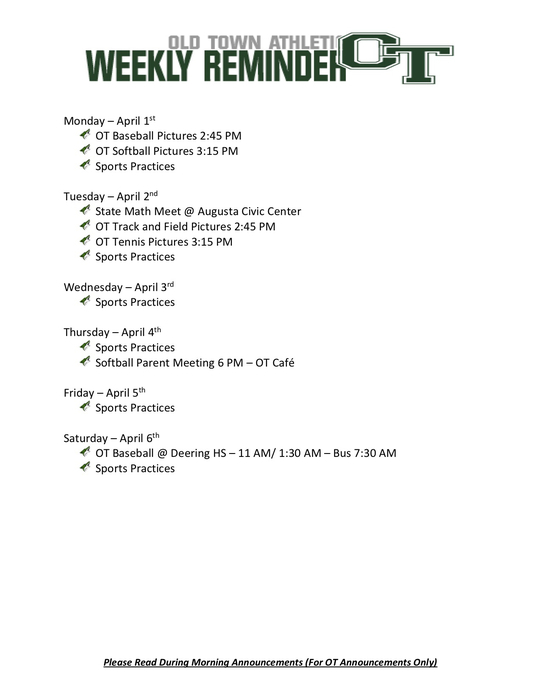 Updated Athletics for the week of April 8th! 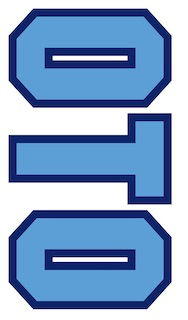 Tuesday, April 9, 2019 is a normal day of school for students in grades 9, 10, & 12. There is no change due to testing. 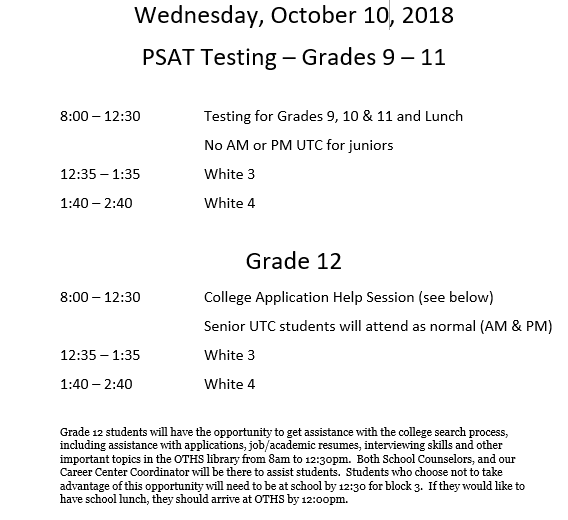 Students in Grade 11 will take the SAT from 8:00 until approximately 1:00. Students will be dismissed after testing and lunch. Juniors need to be on time as no students will be admitted to testing rooms after testing has started. If there is a delay due to weather, please check back for more information. Today, April 8th - No School is RSU34- Please be safe - All Games, school events, and practices are canceled. Update - Softball and Baseball games have been canceled for this weekend due to field conditions. 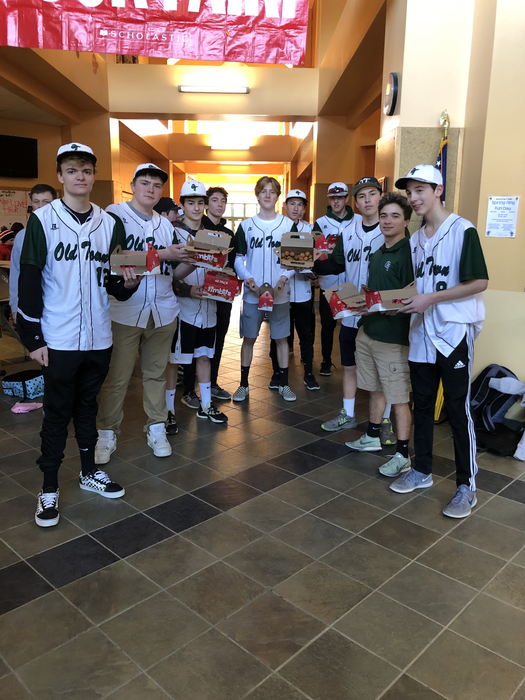 Positive Post Friday - OT Baseball helping the OTES Dad Group with “donut Friday” - handing a little treat out to the kids before school! 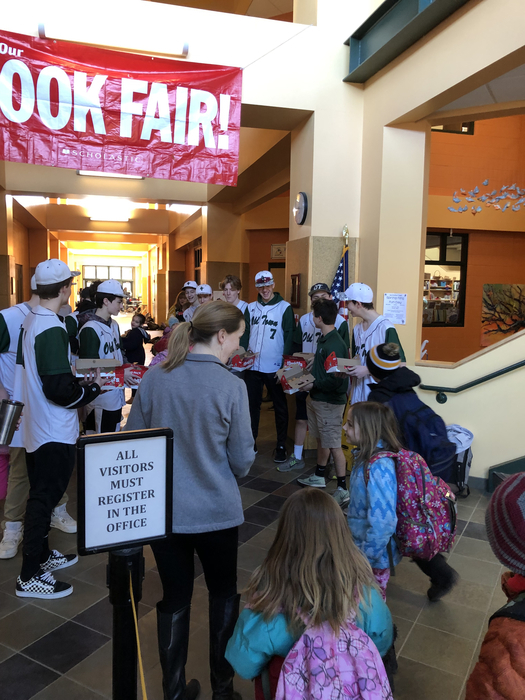 Continued community outreach by our OT Athletic teams, giving back to the community! Seniors!!! We have 2 fundraisers this weekend. 1. 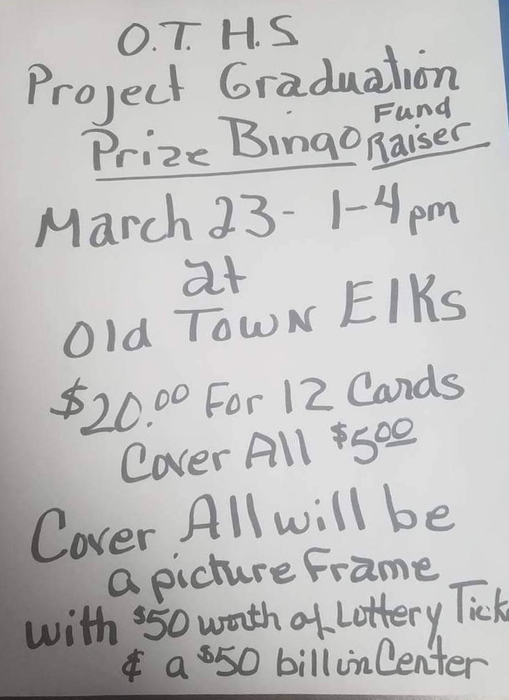 Lottery Frame Raffle/Bake Sale Saturday 4/6 at Sam's in Bangor. 2. Bottle drive on Sunday 4/7. Meet at Mahan's at 10. Need trucks and seniors to count and collect! 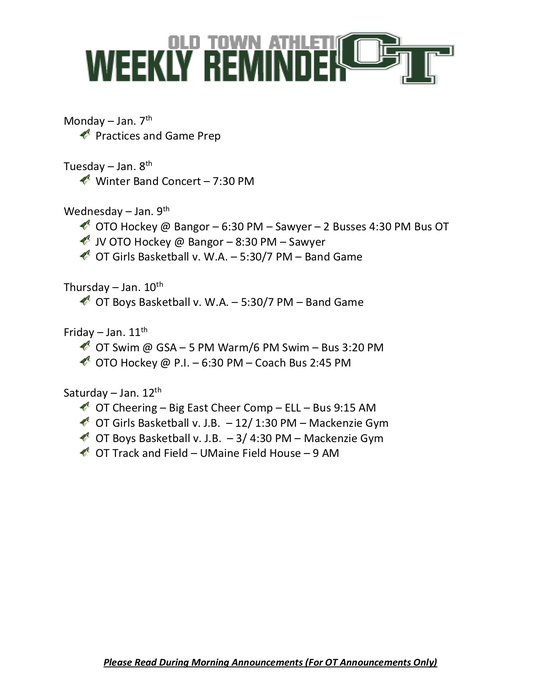 See Mrs A. Ketch in the guidance office to sign up for both. We are close to our goal to give you an amazing Project Grad! 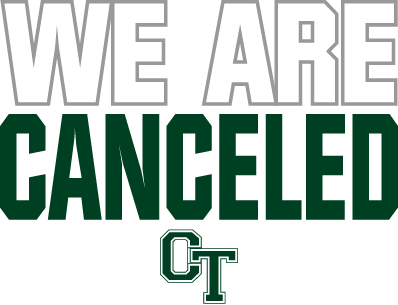 All after school activities and practices are canceled for OTHS. Please drive safe. April 2nd is going to be a different day for most students at OTHS. 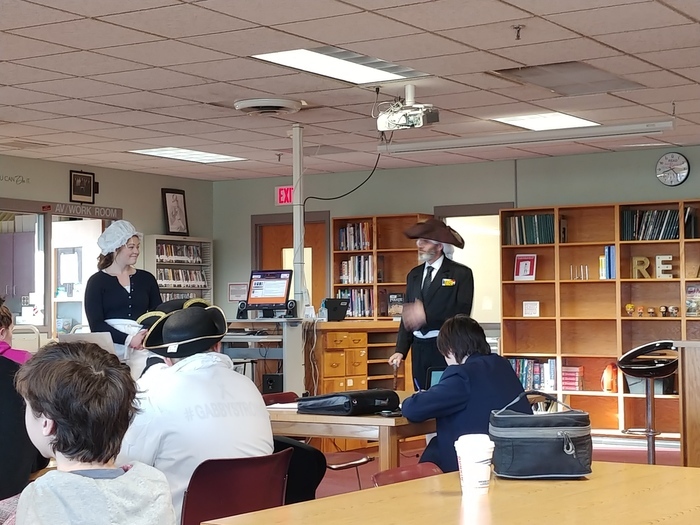 Grade 9 – Normal Day – No changes. Grade 10 – Sophomores will be touring United Technologies Center during blocks 1 and 2. Students will leave around 8:15 and return by approximately 10:30. 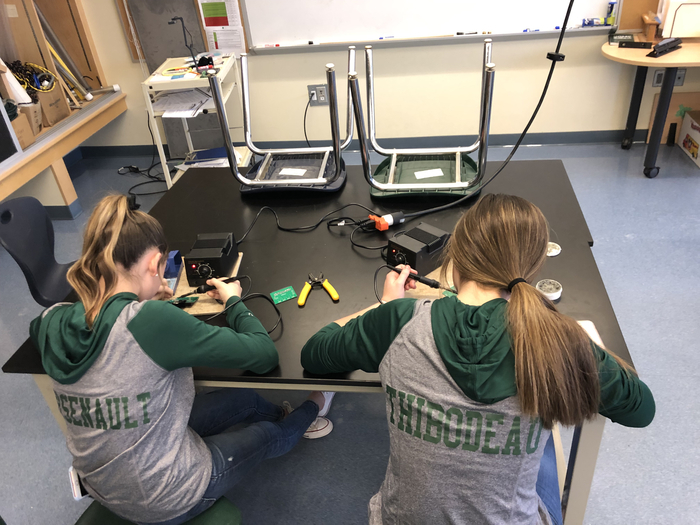 Grade 11 – All juniors will take the Science Augmentation during blocks 1 and 2.This is part I of the state mandated testing for all juniors in the State of Maine. Please make sure that students are on time to school on Tuesday. 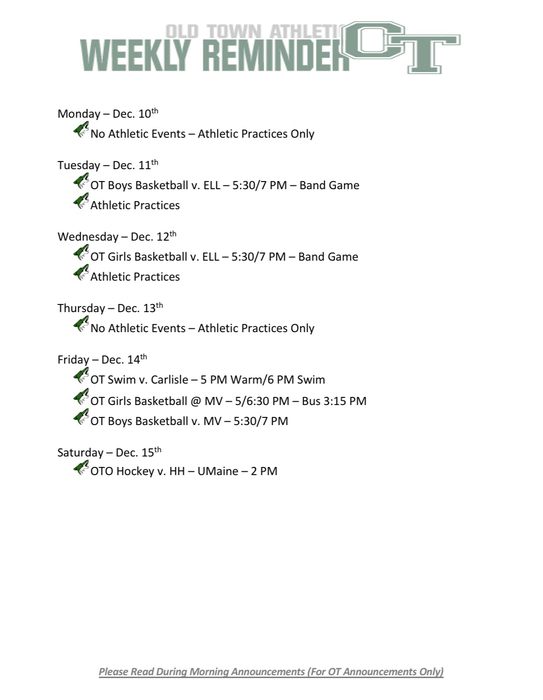 Grade 12 – Will report to school at 10:45. Senior UTC students can attend AM as usual. 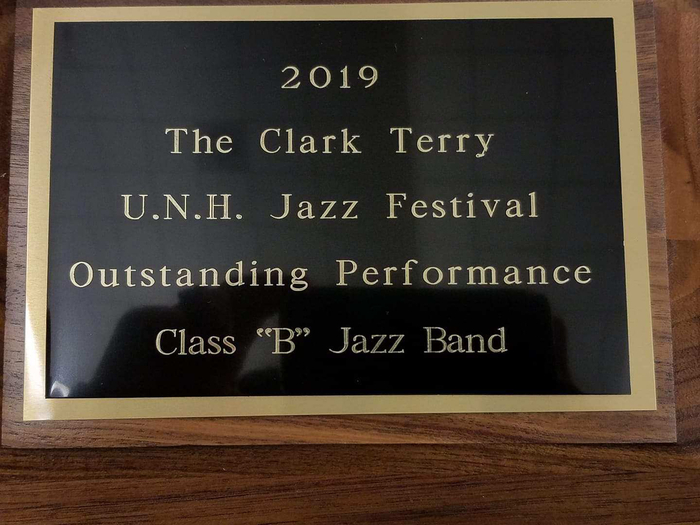 Picture of the Outstanding Soloist at UNH Clark Terry Jazz Festival. All of our soloist got Outstanding Soloist, this has never happened for us in 30 years! 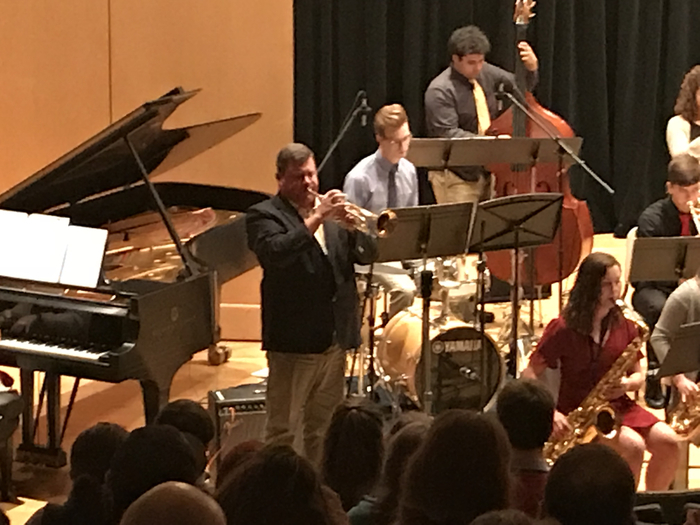 Left to right - Adam Regan, Annabelle Muscatell, Demetrius Porter, Mercedes Creighton-piano, and Levi Trefts. 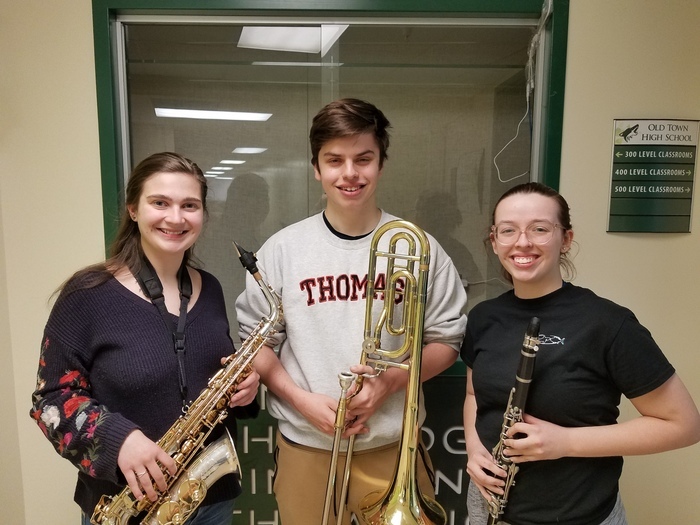 These 3 students will represent Old Town High School at the MMEA All-State Music Festival held on May 16-18 at the University of Maine. 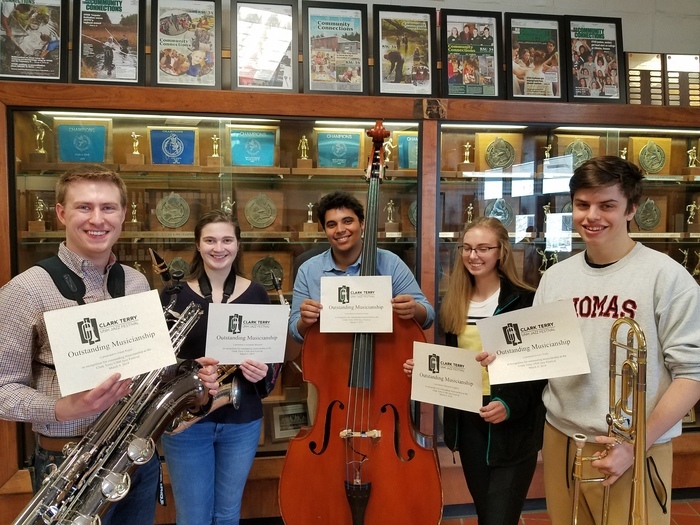 They are all members of the All-State Band. Left to right-Annabelle Muscatell, Levi Trefts, and Emily Dunlap. Attention senior parents!!!! Pictures for the senior video are due by April 12 to Mrs. Woodard. They can be turned in hard copy (w/name on the back) or email to megan.woodard@rsu34.org . Pictures submitted after this date may not be included in the video. We don’t get a chance to say it enough, but we truly are lucky to have this man serve our schools. By the way it happens to be his birthday, “26” years old! 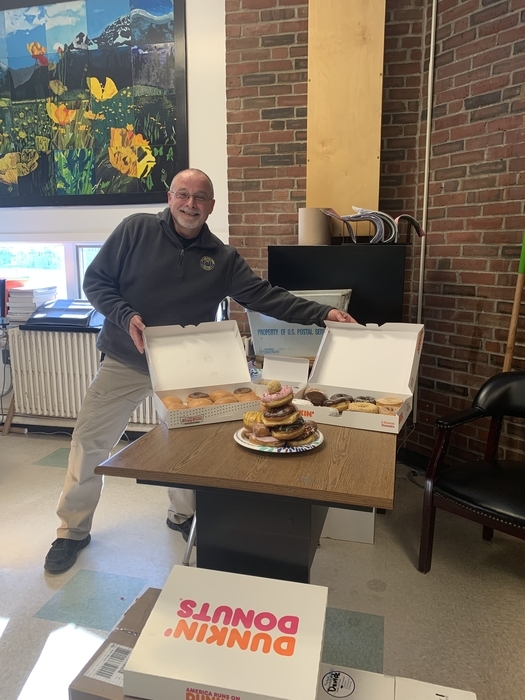 OTHS staff celebrated Officer King with his “favorite” food - Happy Birthday officer King and thank you! 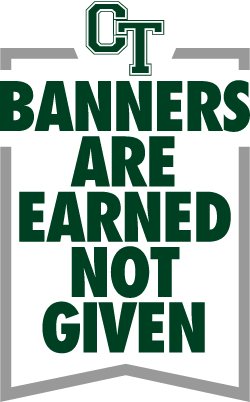 A reminder for our spring student athletes. 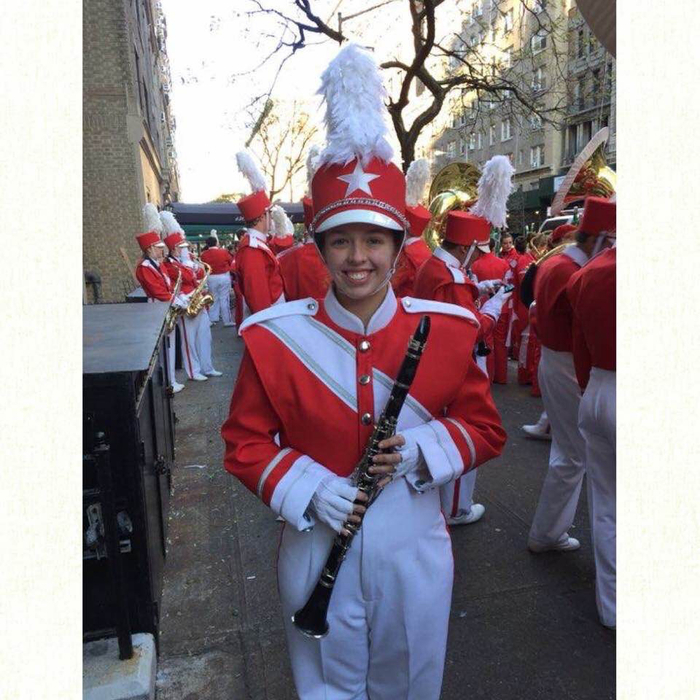 Spring sports and tryouts will begin tomorrow, March 26th, so that students can feel free to attend funeral services for Gabby. 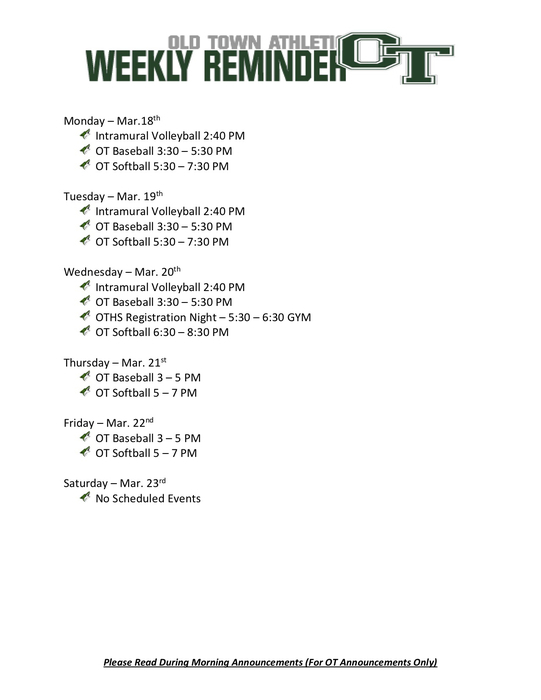 Spring sports and tryouts will start tomorrow, March 26th - thank you for your understanding. CLASS OF 2019 PROJECT GRAD FUNDRAISER!!! Come join them on Saturday, March 23rd for some fun and great prizes! 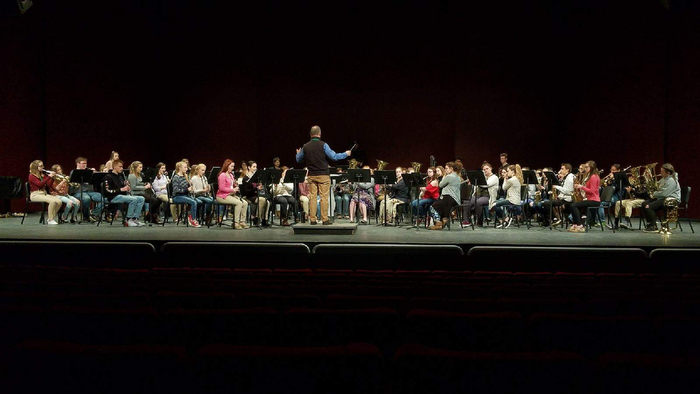 OTHS concert band and OTHS symphonic band at festival of winds this morning at UMaine Collins Center for the Arts. 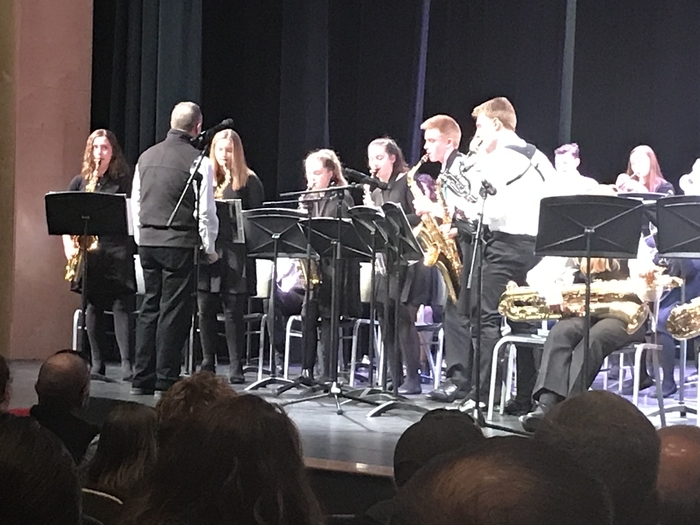 Two great performances from our music department. 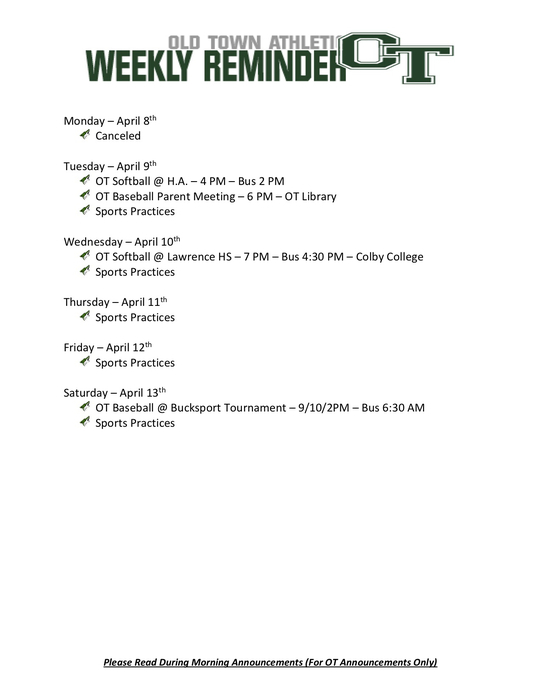 March 18th - Reminder that this week is pitchers & catchers only - Reminder that all athletes need a physical and required paperwork to participate in Spring Sports. 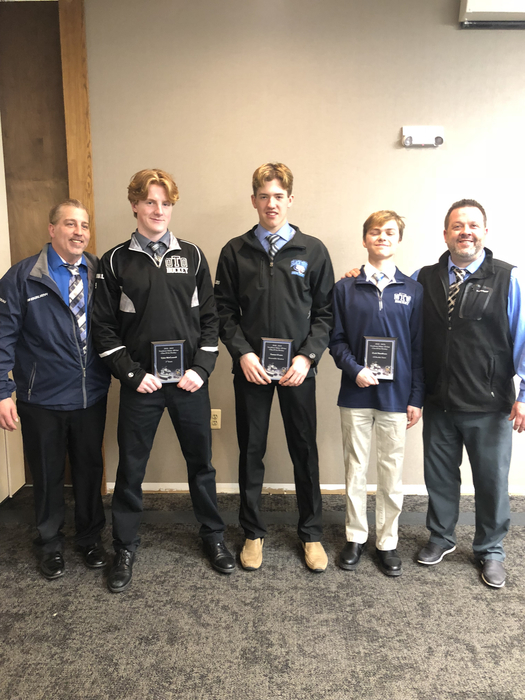 OTO hockey represented well at the state hockey banquet today. Congratulations gentlemen. 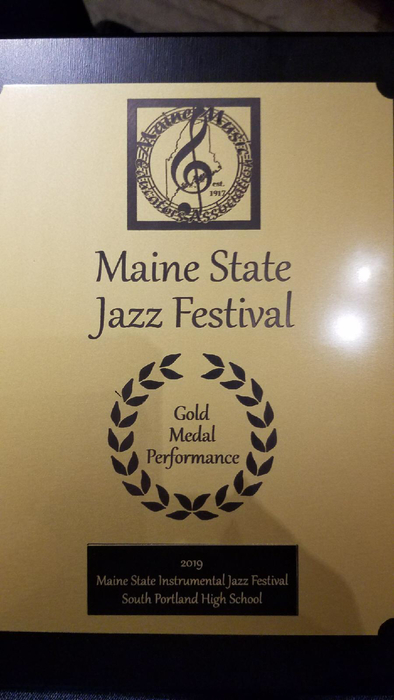 Congratulations to Nate Regan (drums) and Levi Trefts (trombone) for being named Outstanding Musicians at the State Jazz Festival. Great Job Guys! 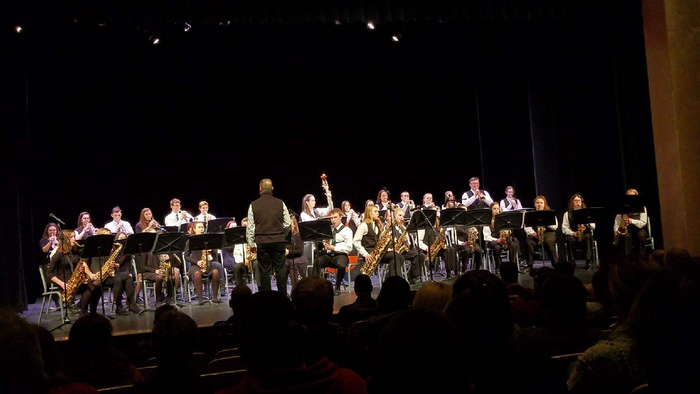 OTHS Jazz Ensemble takes GOLD! 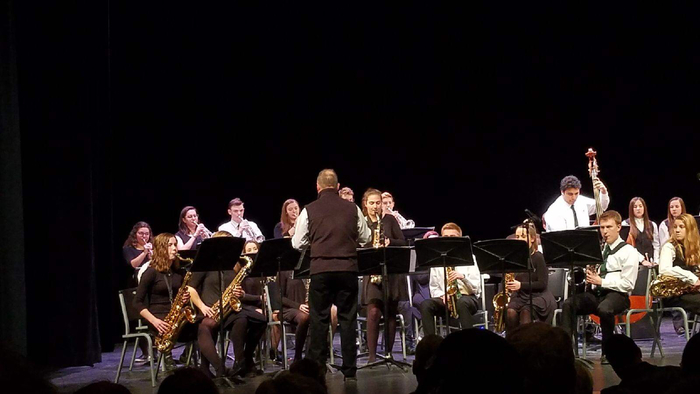 State Jazz Festival Outstanding Drummer - Nate Regan! 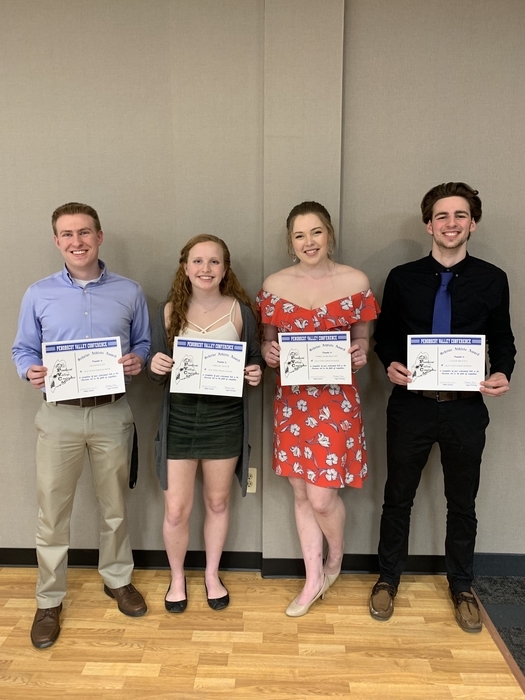 I had the honor and pleasure of hosting 4 OTHS Athletes tonight at the PVC Scholar Athlete Banquet. 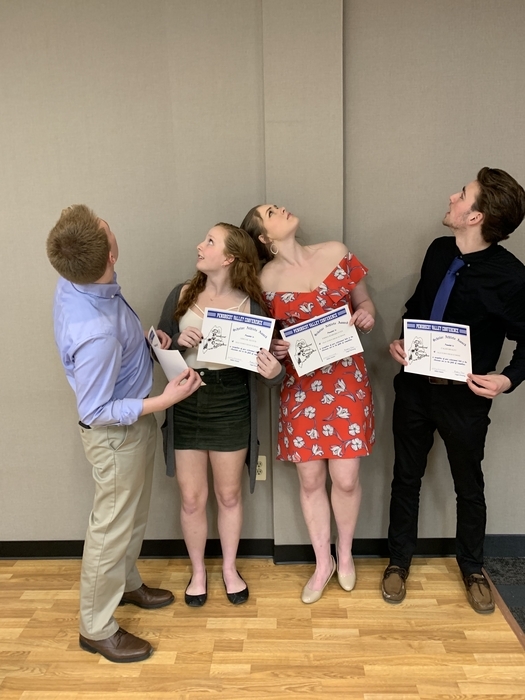 Congratulations Emma Hargreaves, Adam Regan, Abigail (or Abigal) Ketch, and Caleb Braley. Thank you for the great dinner conversations and for representing OTHS with pride and honor. High School is not just about athletics, clubs, and activities, it is also about academics. 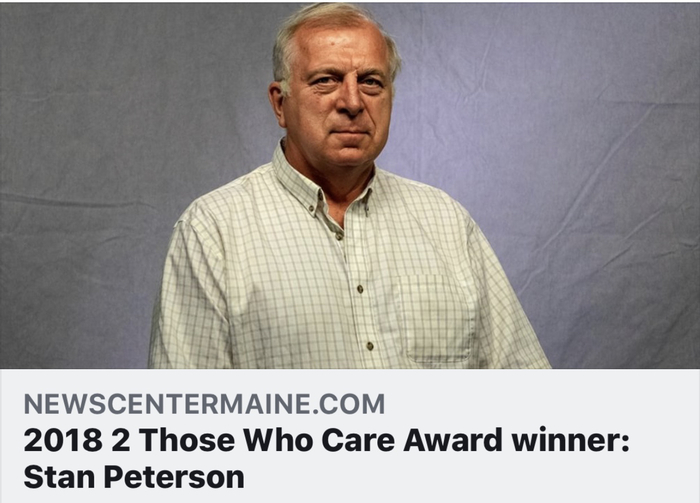 Combining stellar academics and being an involved community based citizen is a challenge, being all those traits and a regionally and national recognized for it - that exceptional. 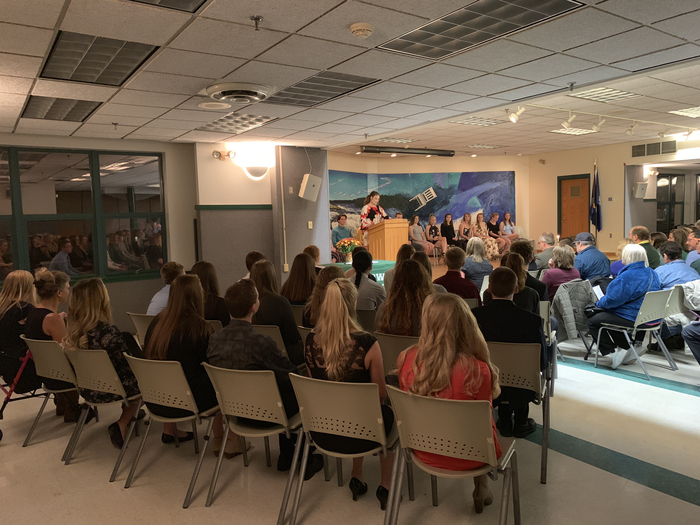 Welcome all PVC Academic team and the NISCA All-American scholar athlete team members. Congratulations - Coyote Nation is Proud! 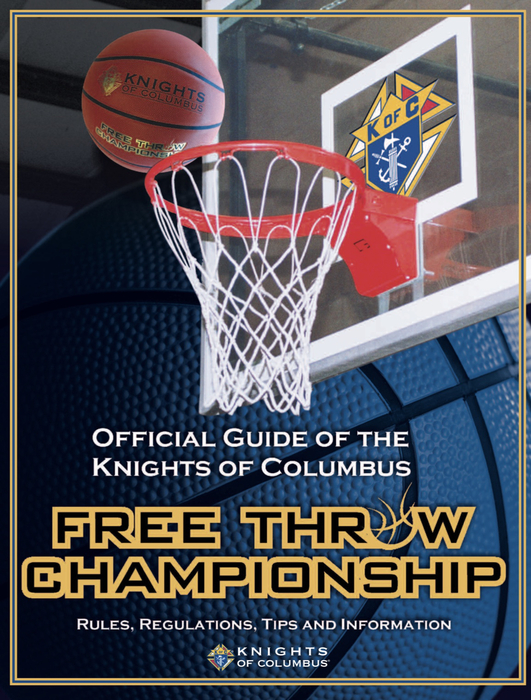 Congratulations to Chris Albert for earning the Knights of Columbus Foul Shooting State of Maine runner up! Chris lost in double overtime after having to make almost 40 straight foul shots! Job well done and way to represent Coyote Nation! 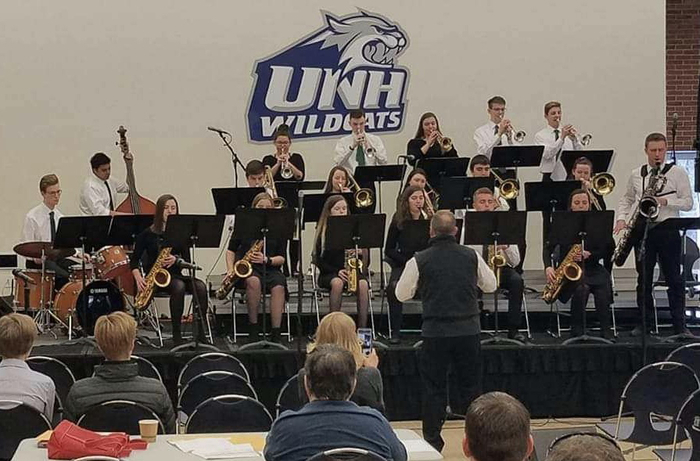 Congratulations to the OTHS Jazz Ensemble for earning the highest award at the UNH Jazz Festival and only Maine school to win an award! 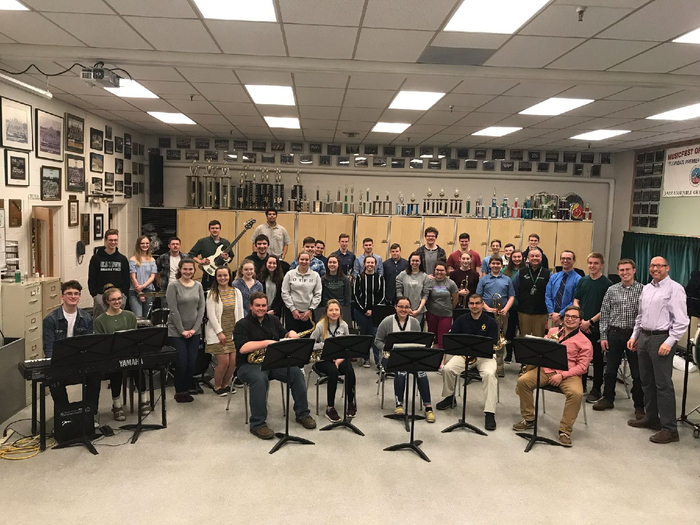 More band stuff: All of our soloists were recognized with Outstanding Soloist Awards. 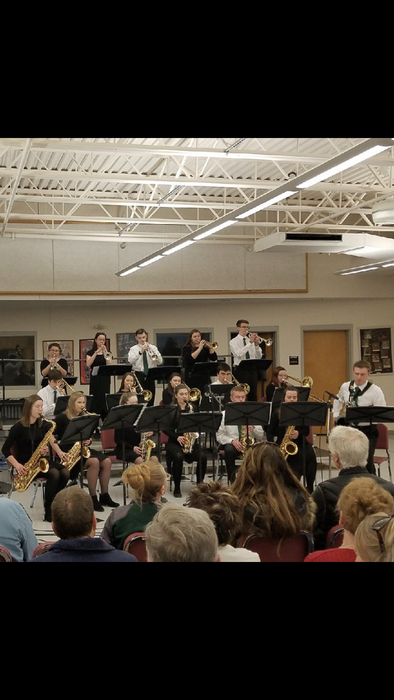 Levi Trefts on Trombone, Annabelle Muscatell on Alto Saxophon, Mercedes Creighton on piano, Dee Porter on Bass, Adam Reagan on Baritone Sax, and Nate Reagan on Drums! Making Coyote Nation Proud! 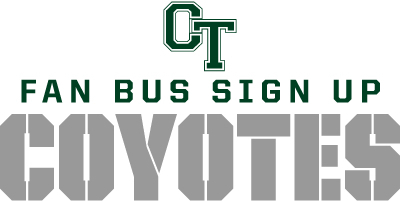 Reminder - If you signed up for the OTO fan bus - it leaves at 10:30 AM - if you leave on the bus, you go home on the bus - Officer King is your chaperone, represent OTO Nation with Pride! You will need money for entrance and food (optional) - have fun and see you in Lewiston! 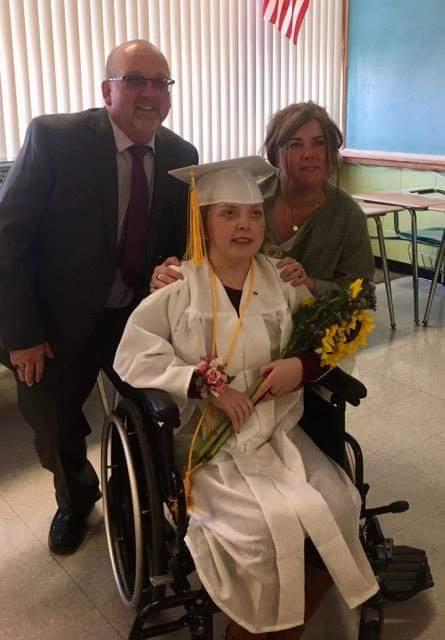 OTHS learning community held an early commencement ceremony for a special OTHS Senior. 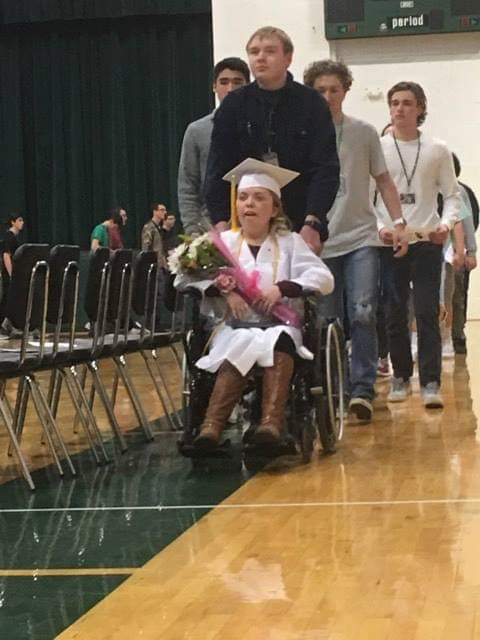 Her presence, heart, determination, and witty personality will forever change the culture of OTHS. 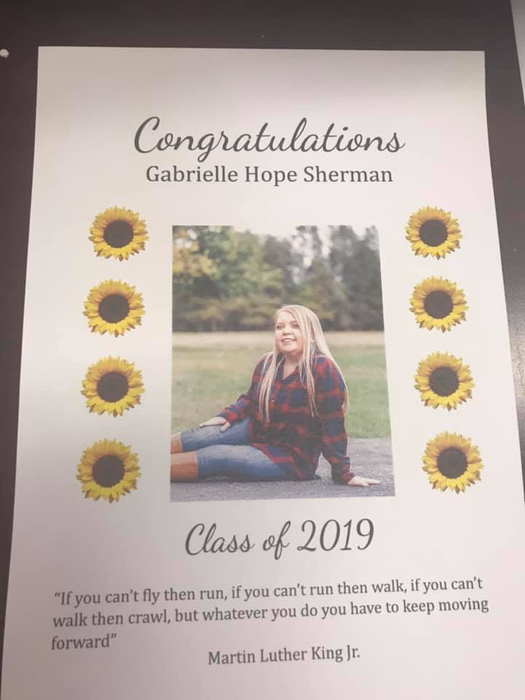 Gabrielle Hope Sherman - congratulations on earning your OTHS Diploma, we are proud of you! 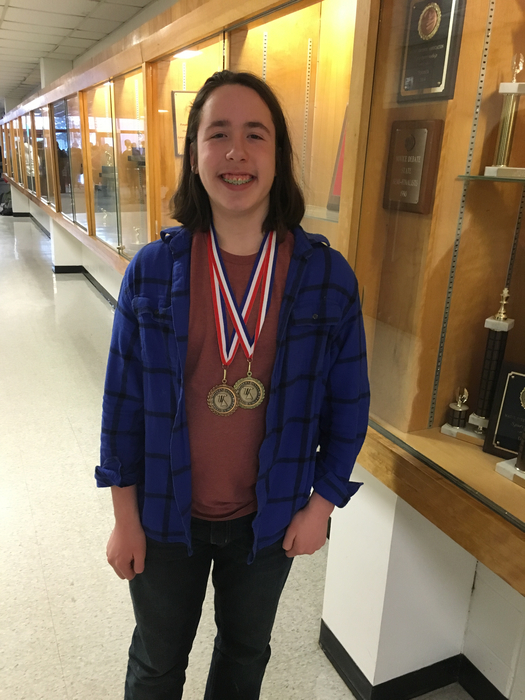 OT Math team as a whole did not fare well this season due to low participation, freshman Ethyn Lolar did earn 144 points in 5 regular season math meets, making him the 2nd highest scoring freshman for E.M. Math League. Congratulations Ethyn Lolar on your accomplishments. 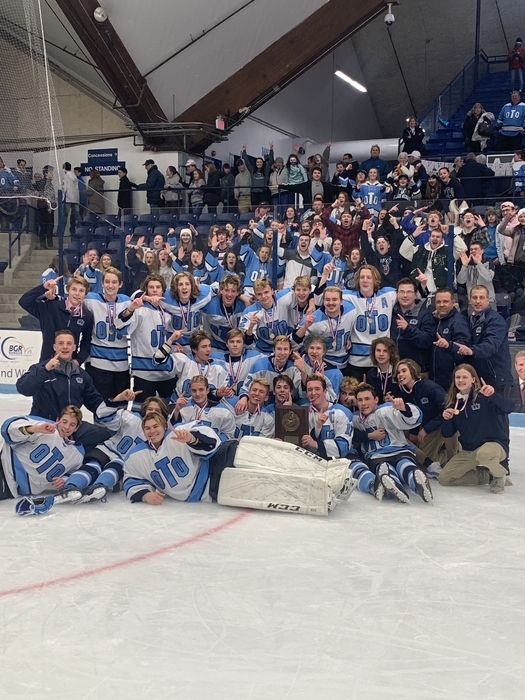 Hey, in case you missed it... OTO is heading back the State Hockey Championship! Amazing 1-0 win over Kenn. 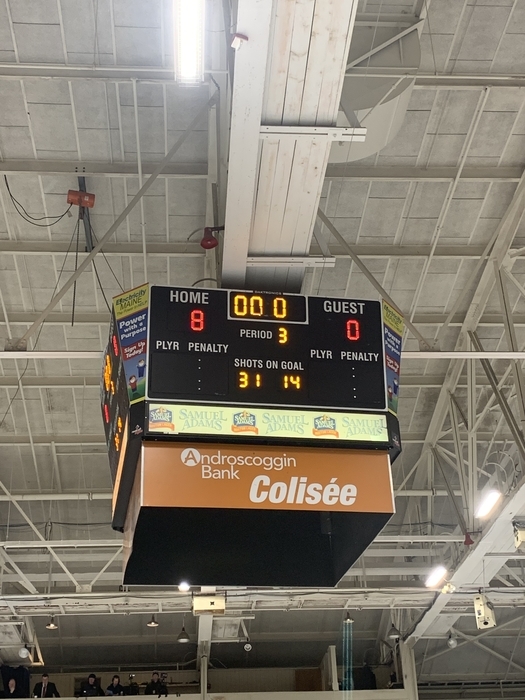 - Game will be 1 PM at the Androscoggin Bank Colisee in Lewiston! Fan Bus! 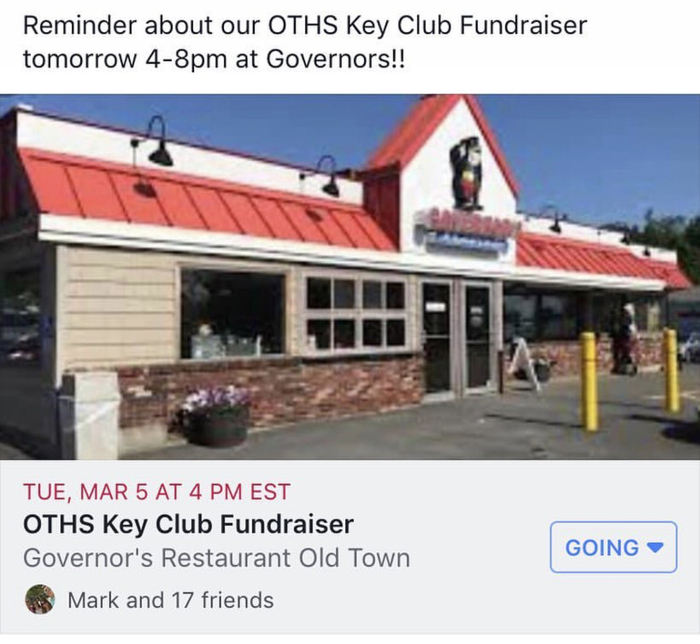 Reminder about the OTHS Key Club fundraiser and chance to eat yummy food at Governor’s Restaurant! 4-8 PM on March 7th. 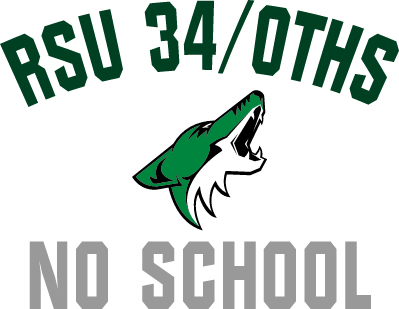 Today, March 4th - RSU34 has no school due to weather. Be safe. 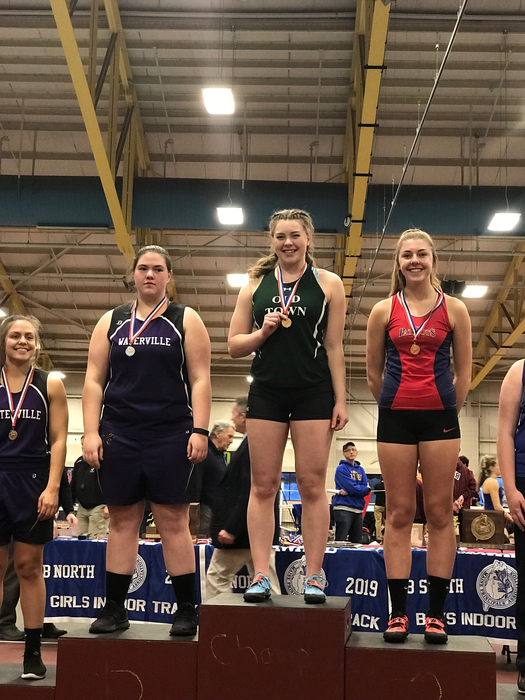 Indoor Track Report From Coach White - Emma broke her own school record and placed 7th in the Shot Put in New England - the boys 4 x 200 finished 18th in New England, and Cymeria (from Penquis) was 13th in the 55 and finished 2nd in the long jump in New England! 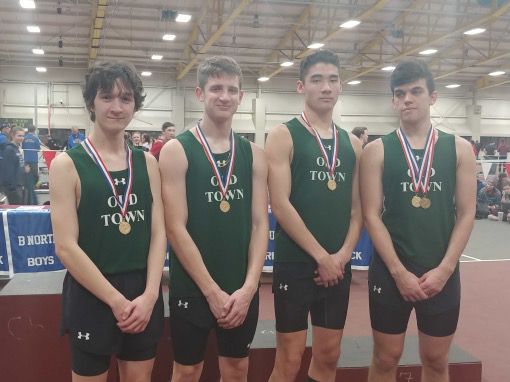 Good Luck to the State Champion 4 x 200M Relay team of Tre Dorr, Elijah Veilleux, Nick Letourneau and Zach Fostun, State Champion shot put Emma Hargreaves, and Penquis athlete Cymeria Robshaw as they represent Coyote and Patriot Nation at New England’s in Boston today! 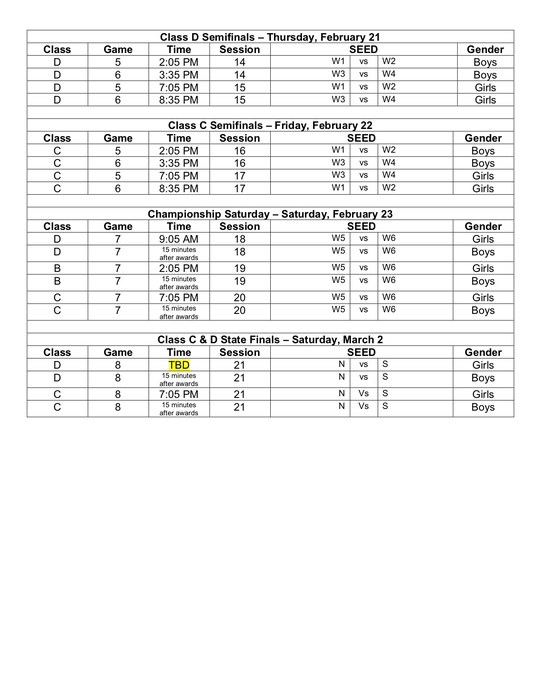 JV OTO Hockey will play tomorrow, Friday 3-1 at 3:45 PM v. J.B.
OTO Hockey Update - The MPA has changed the game times for Saturday, March 2nd. 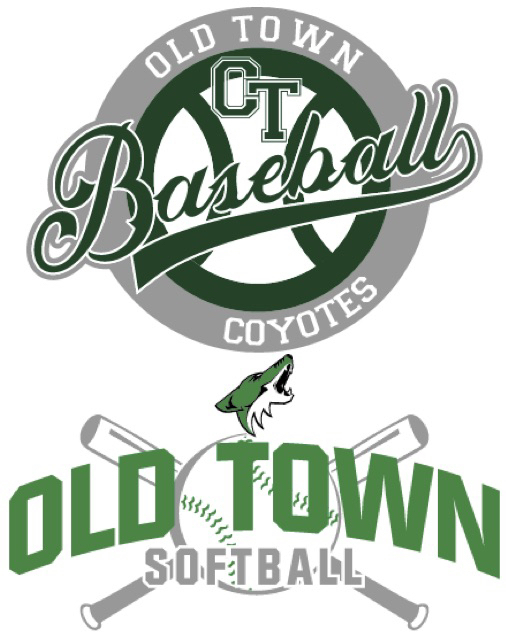 OTO will be playing the second game against Camden Hills at 5:00pm. 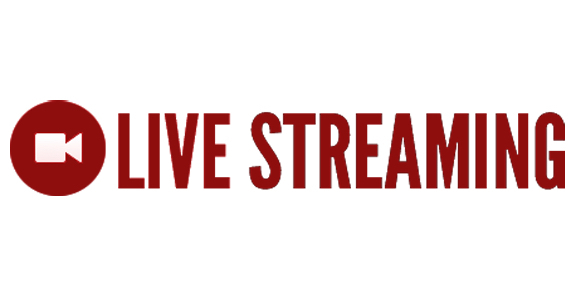 The Kennebec vs Presque Isle game will be at 1:00pm. The bus will leave OTHS at 2:00 and OHS at 2:15. Congrats to Charles Cota - the winner of our Bell’s IGA $500 shopping spree. Thanks to Bell’s IGA and to all who bought tickets to benefit OTHS Project Graduation! 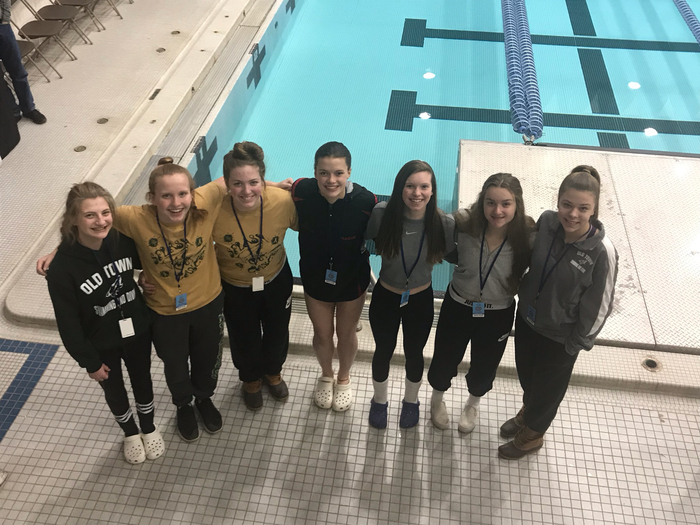 OT Girls Swim finishes the season today at the Girls State Swim meet - Girls finished 10th in the state lead by Teagan Blackie finished 2nd in the state in the diving competition! Great season ladies! 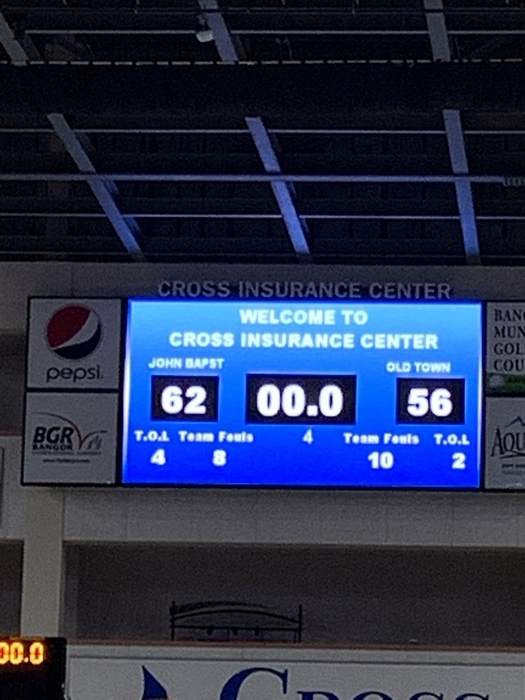 Girls basketball Quarter-Final game today - Girls lost 29-36 to the defending state champs Winslow - Girls and Coaching staff should be proud after the season they had and we hope for many more Cross Center appearances in the near future! 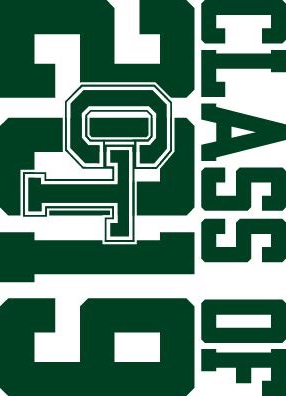 OT Boys Swim at UMaine - Boys places 10th in the state, Colin Rutherford finished 3rd 100 back stroke! 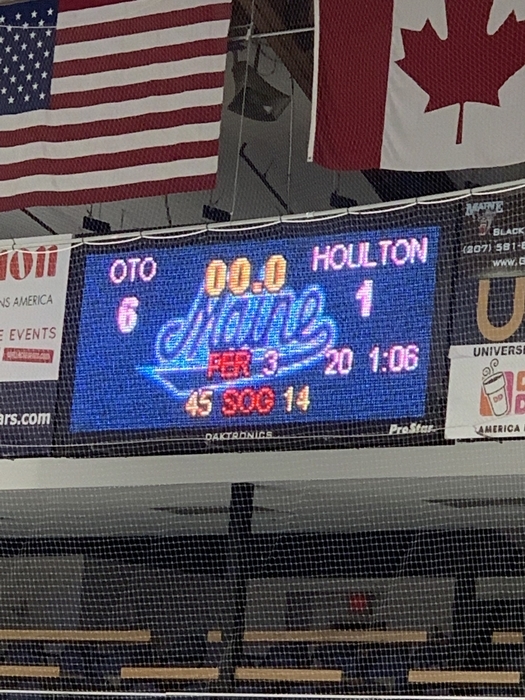 OTO Hockey in action for Senior Day v PI - Black Bears lost to a talented PI 6-3... thank you to all the Senior Players and Families for the years of dedication to the program! You will be missed! 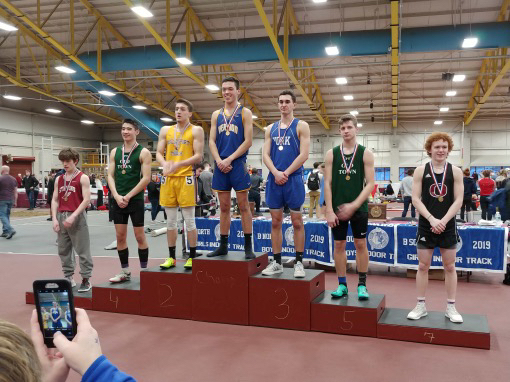 Championship Weekend Update - Indoor Track at Bates - ton of great performances by the Coyotes - Girls Shot Put State Champ - E. Hargreaves - Boys 4x100 relay qualifies for New England’s - 2 mile A. O’Meara podium - many more great performances! 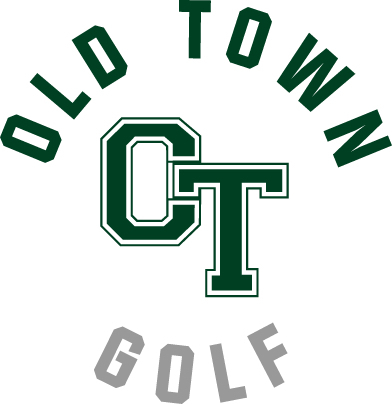 Good luck to all the OTHS students participating in regular season, regional, and state championships today! 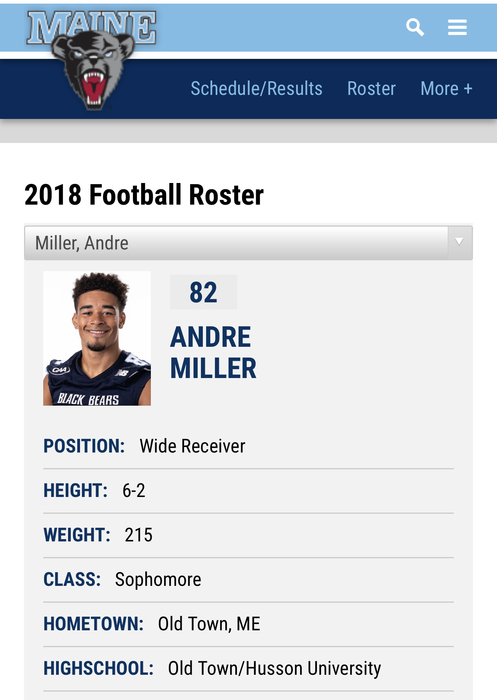 You make Coyote nation proud! 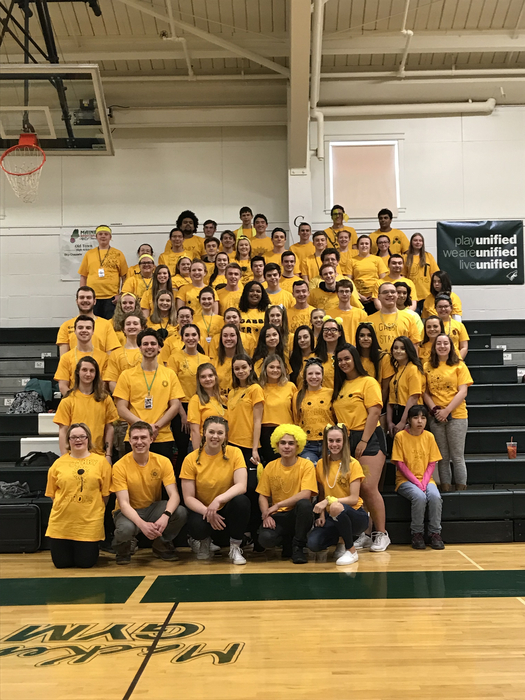 A little school wide recognition of clubs, activities, sports, and music before vacation at the 2019 Pep Rally! 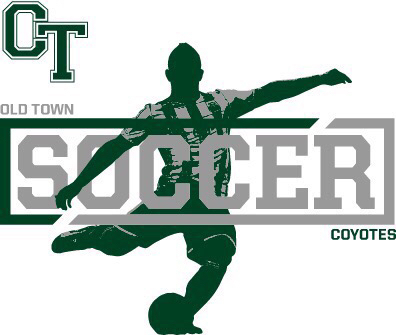 Congratulations to all the OTHS students who take the time to showcase our Coyote Pride! 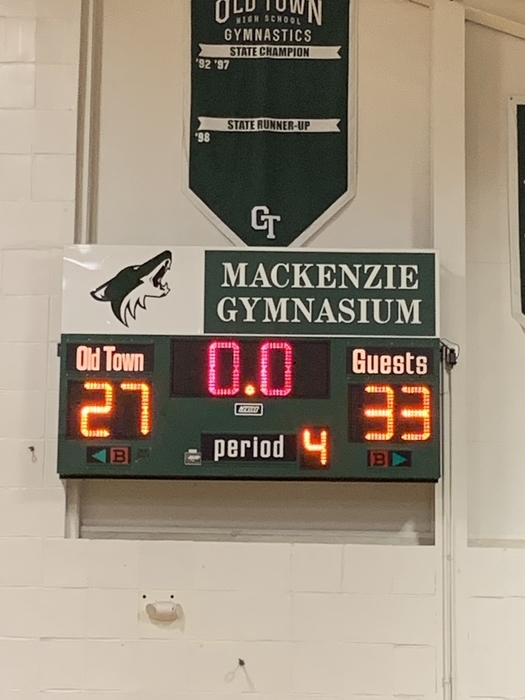 Unified Basketball at Mackenzie Gym v. ELL - still one of the greatest games to watch - Coyotes lost in the last seconds 72-74 as an unselfish act by C. Colson rebounding and giving the ball back to ELL unified player to score the go ahead points! Sometimes it not about the win! 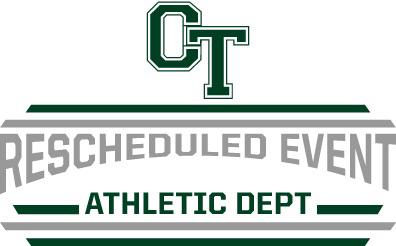 Boys basketball - This afternoon's team meeting is postponed.Rm 114 Thursday February 14th at 3:00 pm. 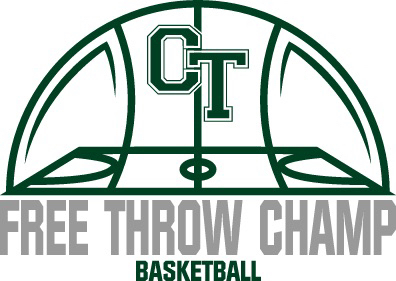 Please bring all your basketball uniforms.There will be a meeting, after uniform collection, for all returning (2019-2020) players. We will be finished by 4:00 pm. 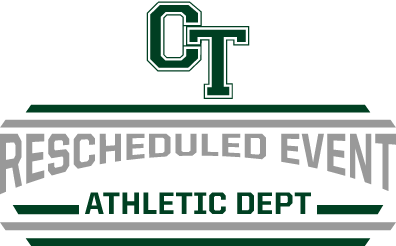 OTO hockey Update - Varsity is canceled for Wednesday, rescheduled for Thursday, 2/14 8 PM - OTO JV is canceled, makeup date is TBA! 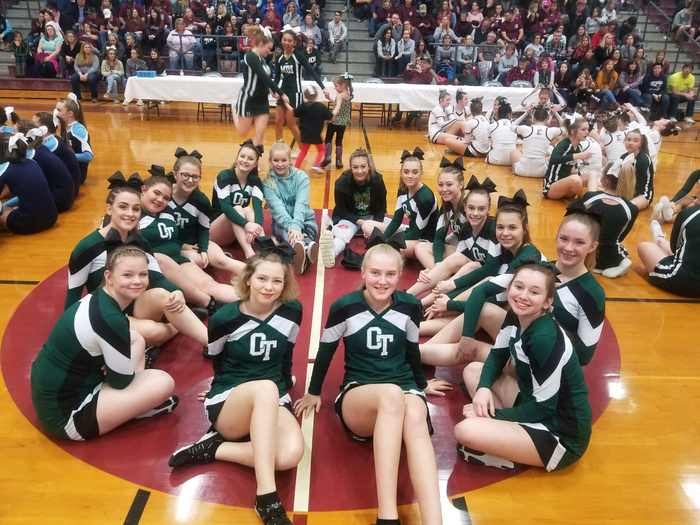 Final scores of the championship weekend are in - Congratulations to the OT Girls Swim team on the 6th place finish at PVC Swim/Dive Meet - state meet is up next for the state qualifiers! 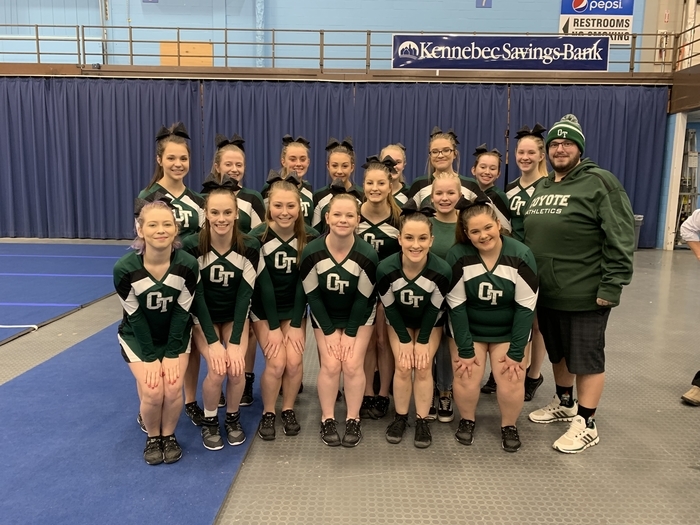 PVC-EMITL Large School Championship Meet today at U. Maine, the boys team finished 3rd behind Hampden and Bangor and the girls team finished 6th in their meet. Audree O'Meara and Benjamin Francis where awarded the girls and boys large school Clerk's Sportsmanship Award. 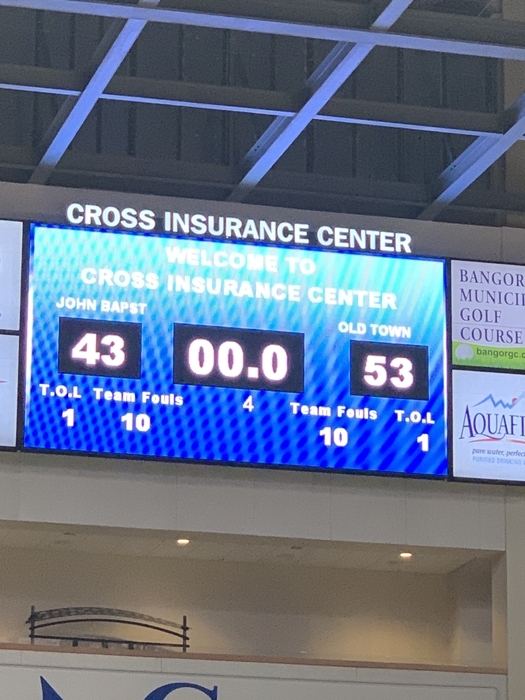 You are looking at the 4th best Class B team in the state of Maine! Very proud of these girls for the hurtles they overcame and for the team they have become. Congratulations girls, well deserved! 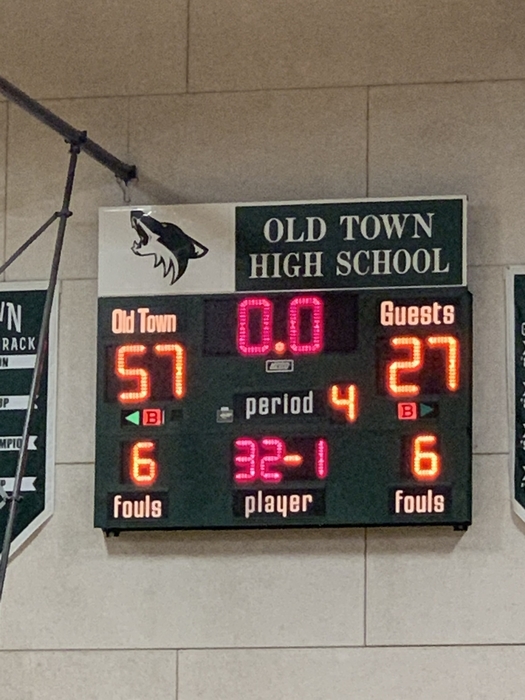 JV Basketball with two solid wins at Brewer today, great way to finish the season! 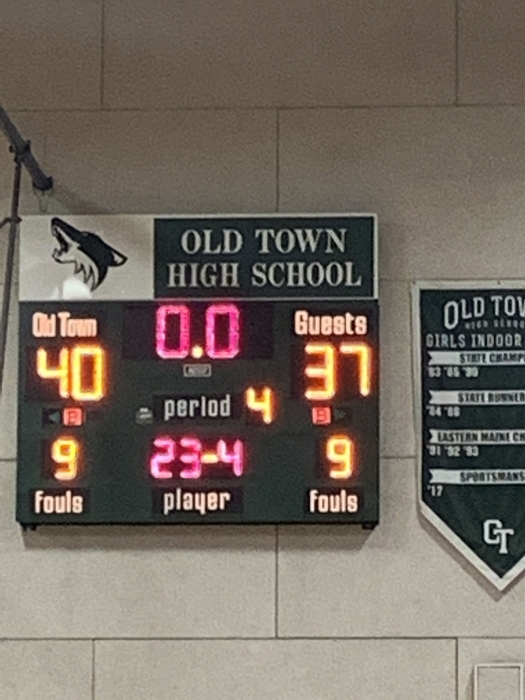 - Girls JV with a 40-34, Boys pulled a buzzer beating win 45-44 win... thank you to the coaches and players on a great year. 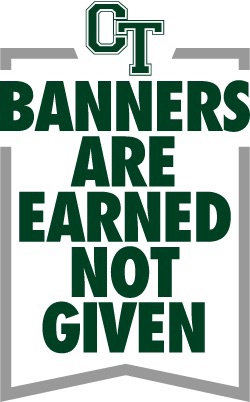 Good Luck to the 100’s of OTHS Athletes competing in PVC/State Championships and regular season events this weekend! Congratulations to the OT Boys Swim team on the 5th place finish at PVC Swim/Dive Meet - state meet is up next for the state qualifiers! 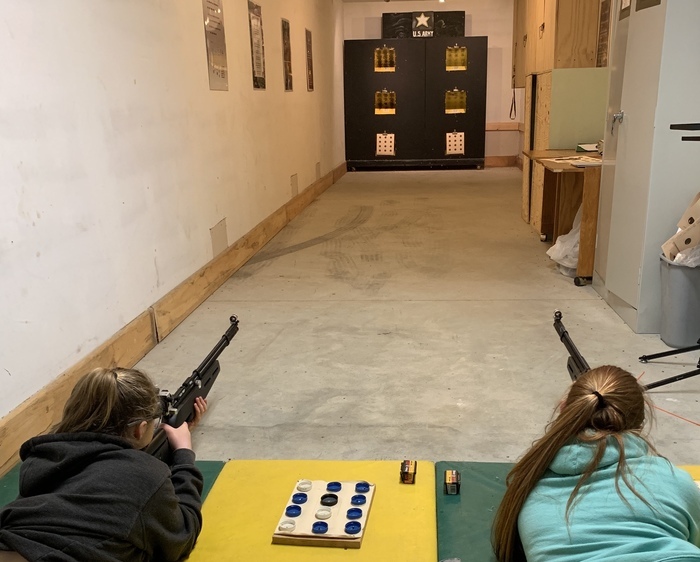 OT JROTC Range, Meghan H. and Kandice R. practicing for marksmanship competition and qualification! 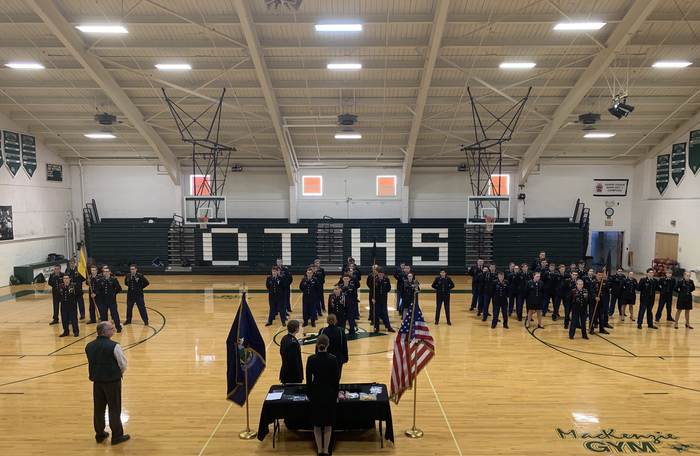 We have the great luxury of hosting a range and a program such as JROTC at OTHS! 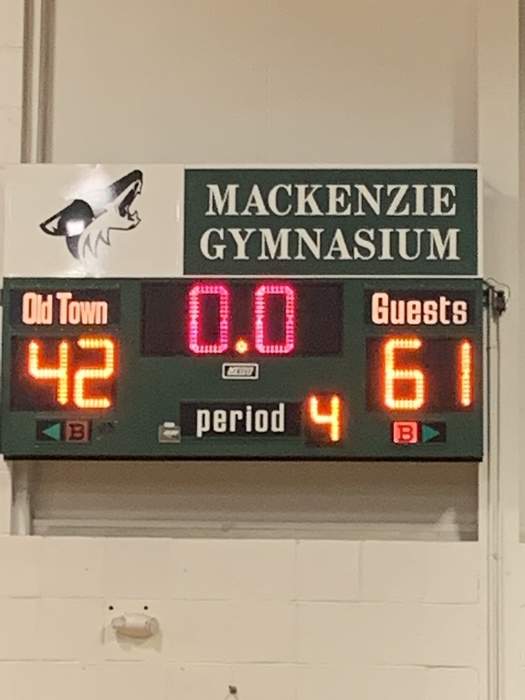 Senior Week Continues with Boys Basketball tonight v. The Red Riots - Boys Varsity lost 61-42 - JV with a nail biter come back win 41-40 - thank you to all the seniors in our boys basketball, cheering, and pep band section, You make Coyote nation proud! 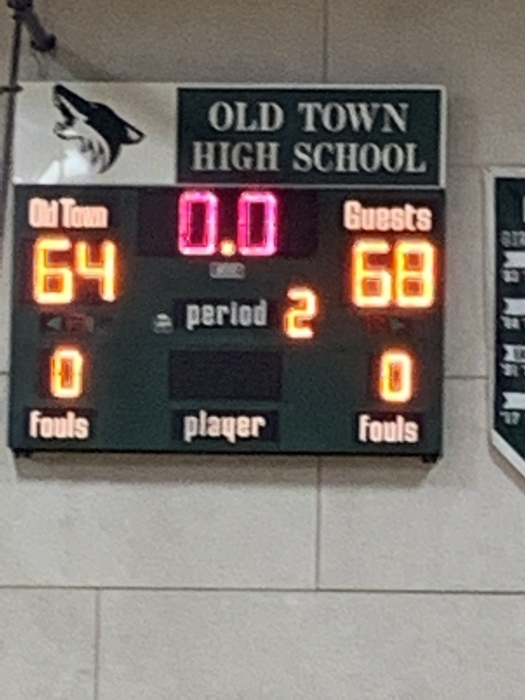 Senior Week Continued tonight with the OT Girls Basketball program hosting Orono... 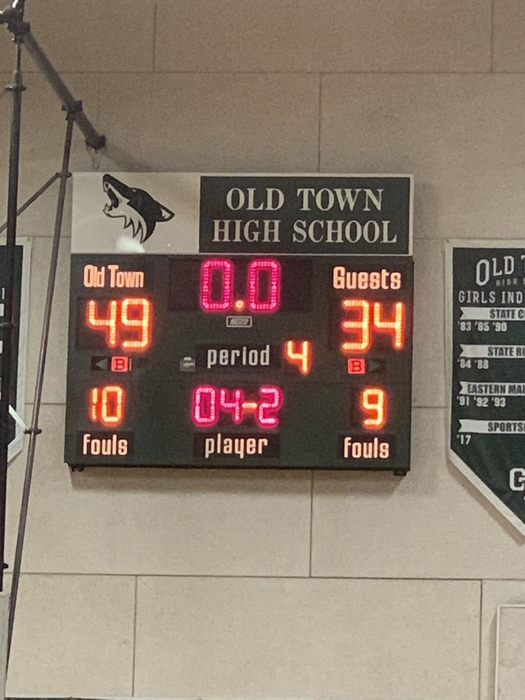 Girls won 49-34, placing them in 4th in the heals - Thank you to the Senior members for the time with the program and dedication to improving women’s basketball at OT! 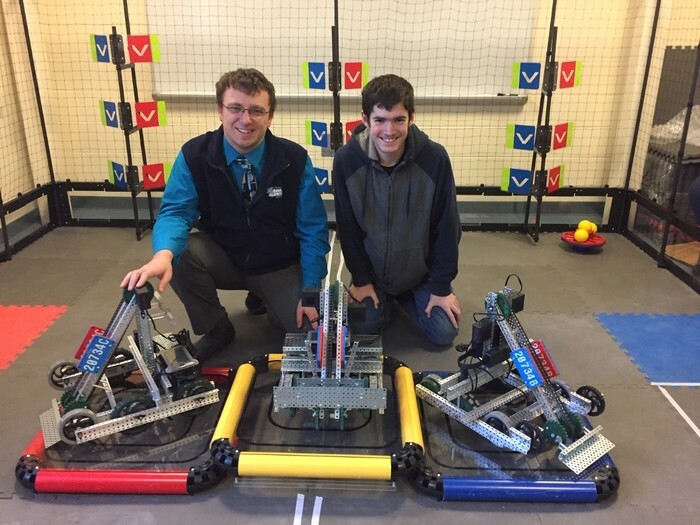 Robotics coach Justin Lewin (left) poses with team member Alex Wilson (right) with the three robots the team built for this year’s VEX robotics competitions. Alex’s robot, center, ranked 5th place at the John Bapst VRC Tournament on January 26th. 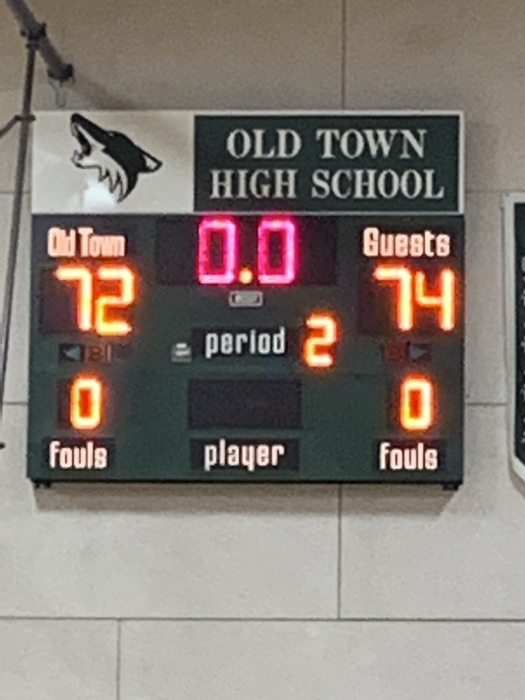 Unified Basketball playing at MA in Lincoln - MA squeezed out a victory 77-76 - the winning basket was made with 1 second left! 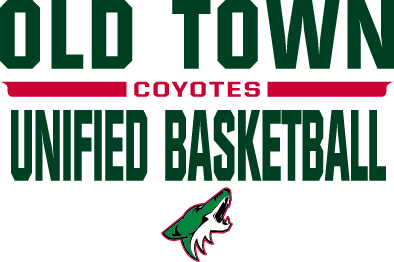 Home opener for Coyote U on Thursday 4 PM v Orono - come out and support your Coyote U Basketball! Teammates on the court, teammates in the classroom. 9th graders learning to solder so they can build sensors to deploy in the research forest behind OTHS. There are three ways to get to the menus on our web site: If you haven’t already done so, download the app. - Pick your school (a drop down list will appear when you choose the building in the top right corner). - Go to “Dining” and scroll down through the days. 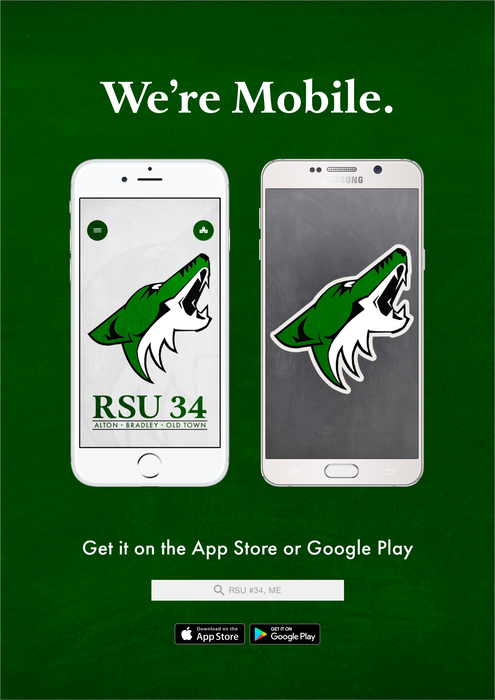 You can also get a printable menu when you choose the “RSU 34” site and click on “Food Service”, or You can go to “Sites” - choose RSU #34, - click on “Menu” and - choose “Documents”. - In the “Food Service Folder” you will find “Menus” and you can see all current lunch menus in there. 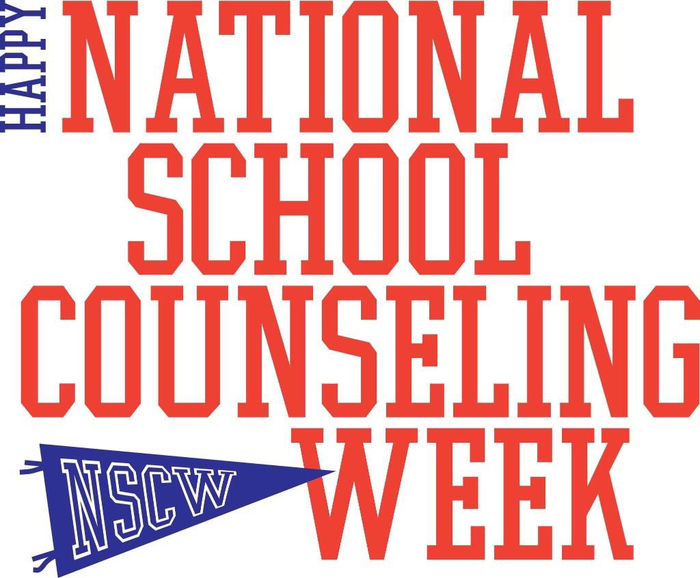 Make sure to stop in and thank your school councilors this week! 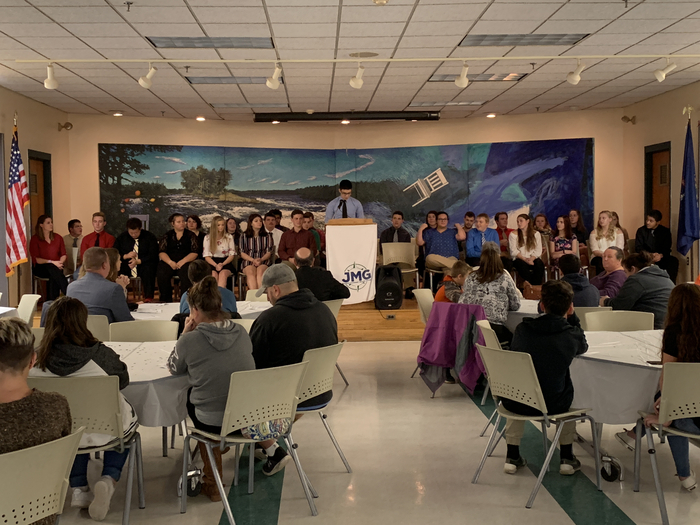 Thank you to all the school councilor in RSU34, a special thank you to OTHS School Councilors Kim Ketch and Jami Martel! - thank you for what you do for our students! 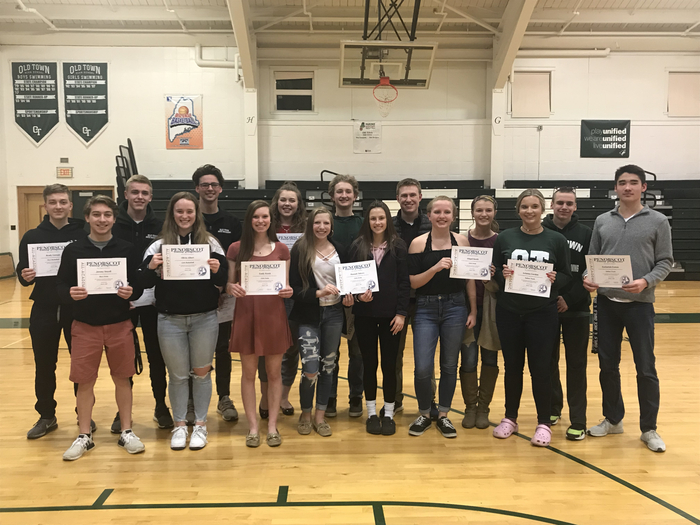 The girls and boys OT Indoor Track teams finished off the regular season with strong 2nd place finishes today in their eight team meets at U. Maine - Onto to PVC and States for the Coyote Track Teams! 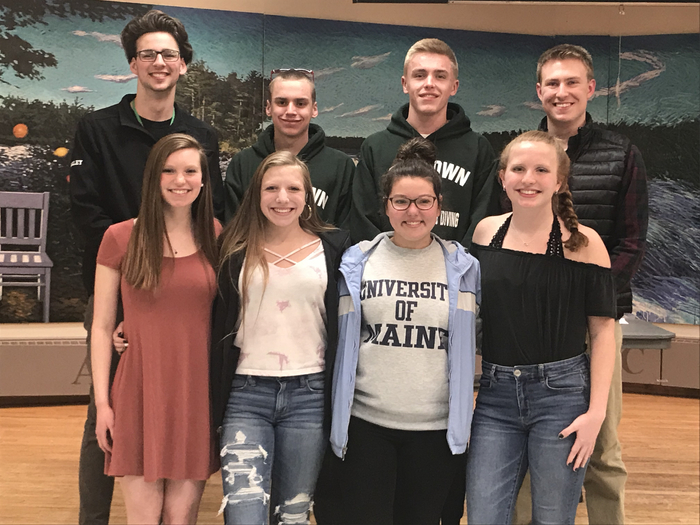 First of many Senior nights is tonight as OT Swim takes on Bangor HS - thank you to the years of dedication and service to our swim program Seniors... and good luck in the future! 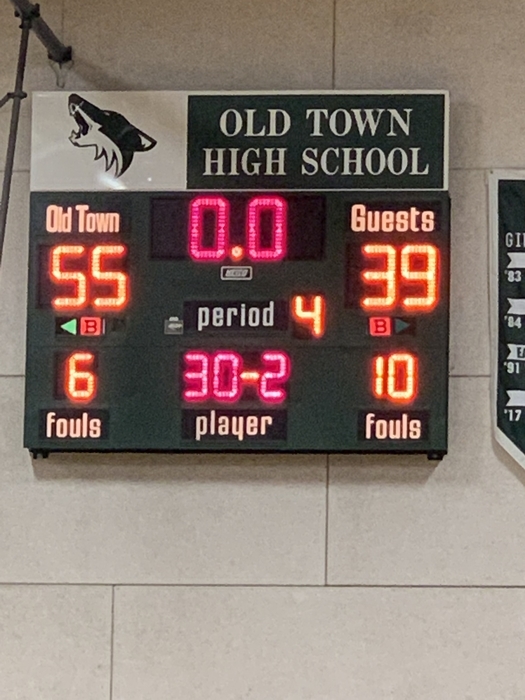 Boys Basketball on the road with TWIN Wins - JV winning 52-51 and Varsity closing a 16pt gap to win 52-51 @ WA - great road win boys! 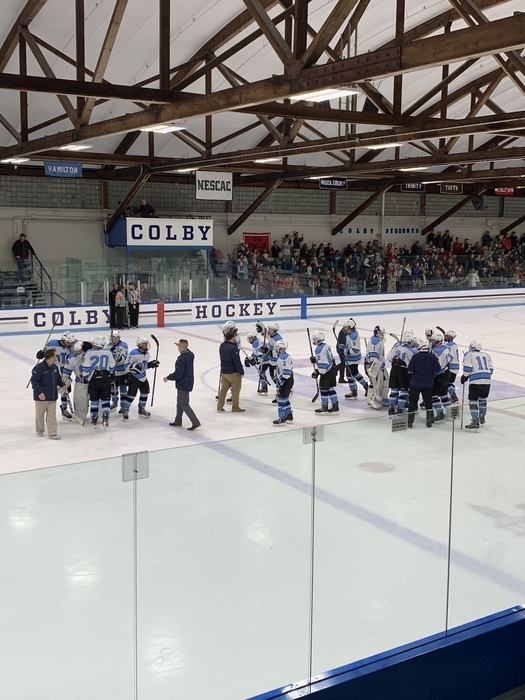 OTO Hockey with a solid win tonight v. HA Hockey tonight - Black Bears move to 11-1 with the 6-3 win tonight - Big game for the Black Bears on Saturday as they host Portland 4PM at the Alfond! 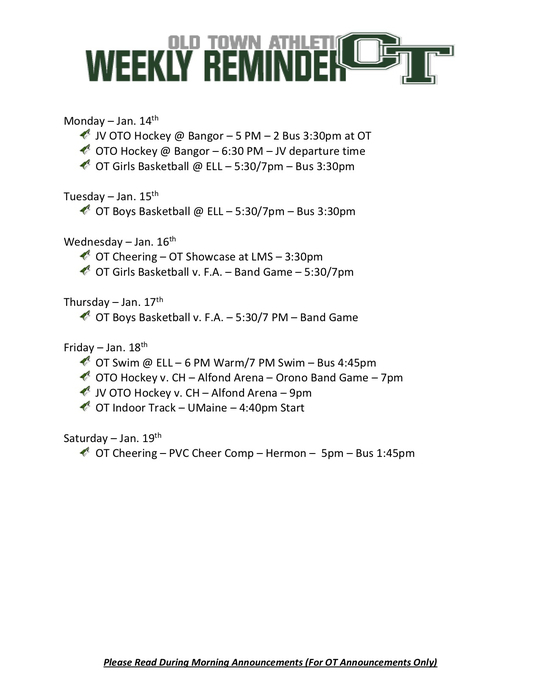 OTO Hockey still on for today - 7PM Varsity/ 9PM JV v. H.A. 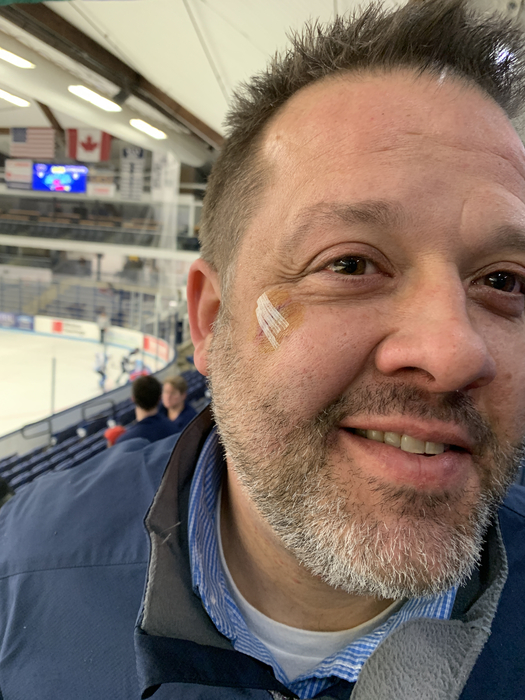 - OT Band Game tonight - See everyone at the Alfond! Today, Jan. 30, 2019, no school for RSU34 due to weather. Stay Safe! Schools are closed today Wednesday January 30, 2019 in RSU #34 Alton, Bradley and Old Town. 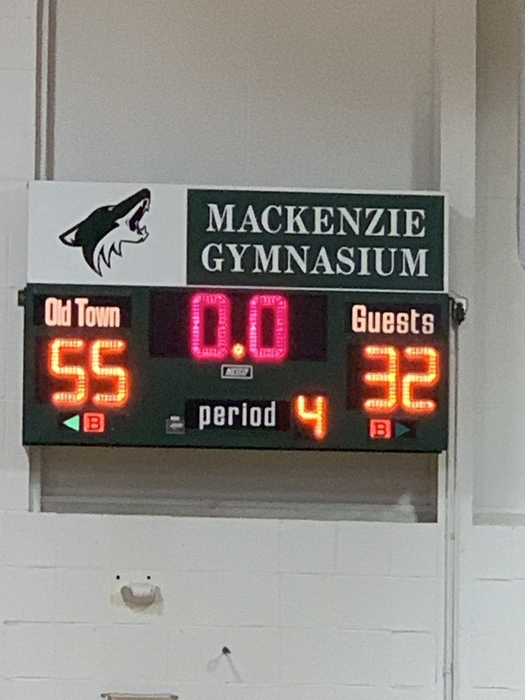 OT Girls BBall on the road at W.A. tonight... 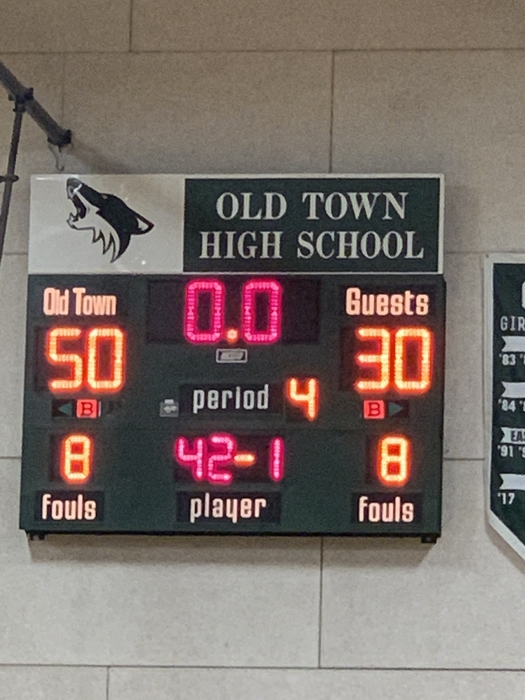 Varsity won 67-39, JV won 40-30. 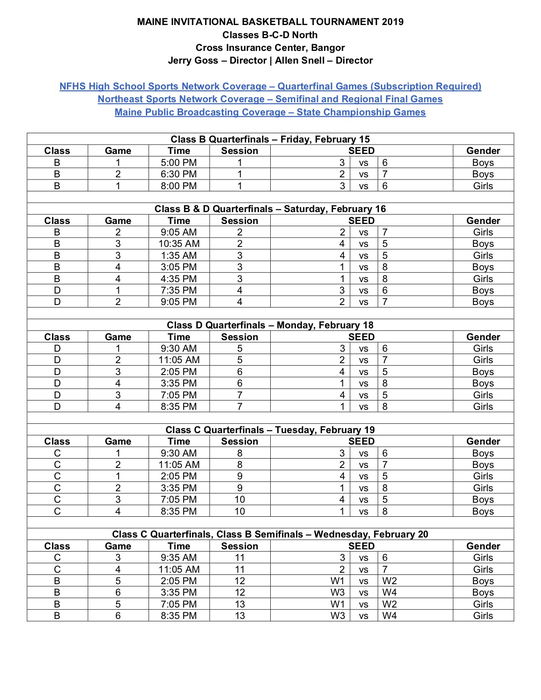 Varsity only on Thursday at 6 PM v. MV - Girls are sitting at 3 in heal points currently. 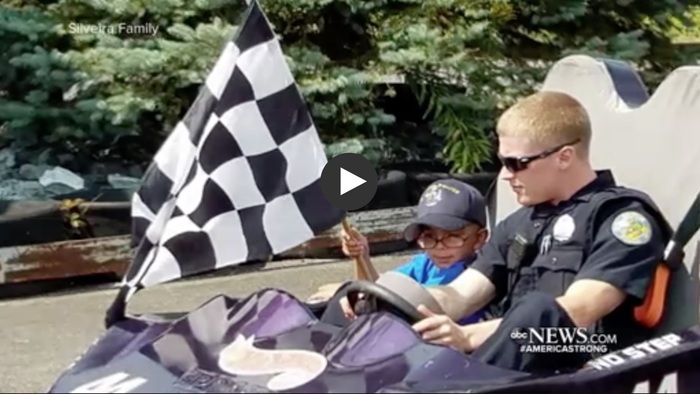 Positive Post - The embodiment of bravery, ambition, and strength! 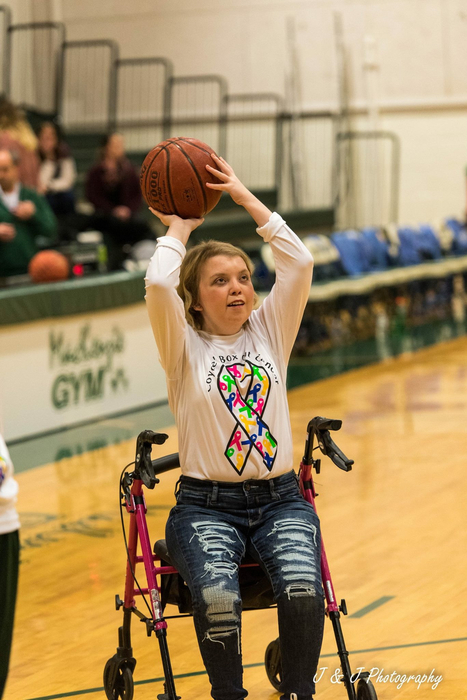 OT Strong is Gabby Strong! 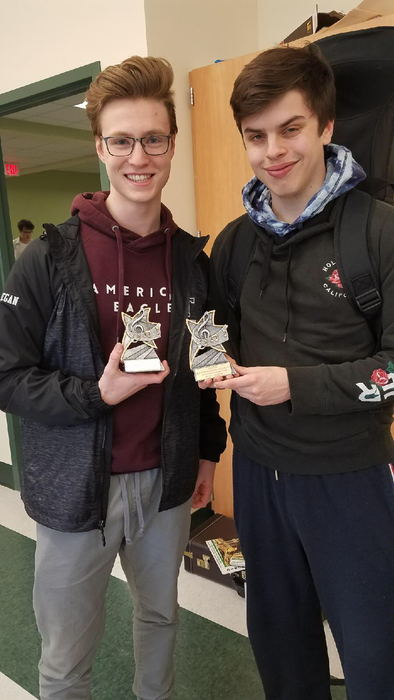 After equipment delays & a short time to build robots, the robotics team competed in its 1st comp this weekend - The Francis/Wilson team placed 5th, Wickett/Pinto/Phillips team placed 14th, Bishop/Letourneau team placed 18th out of 27 robots! Great showing for a short prep time! 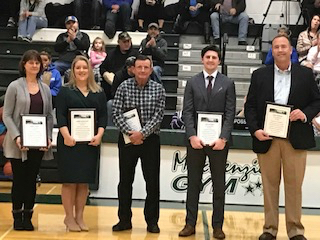 Congrats to the Class of 2019 Athletic Hall of Fame Inductees! Inductee Casey Costigan, Joe Cyr, Jarret Lukas, Debbie Godsoe-Rand & Jake Leithiser, welcome! Because of anticipated icy conditions, OTO morning practices are canceled - sleep in a little boys and girls - you deserve it! See our Sideline Stores for new design options! 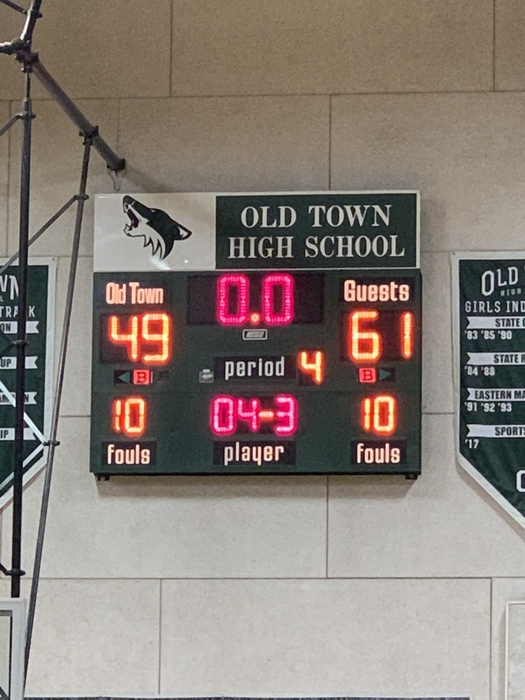 Couple of losses tonight for the OT Basketball Varsity programs v. MDI.... 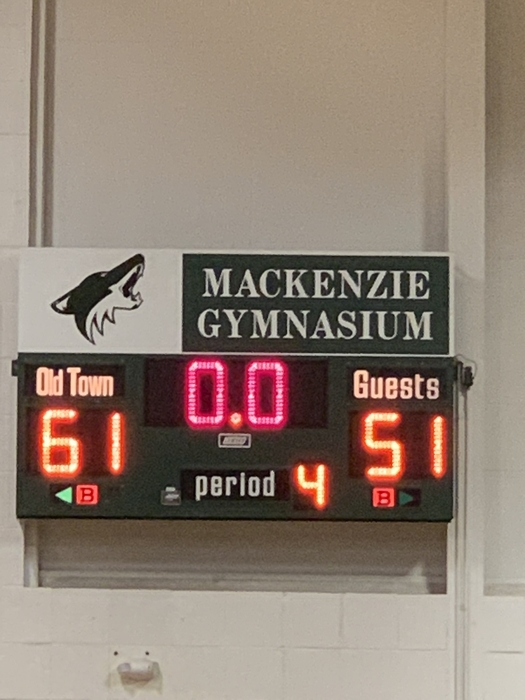 Girls lost 54-49.... 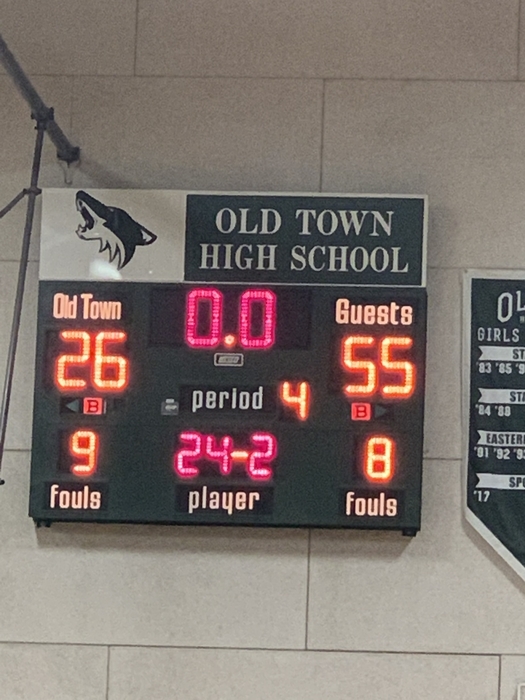 Boys lost 68-57... Next games are Girls on Friday v Hermon, Boys Saturday v Hermon (Athletic Hall of Fame Night) - these are also OT Basketballs Cancer Awareness Games! 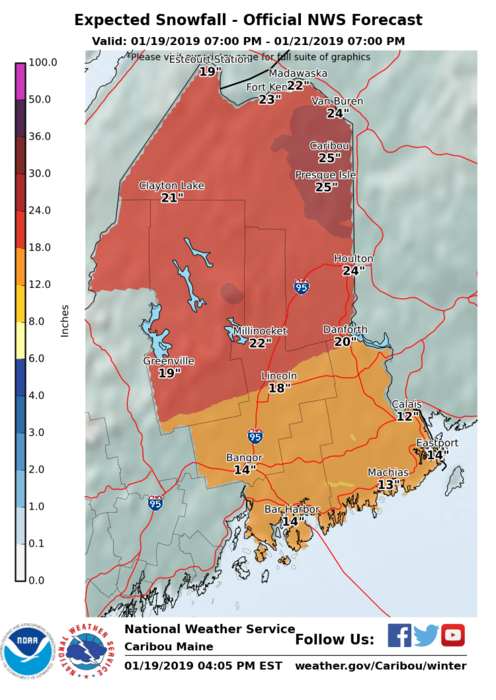 Significant snow predicted for most of Maine! 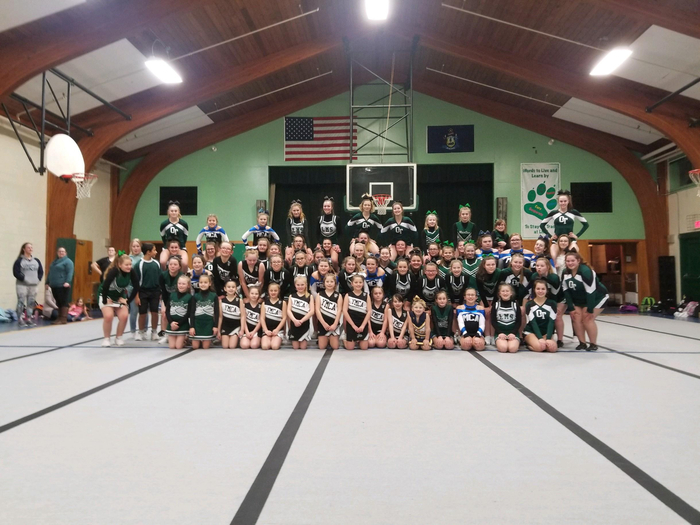 OT Competition Cheer in action at Hermon for the PVC Cheer Comp. 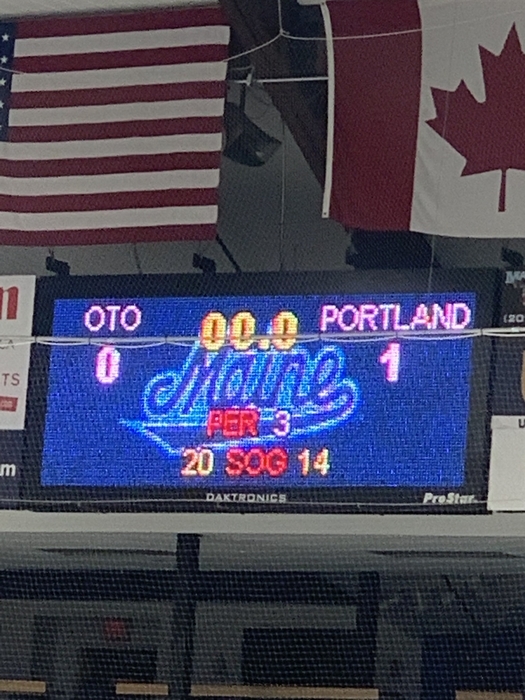 OT score went up by a lot and they performed a solid energetic routine!!!! OT finished 3rd and was definitely a crowd favorite! 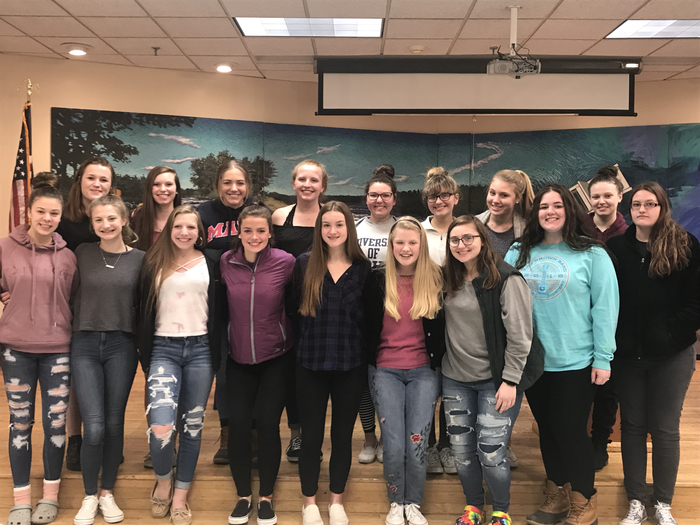 2019 Prom Committee News! 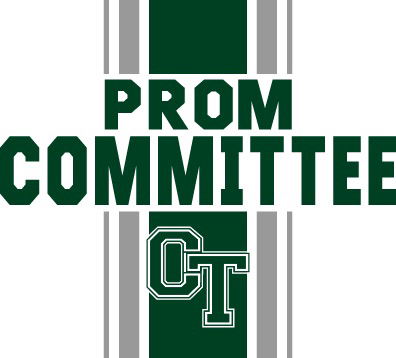 Looking for Senior Parents and Students to join the 2019 prom committee. First meeting will be Thursday, Jan 24th at 3PM in room 107. Please come with theme and other ideas for this year prom! 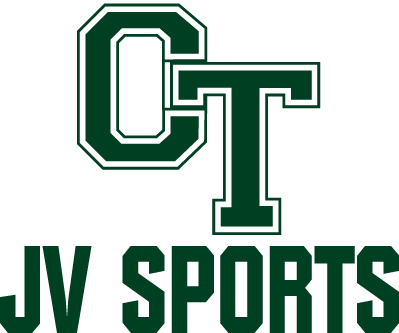 Due to weather over the weekend - We have currently changed the start times for Monday, Jan. 21st Basketball Games to the following - GJV 2PM, GV 3:30PM, BJV 5PM, BV 6:30 PM - more information to come! 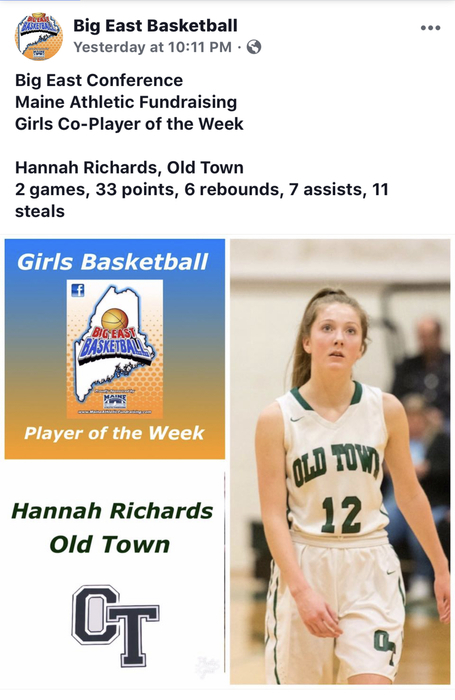 Congratulations Hannah Richards - Big East Basketball player of the week! OT Comp. 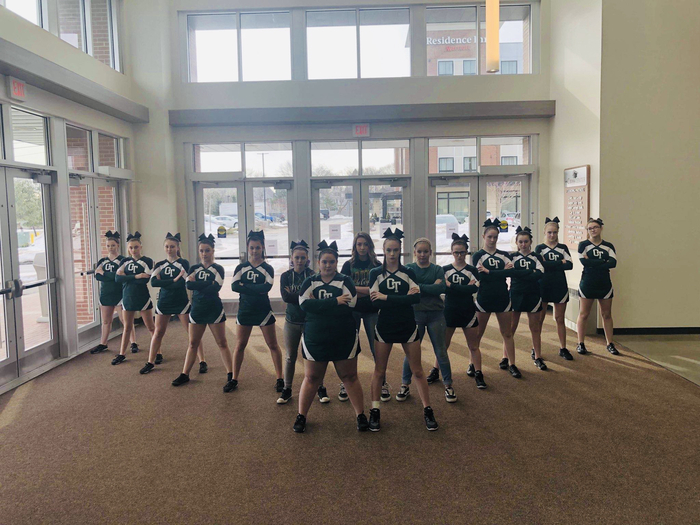 Cheer team hosting a Cheer Showcase Jamboree at LMS today - they raised $291 dollars and decided to help out the street family with costs associated with his care! 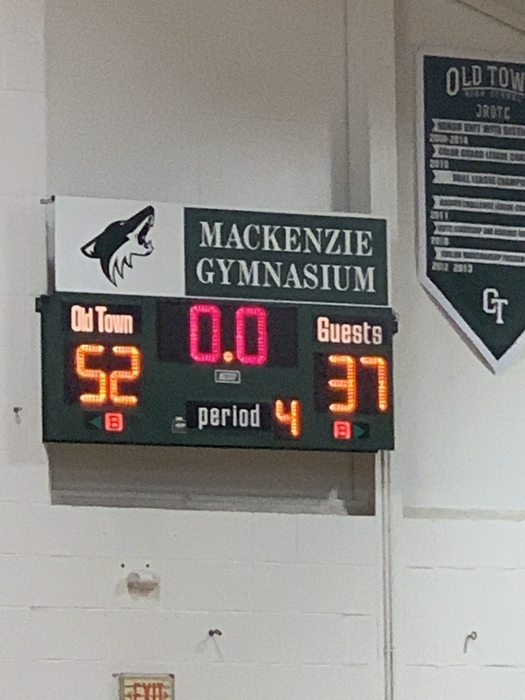 Way to be OT Cheer! Positive Post Tuesday! The bond between coaches and student-athlete is a strong one, some could say it’s as strong as family. 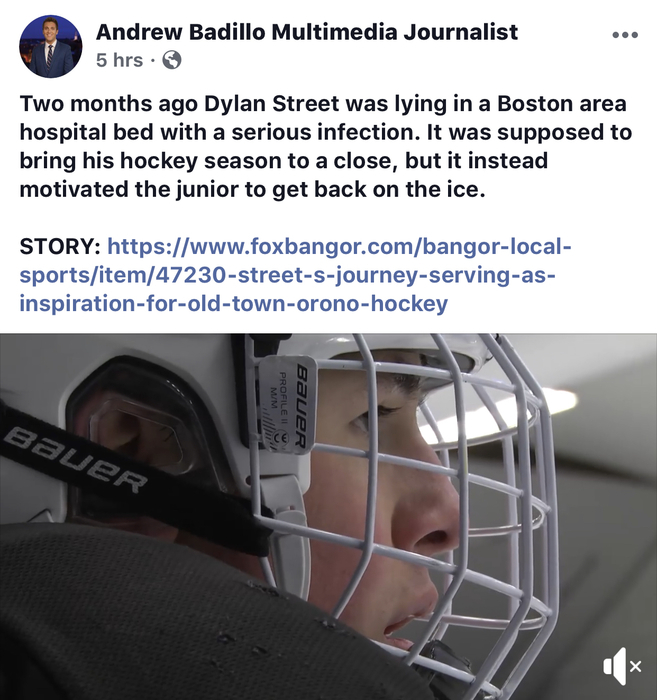 This was proven today when Coach Goody, Thurlow, Thibodeau traveled to Boston to check up on OT student-athlete D. Street as he recovers from emergency surgury at Boston Children’s Hospital.... OT and Orono communities are pulling for your fast recovery Dylan! 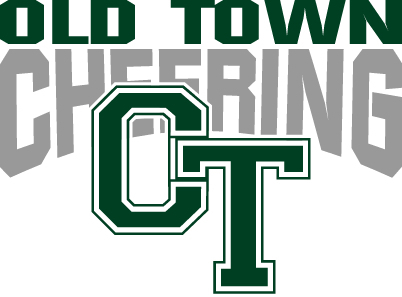 OT Cheer showcase on Wednesday, Jan. 16 at LMS will be open to the public and start at 5:30pm. 5 local teams will perform. $2 suggested donation to be donated to a local charity. OT Cheer at the Big East Comp. in ELL - good finish for the girls finishing 4th out of 12 - Girls hit the mats on Saturday PVC Comp at Hermon! 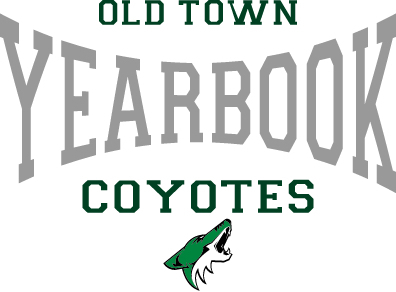 Good Morning – Last night, OTHS received information about a statement made by a student threatening the well-being of our students and our school. The statement was reported to the OTPD and we worked in conjunction with them to determine the credibility of the threat. The OTPD put a lot of time and effort into their investigation and has determined that there is no credible threat. 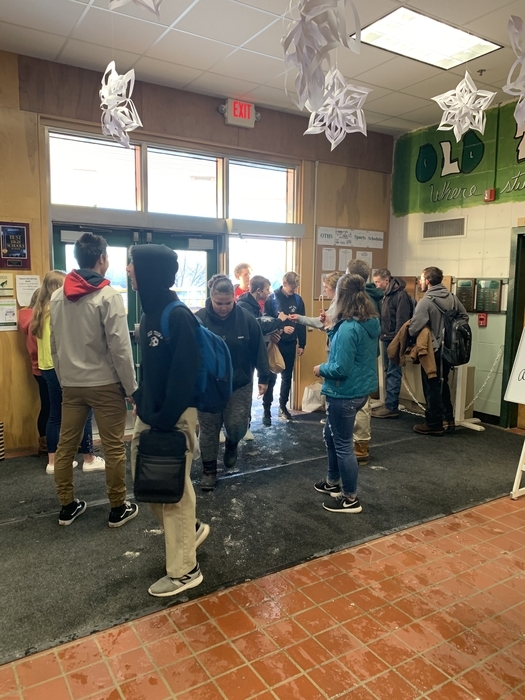 OTHS is open for the school day and all activities as normal. The safety of our students and our school is of the utmost important. The next parent meeting for Project Graduation will be Saturday, January 12 at 10 AM at the Elks Club. We are looking for help selling tickets for the Bell's IGA shopping spree on Saturday from 11 AM to 5 PM. Please contact Mr. Gordon if you or your student are available. 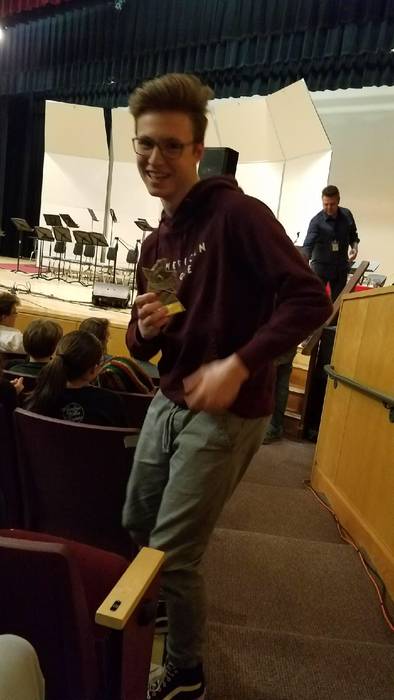 Congratulations to Chris Albert on winning the Northern Region Free Throw Tournament at MA on Sunday, he will now move onto the State Comp at the All-Star game and represent OT Basketball! PVC-EMITL Relay Meet today, boys team finished 3rd and the girls team finished 4th. 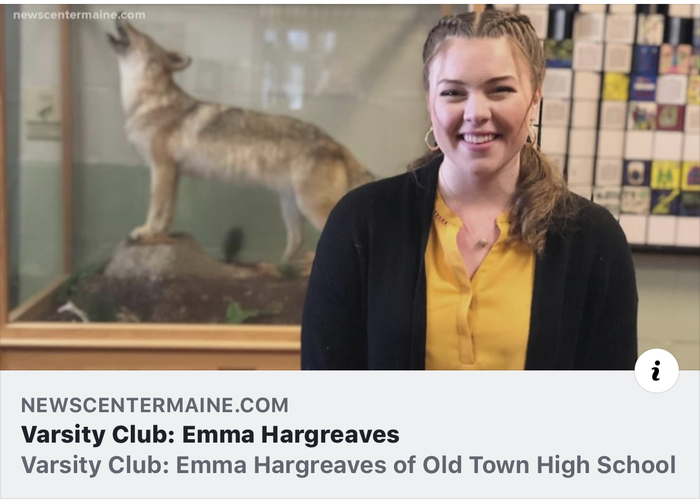 Individually, Emma Hargreaves broke her own school record in the Shot Put with a throw of 38' 5.25"! 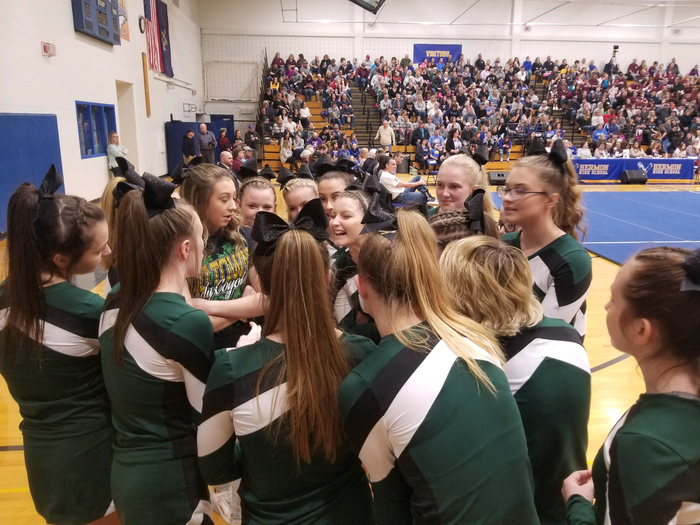 OT Cheer at H.A. 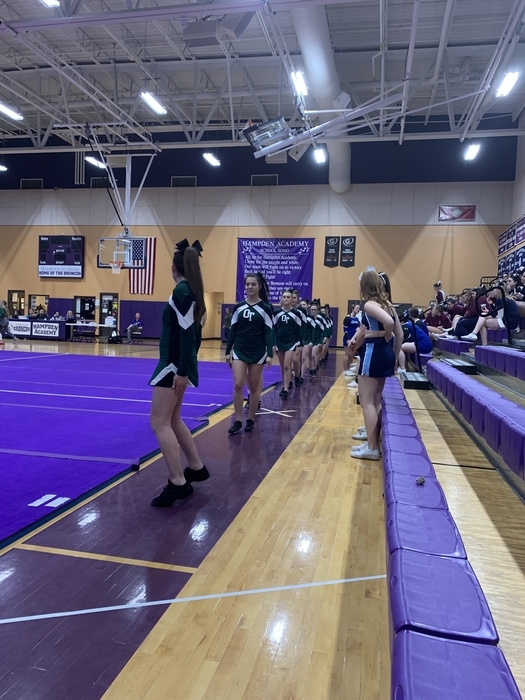 Competition and on the comp mat for the first time this year! These ladies are the definition of adversity, keep working hard and you will go far! Congratulations ladies! 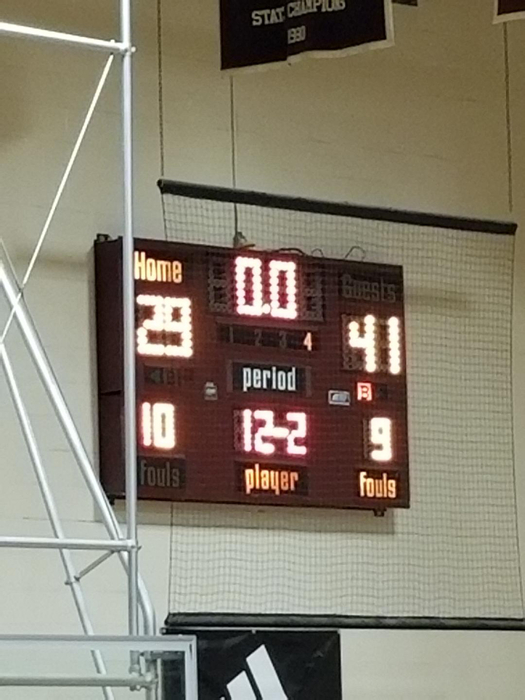 JV Girls in action at home against the Bangor Rams.... girls played a tough game and almost pulled a great win out... lost 27-33.... No make-up date yet for MV Varsity game. 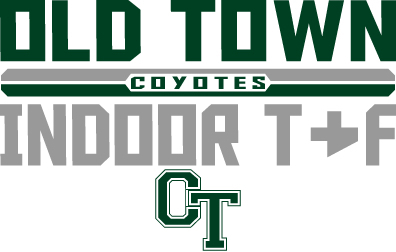 OT swim at Brewer - boys and girls swam a great meet, boys won 102-38, girls meet came down to the last heat 96-86 win for the Coyotes - Swim next meet is Fri 11th at GSA! 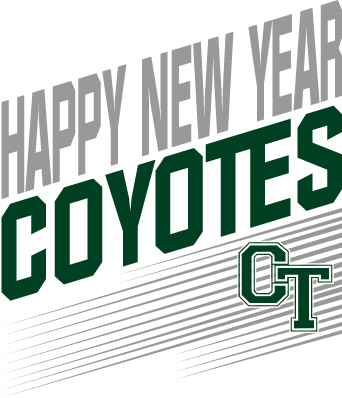 Thank you Coyote Nation for a great 2018! 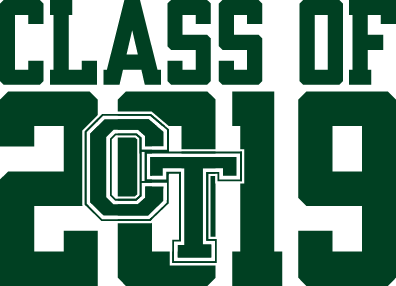 Here’s to a great 2019 - keep making OTHS great! OT Track and Field Action - Boys team finished first today ahead of Hermon, Brewer and five other schools - Girls team finished 3rd behind Brewer and John Bapst in their eight team meet. 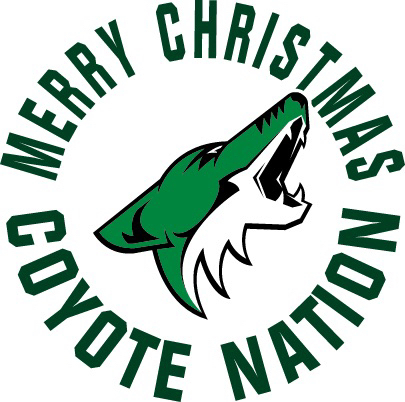 Happy Holidays OT Communities, from our Coyote Family to Yours! 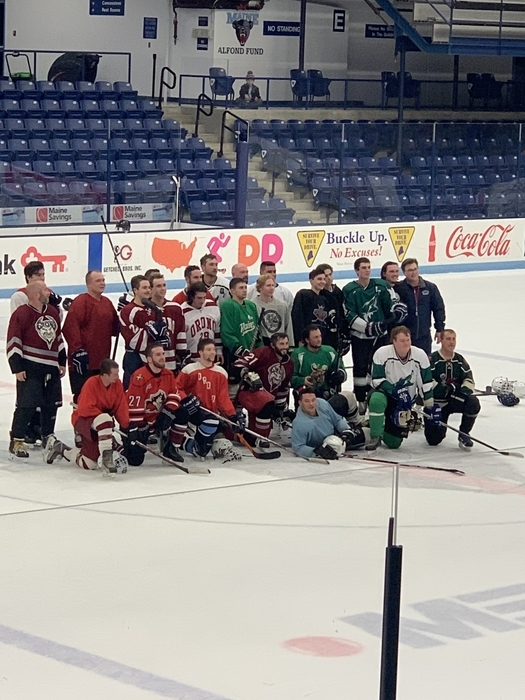 Last Athletic event for the night was the very entertaining OTO - Orono v. Old Town Alumni Hockey game! Thank you for all the support from OT and O alumni tonight! 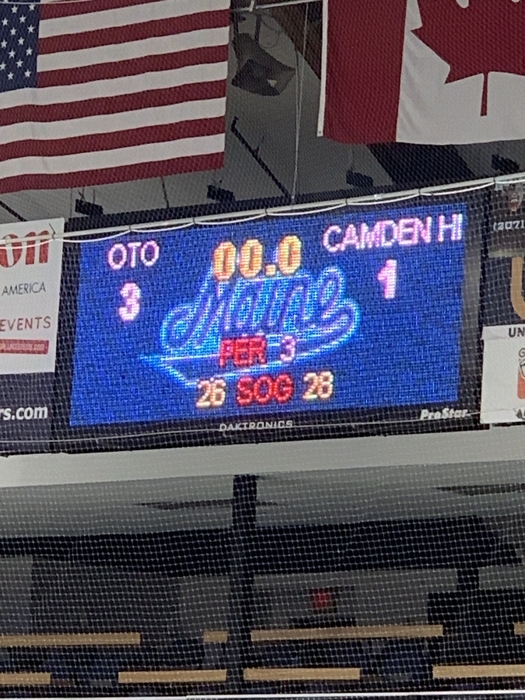 OTO black bears appreciate it! OT Indoor Track - Girls finished 3rd our of 8 and boys finished 2nd out of 7. Emma Hargreaves broke a 35 year old school record in the shot put and Liang-Kang Lin broke a 15 year old school record in the Long Jump - overall a stellar 1st meet for the Coyotes! OT Swim in action last night v. Orono... teams had a great meet against the river rivals- OT Boys 89-27 Orono, OT Girls 100-64 Orono - Swim teams on the road Jan 4th at Brewer! 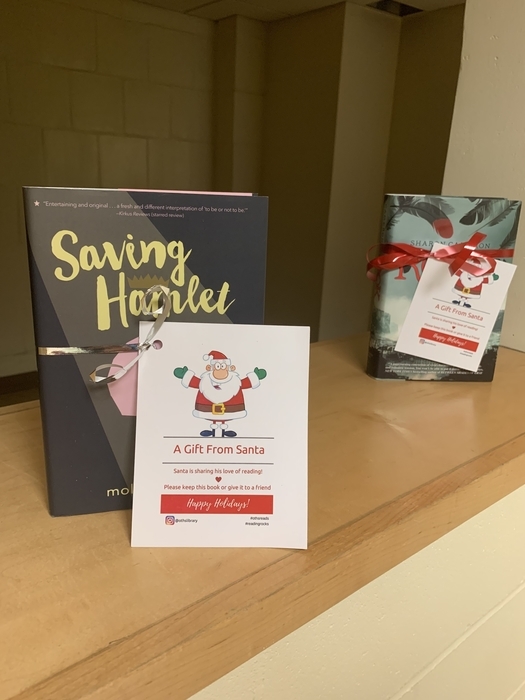 ‘‘Tis the season for giving, what better gift then that of a book. Mrs. Stone each year reaches into her own book collection to spread holiday cheer for students. The gift of a good book, the only request, pass it on when your done! 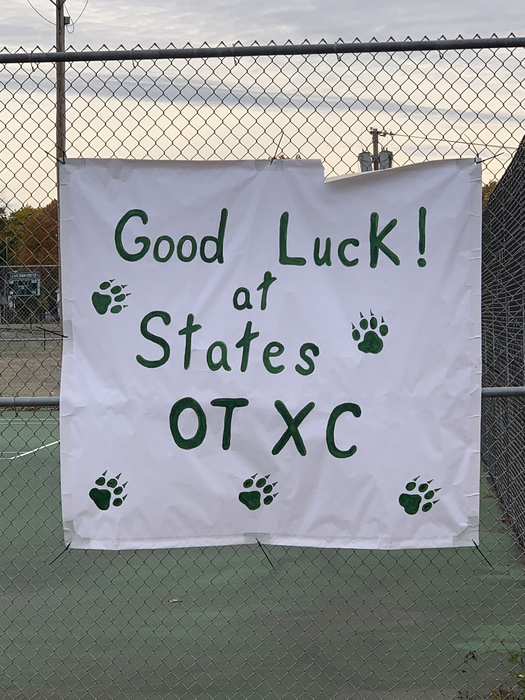 OTHS Thanks You Mrs. Stone! 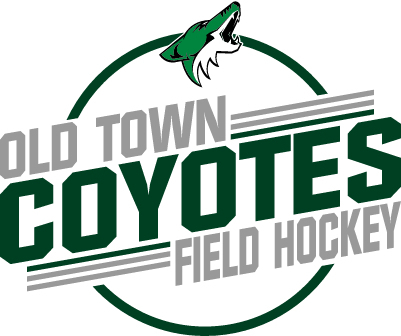 Coyotes across the river tonight at Orono, all 4 teams in action. 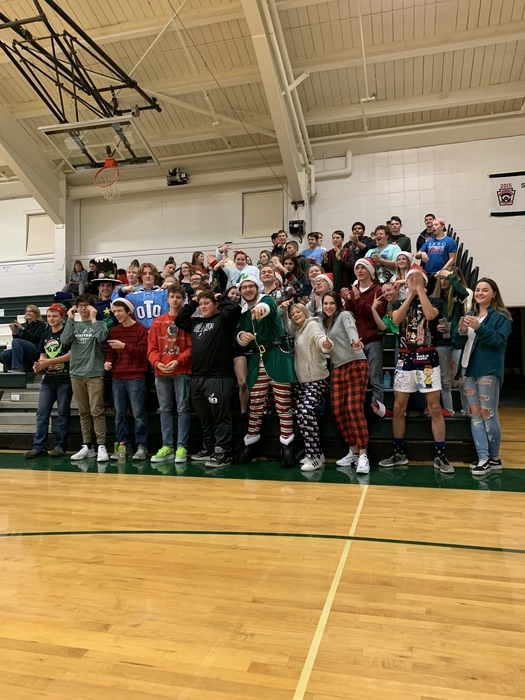 Both JV programs came away with victories v. the Red Riots - Varsity Girls with a 35-21 win over Orono - Boys went to triple overtime but fell 65-61 - All 4 teams are in action again on Saturday, starting at noon! Positive Post Thursday! Thank you OTHS Stu. Co. for spreading holiday cheer with Candy Canes and smiles for all OT students and staff! 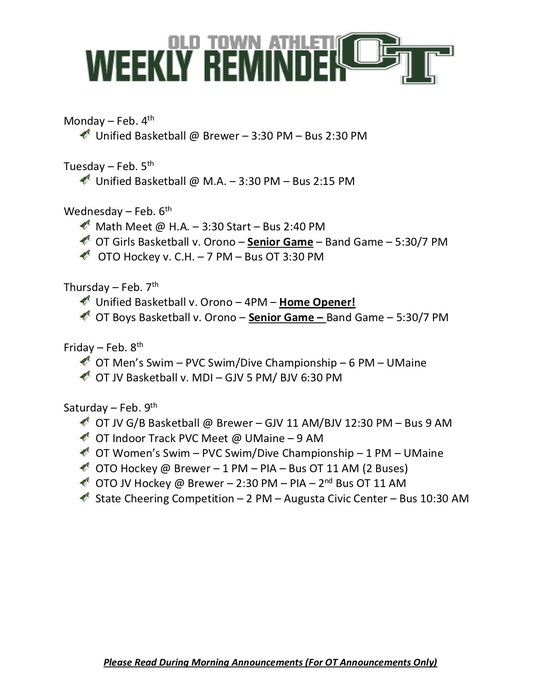 Attention OT community, if you happen to be around Friday, stop in to support OT Swim home v. Orono 6 PM start. While you are at the pool, pick up a great snack for a great cause from the OTHS Stu. 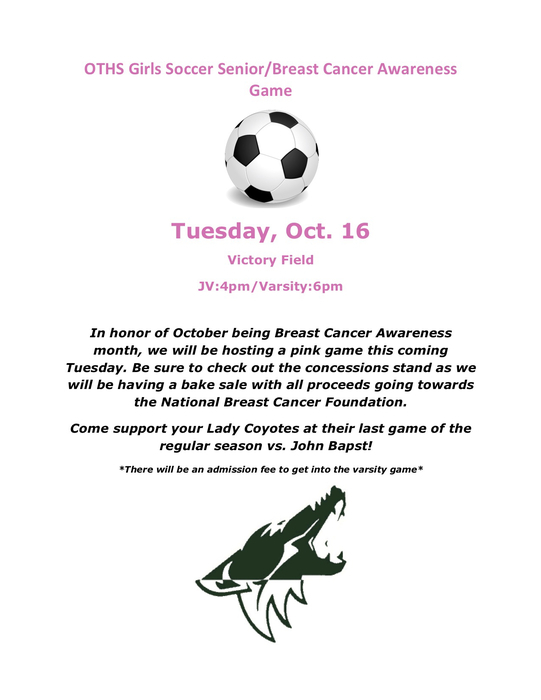 Co. as they will have concessions available! 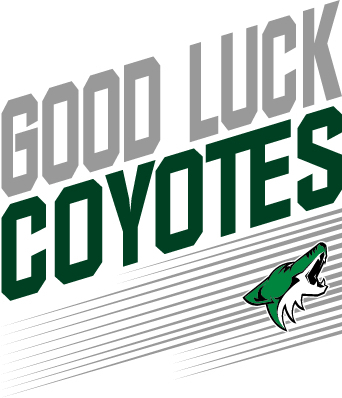 Goooo Coyotes! 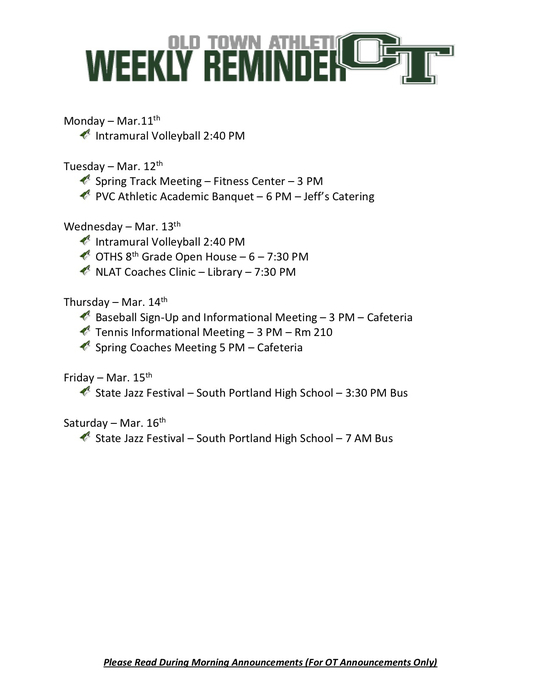 Are you in need of some academic help, are you on a athletic team, in a club, or involved in a extra-curricular, NHS is here to help. 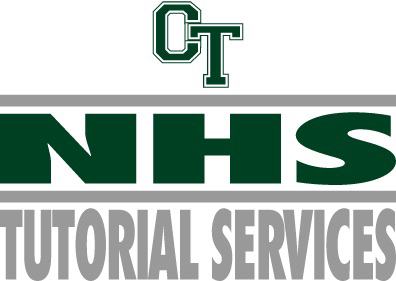 Tutoring services will be offered for students who are struggling with academics at OTHS - sign up in guidance to be paired with your NHS member! Today, Dec. 17th - No School in RSU34 due to weather - please be safe! 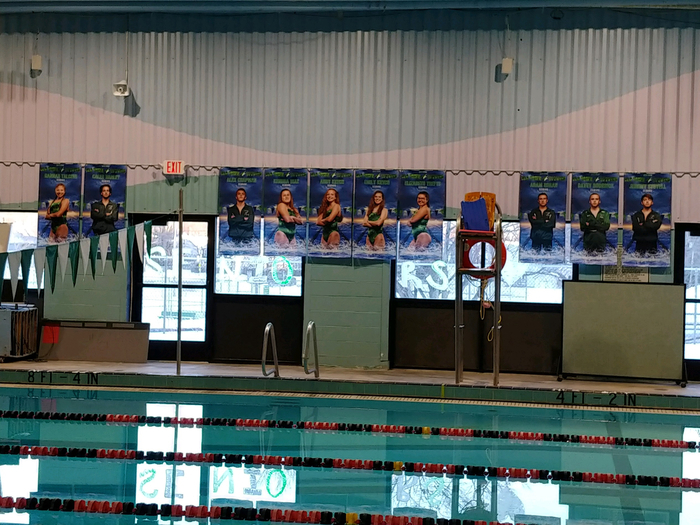 OT Swim hosting Carlisle Swim at the OT pool - Boys swim with a great win 102-30 and the lady swimmers with a 123-35 win over Carlisle.... OT swim home v. Orono next Friday before they go on the road for the next few weeks! 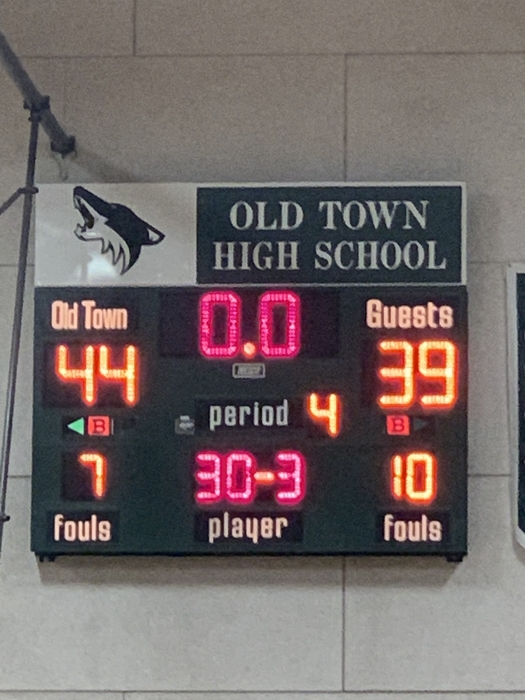 OT Girls and Boys basketball in action tonight v. MV - Girls Varsity pulled off a 32-22 win, JV followed up with a commanding 37-15 win - Boys basketball ran away with a good win 58-48, JV with a commanding win 51-33 - both teams are in action at the cross center next week! 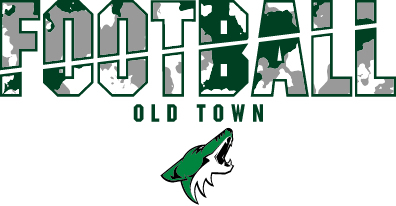 Love them or dislike them.... they are passionate about OTHS! - Holiday Theme Game! 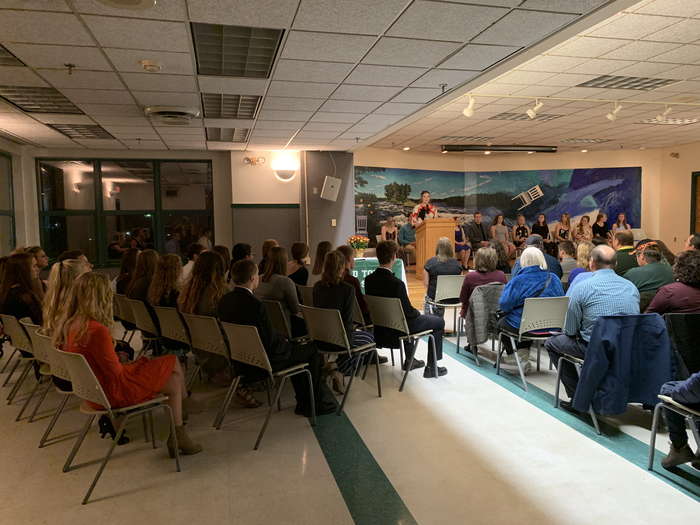 Positive Post Friday - Congratulations to all the JROTC members earning awards at the 2018 Fall Banquet - a job well done! Just a reminder about the Project Grad fundraiser tomorrow! Please share and help us get the word out! 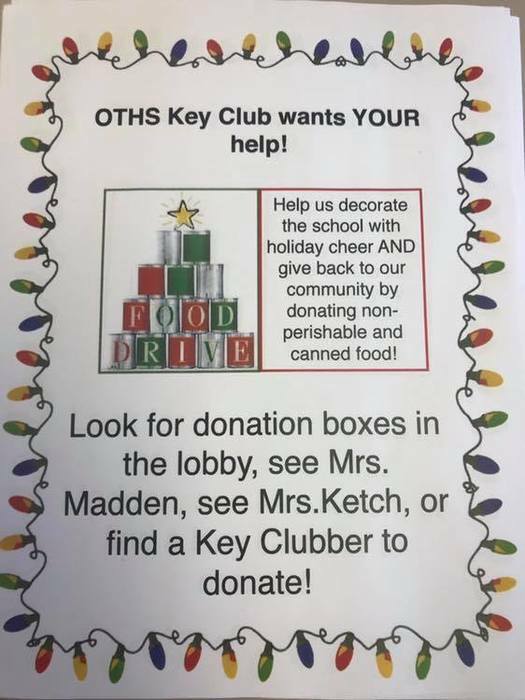 Please send in a non-perishable item and help out our key club! Positive Post! 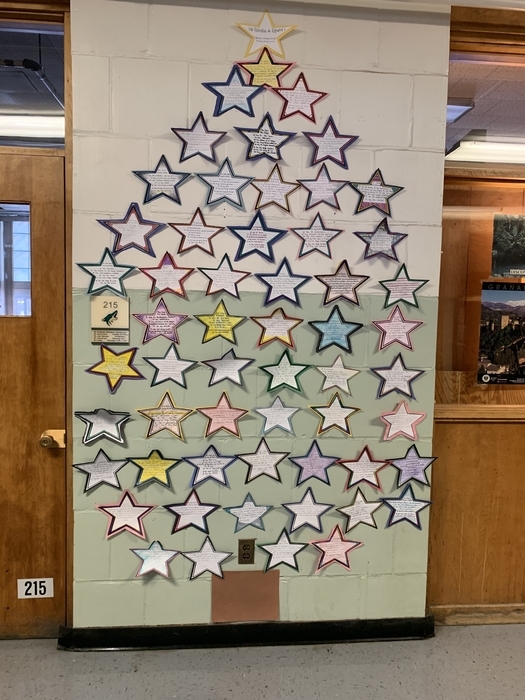 Mrs. Culina’s Spanish 1 class completed “Soy una Estrella” project... these paragraphs are about who they are designed in a holiday spirit! 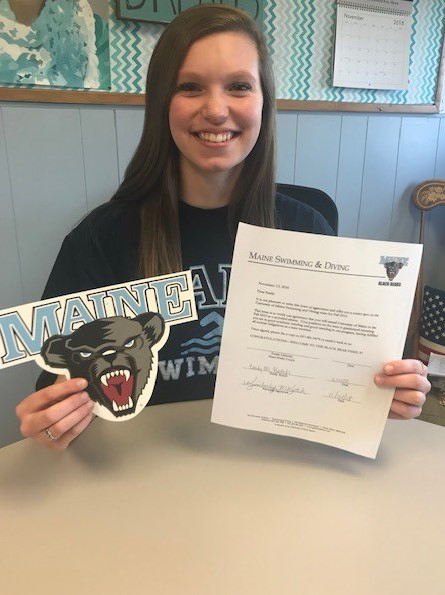 If you get a chance, congratulate Emily Ketch on signing her National Letter of Intent to Swim for University of Maine! We are proud of you and your accomplishments! 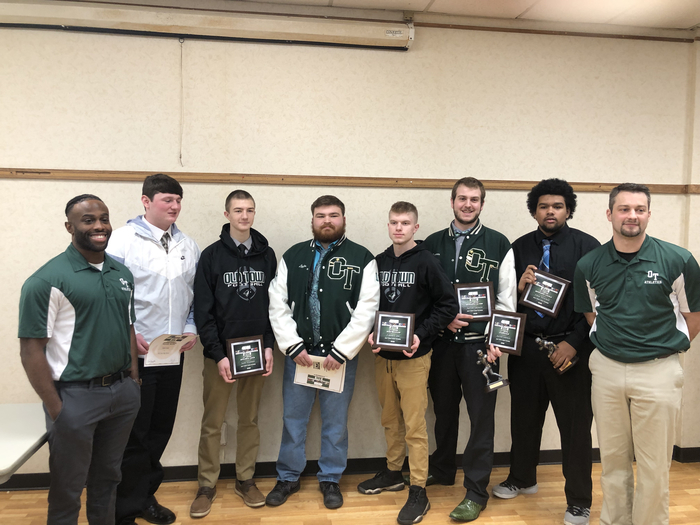 Congratulations to our OTHS football Seniors as they where recognized at the big 11 Football Banquet over the weekend. 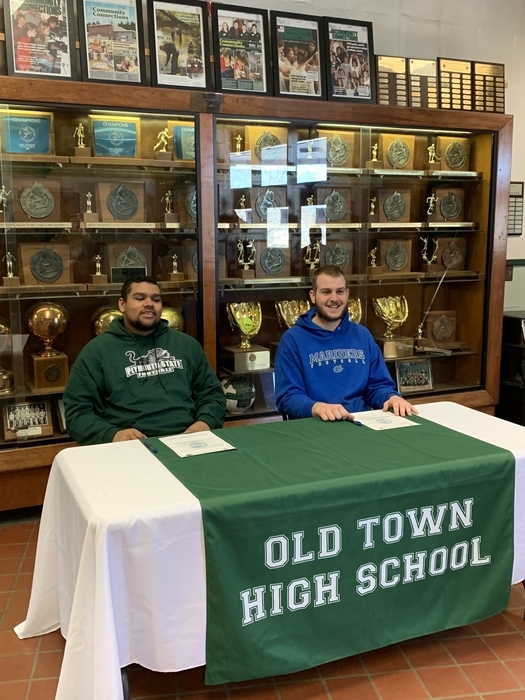 Dom Mitchell and Jared Spencer on being awarded $1000 dollar scholarships from the Coach Ken Libbey Memorial Scholarship Account. 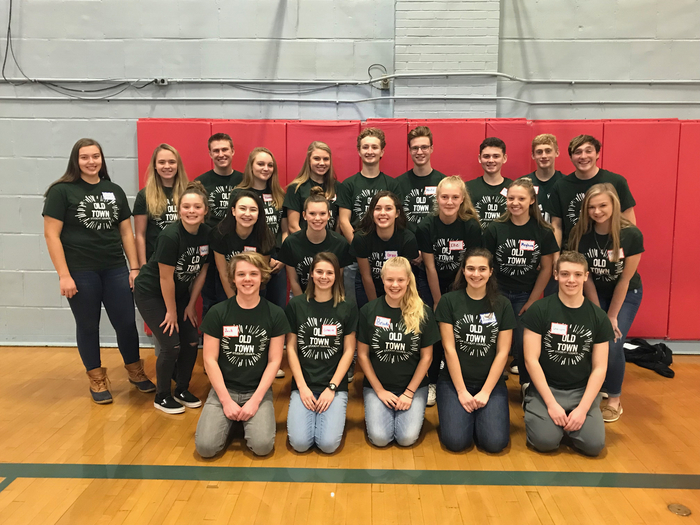 These special students had a great time representing OTHS at the 2018 Student Council Leadership Conference! 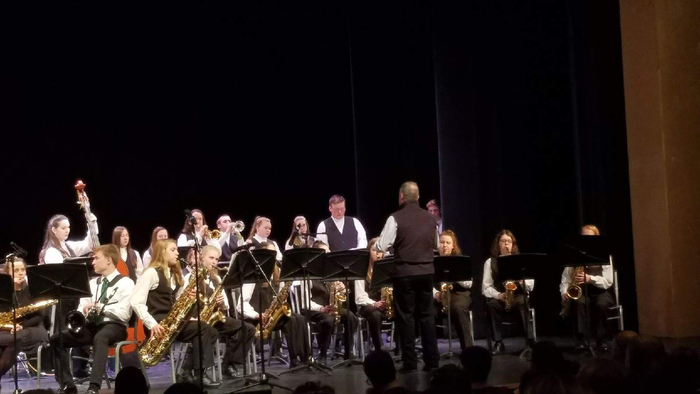 The Old Town High School Jazz Ensemble rocking Minsky Hall at UMaine with world famous composer & 1984 Old Town High School graduate Craig Skeffington! 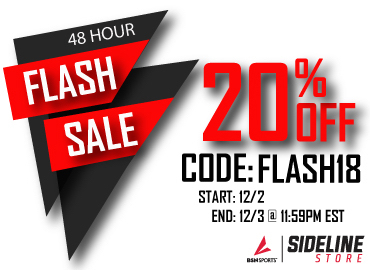 FLASH SALE - just in time for the holidays - visit our Coyote Sideline Store! 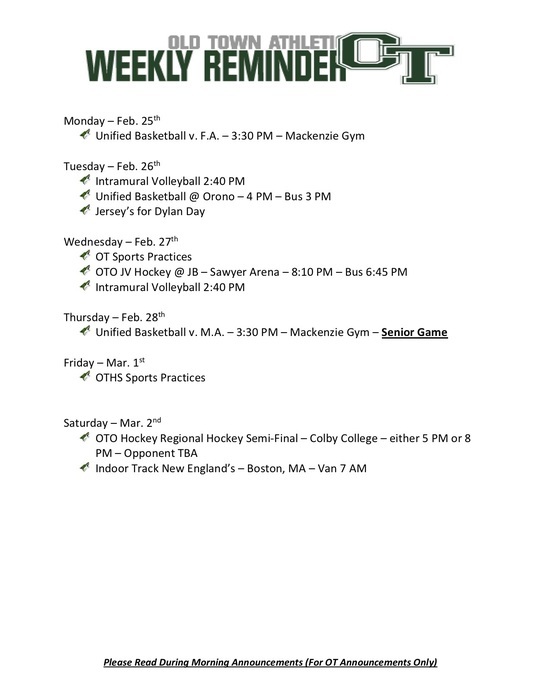 Attention Seniors - Important Reminders: *Deadlines to sign up for the UMaine and Husson Application Reviews are this week. *Project Graduation Lottery Frame tickets due by Friday 11/30. Winner will be drawn on Saturday, December 1st. 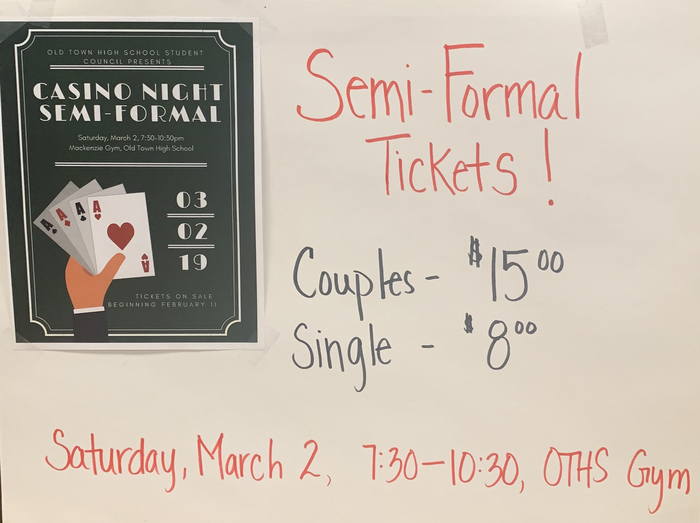 Tickets can be picked up and returned to the main office at the high school. *We need more recipes for the Friends of the Class of 2019 cook book. 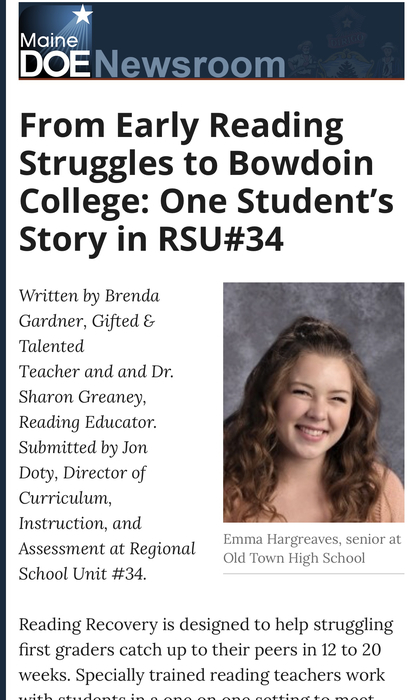 Please email them to karen.paradis@rsu34.org . 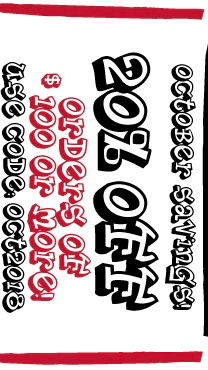 OTHS Yearbook is looking at a pretty serious decrease in pages if we do not have parent ads sold by next Monday. You can sponsor a senior student page by completing the form found at the main office or on our website! Thank you for our support. 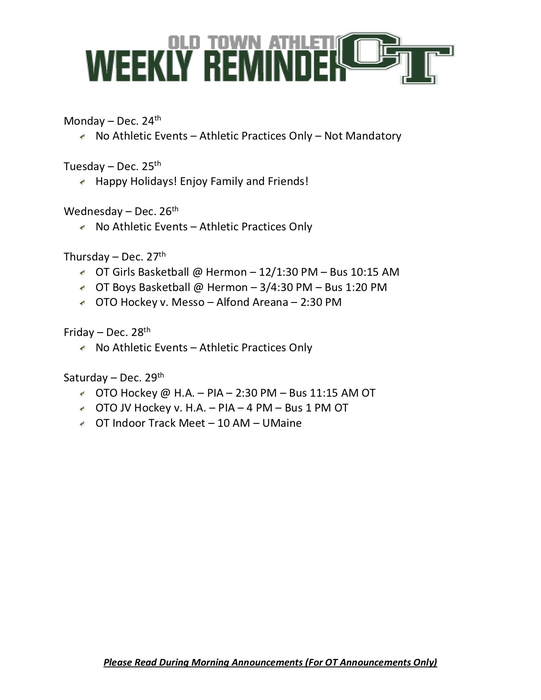 Attention Seniors - Representatives from UMaine and Husson will be in the Guidance Office in December to do Application Reviews. This is a great opportunity to put a face to your application and possibly get a decision. 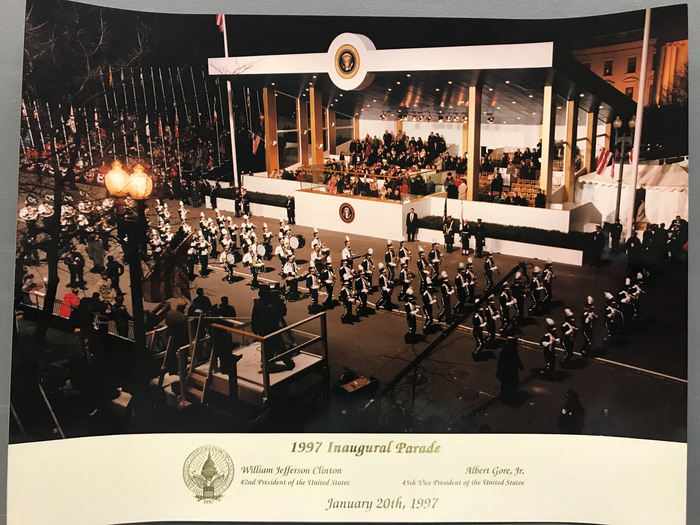 Stop by the guidance office for more information. 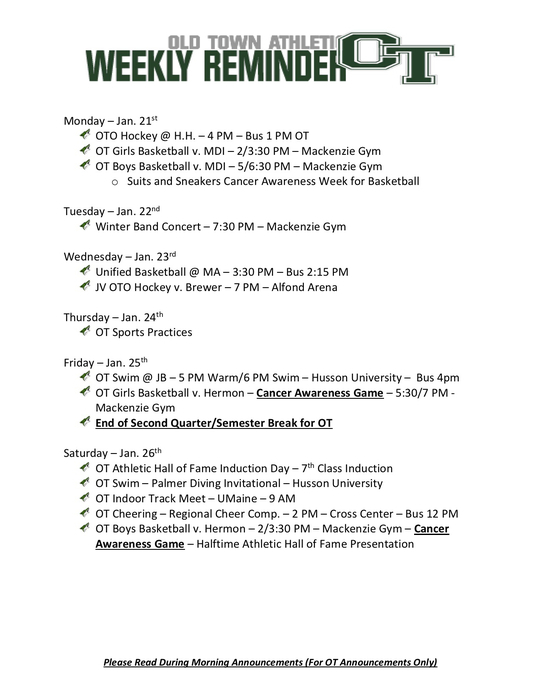 Just a reminder, Winter Sports informational night tonight at 6 PM in MacKenzie Gym! 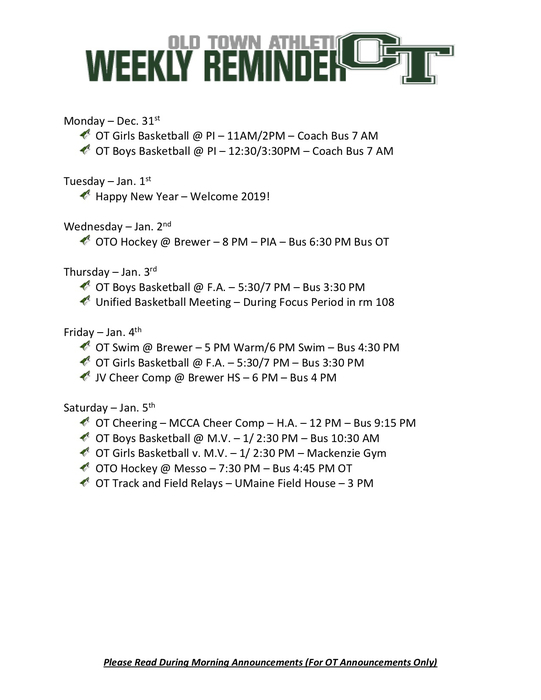 Information for first year athletic participants and programs at OTHS. Just a reminder - Parent/Teacher Conferences are Thursday 11/15 from 3 PM to 8 PM. 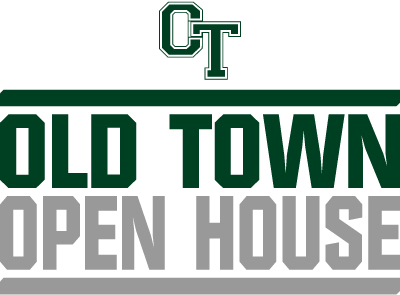 If you haven't signed up yet, please go to www.ptcfast.com/schools/Old_Town_High_School Need help? Call the main office at 827-3019 and they will assist you. 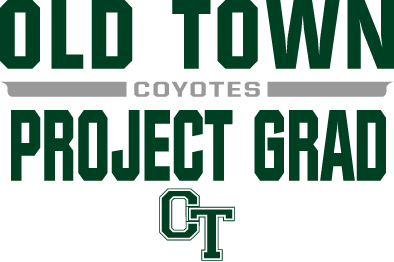 Just a reminder - there is a Project Graduation meeting on Sunday at 4pm at the Old Town Elks Club. Please join the effort - all are welcome! 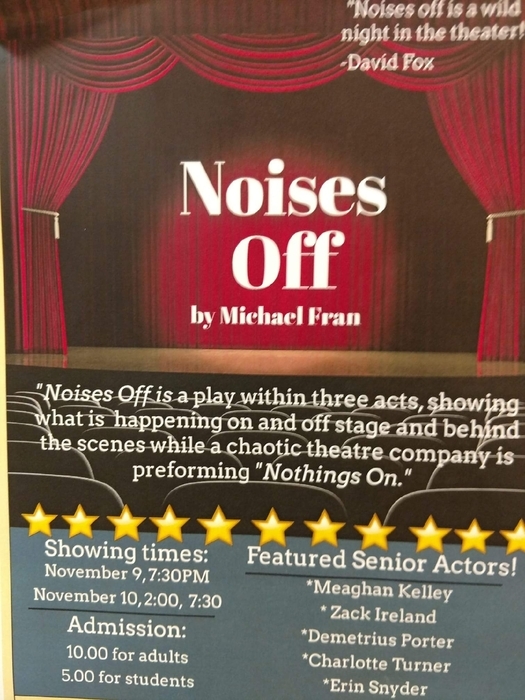 Please come out and support our talented students!!! 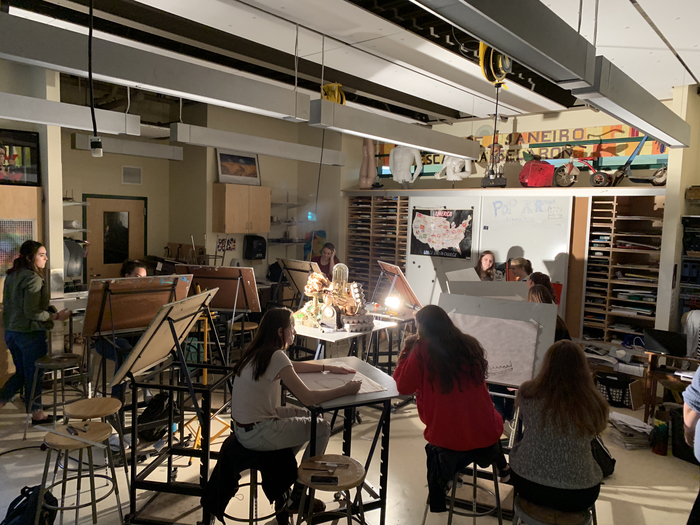 Positive Post - Mrs. Peterson’s AP art class, drawing prospective still pieces... the creative spaces develop inspiring minds to create amazing art! Thanks Mrs. Peterson for your supportive and loving art classes! 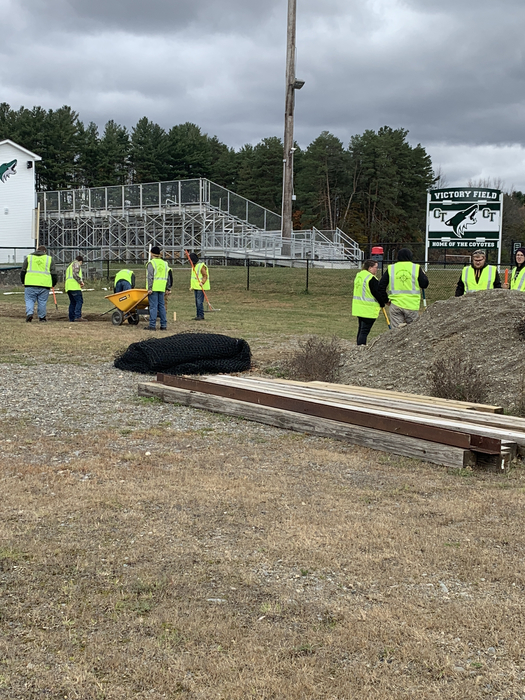 Positive Post Tuesday - UTC student helping OTHS Softball on installing the new batting cage, while gaining on the job training... Learning communities helping each other! 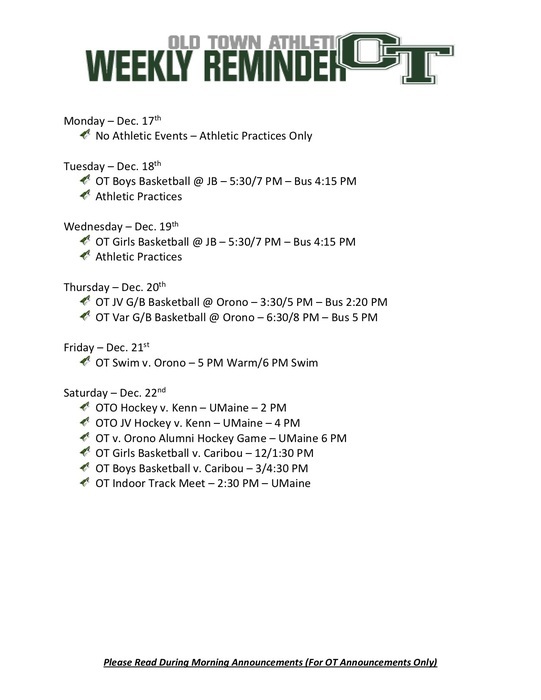 OTHS Sideline store - November deals - great time to start holiday shopping! 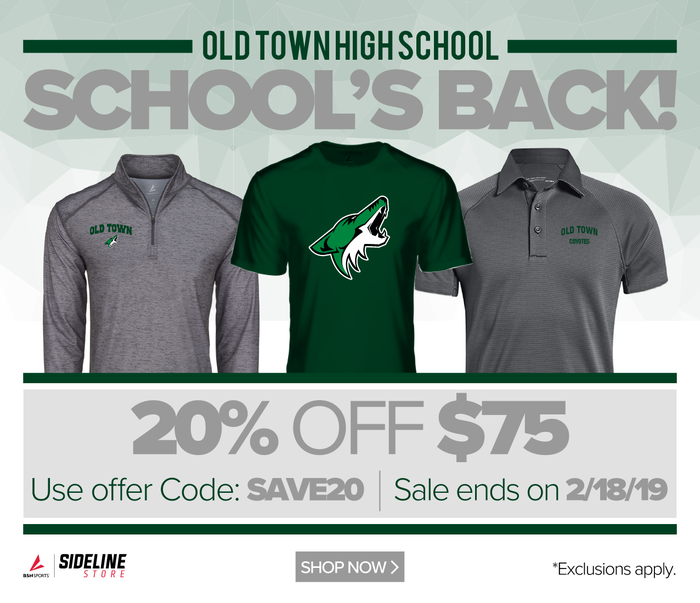 Visit https://sideline.bsnsports.com/schools/maine/oldtown/old-town-high-school for the latest gear! 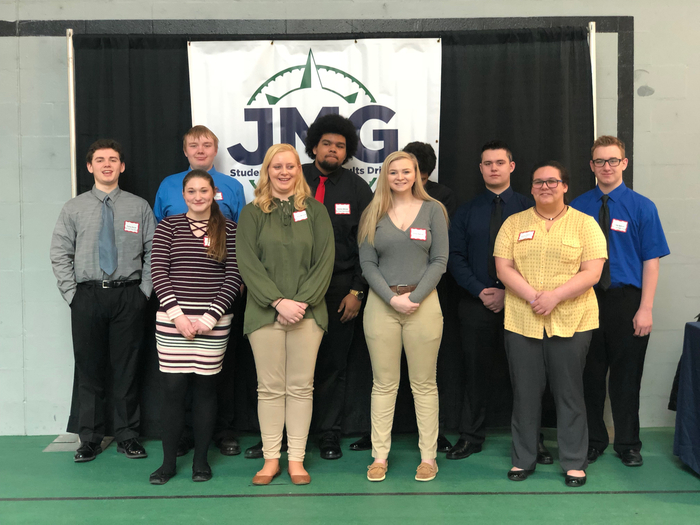 Congratulations to the OTHS JMG hosting a very successful and interesting I & I Ceremony tonight - Congratulations on being a part of a national elite program of Career Leadership Services. Thank Mr. Dunlop on guest speaking tonight and your positive message. 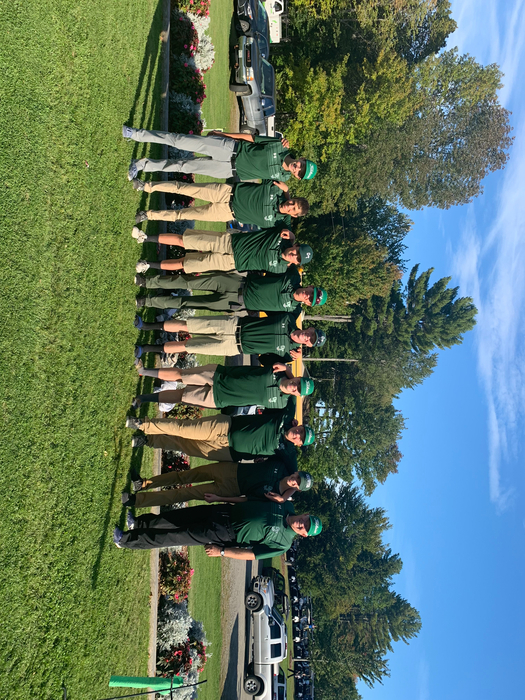 The boys team finished the season with a 12th place finish today at the Class B State Meet, led by personal best times from Nick Letourneau and Philip Alyokhin. Freshman Izabelle Trefts with a solid performance as the lone representative for the girls. 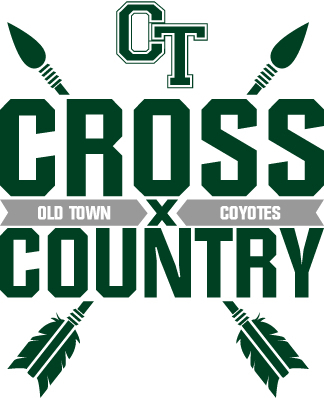 Good luck to the OT Boys Team and Girls Individual runners at the XC State meet at Belfast today... Run Strong! 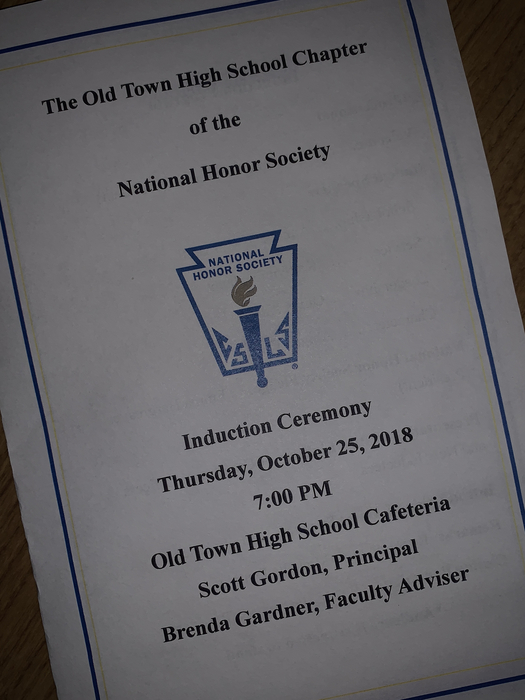 Congratulations to all the members of the OTHS National Honor Society and the newly inducted members of the class of 2018. 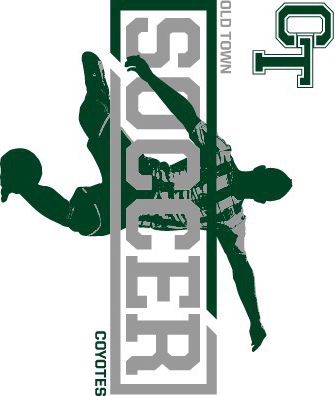 Boys Soccer teams season ended today in the County v. #2 PI 4-0.... great season for the boys, they should be proud. Thank you to all the parents, players, senior players and coaches for the time and dedication to the program... until next year! 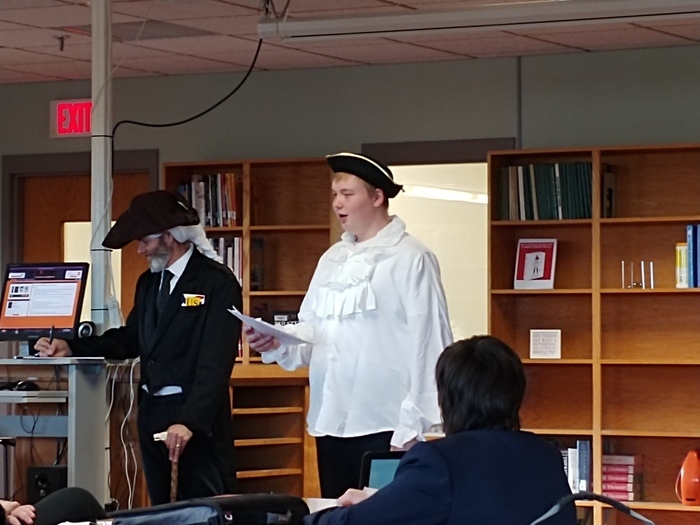 History came alive today in the library with Mr. May's AP US History class. Well done! Senior parents... There is a Project Grad meeting today at 4 PM at the Elks Club. We will talk about upcoming fundraisers. 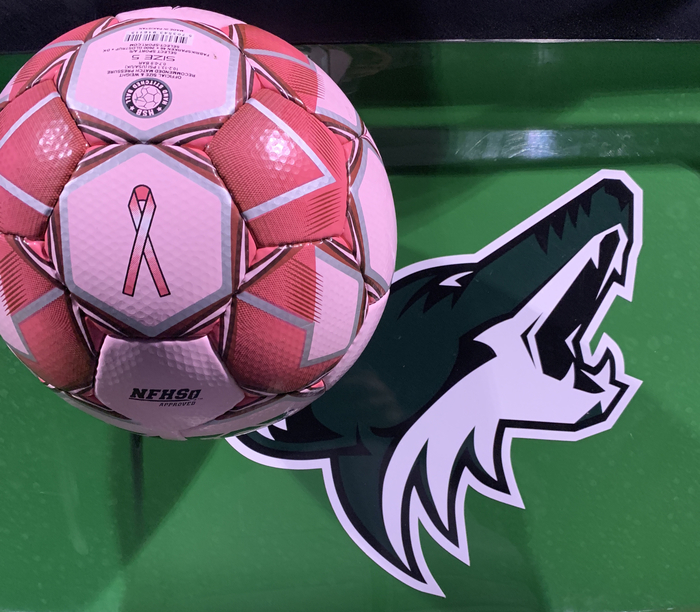 The goal is to raise $10,000 for our seniors. Please come and help! 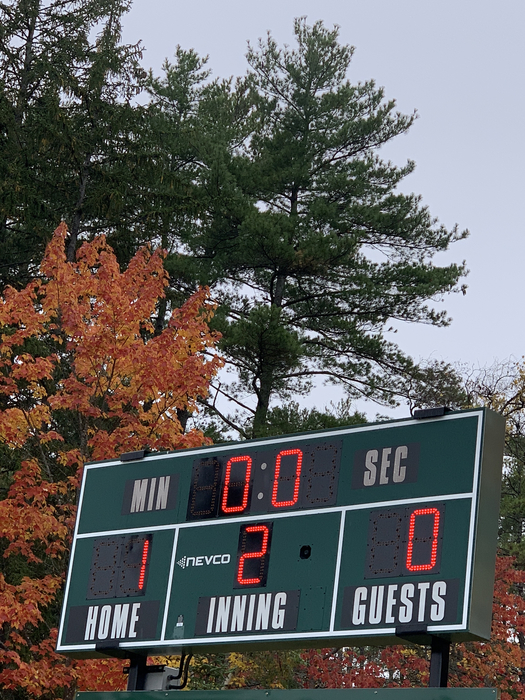 Football wrapped up the season with a loss down in Waterville today... we thank all the seniors for the years of service, that parents for the countless team dinners and support, and the coaches for the time put in.... until next year! XC Update - The boys team finished 6th today + qualified for the state meet next week. Individually for the girls, Izabelle Trefts finished 14th + qualified for the state meet as an individual. Good luck to all the runner next Saturday! 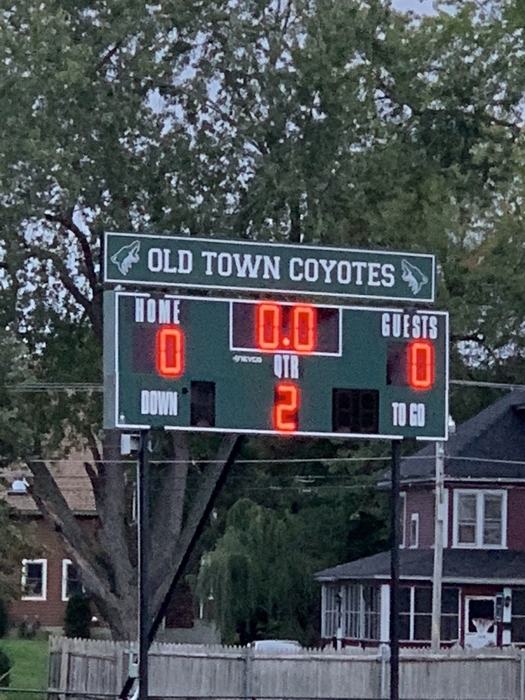 Huge win for the OT Boys Soccer team - 2-0 v. Winslow - Coyotes move onto#2 PI on Tuesday, 5 PM at PI Middle School - Coyote Nation invading the county! 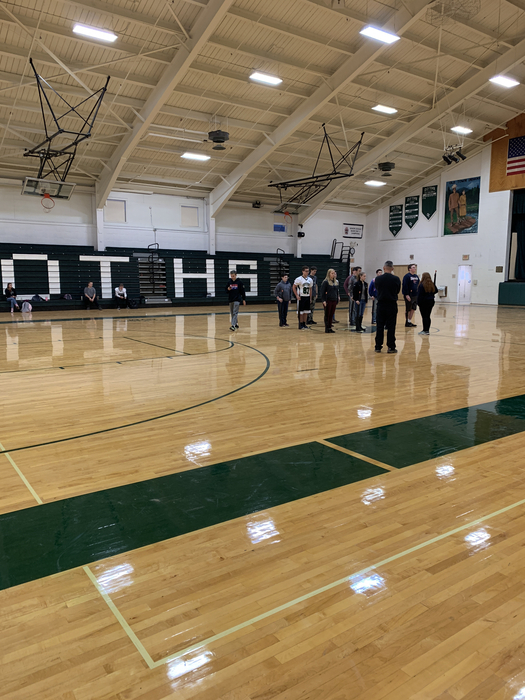 The things unseen, JROTC Drill teams are here every morning in the fall practicing for competitions at 6 AM till the start of school. 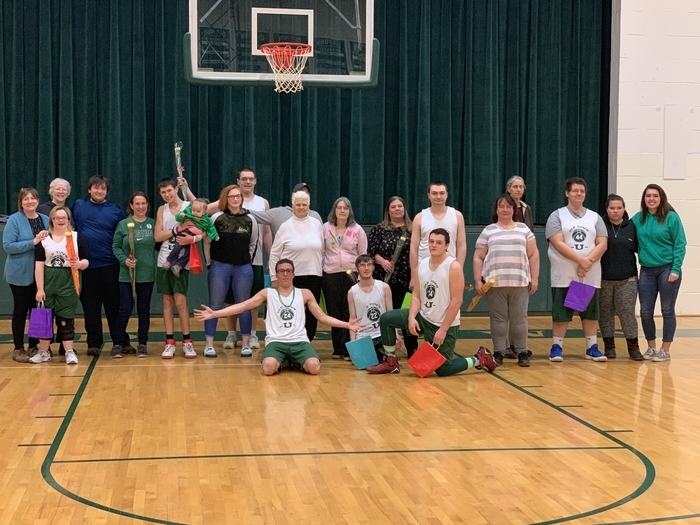 Thank you for the dedication by the cadets, first sergeant and the parents to get them to practice everyday! 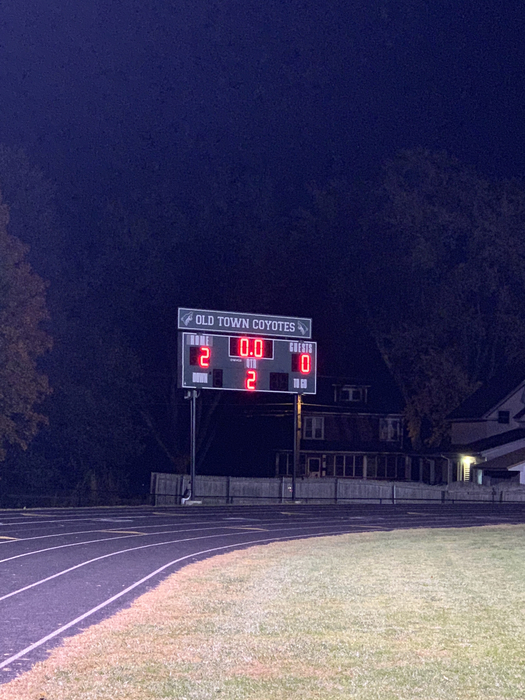 Final games for the JV Soccer program tonight v. JB - the coyotes braved the cold with the girls pulling away with a 1-0 victory, while the boys fell 6-3... thank you to the coaches, fans, and players for an exciting year! Positive Post Thursday! 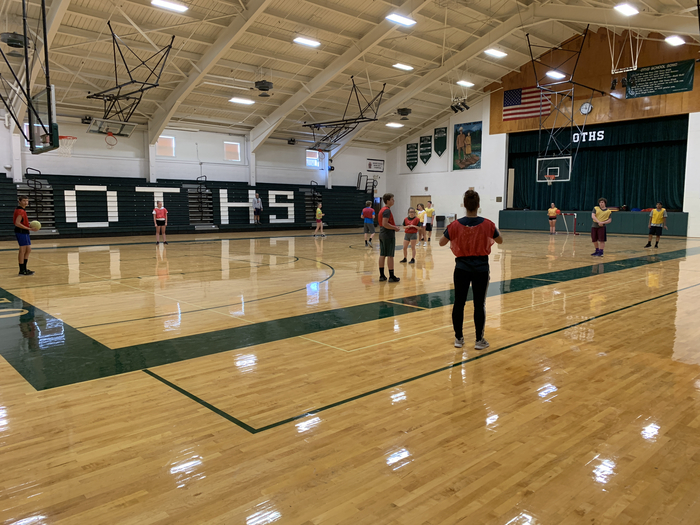 When the temperature drops outside, move the PE inside and continue with the positive learning! Indoor soccer with a twist, add a little energy-ball action - thanks Mrs. Libbey and Mr. Cowan for the creativity! 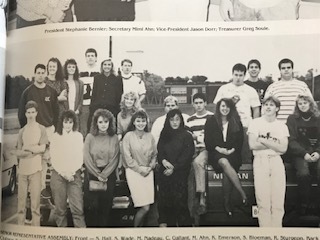 Hey Old Town High School & Alumni - it's Throwback Thursday - how many people do you recognize in this picture? Those were the days! 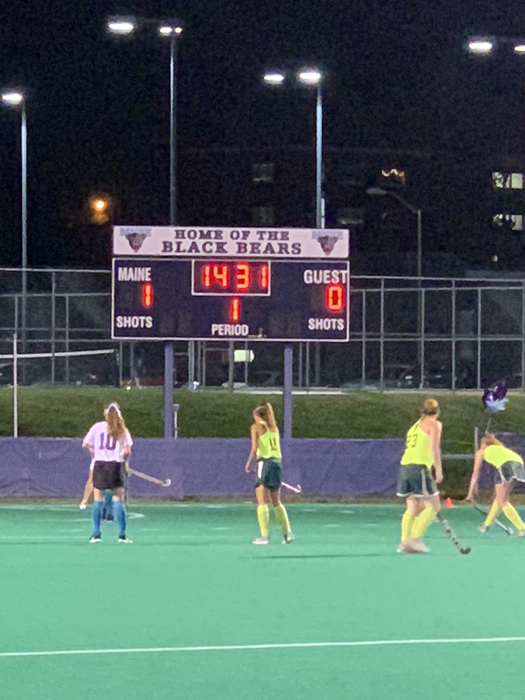 OT Field Hockey season ended today at FA - 3-0 loss - thank you to the coaches, players, and fans for a great season! 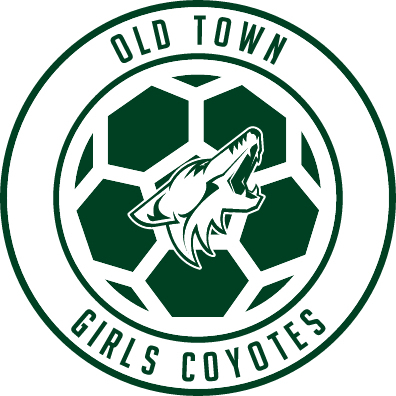 Coyotes Pride! 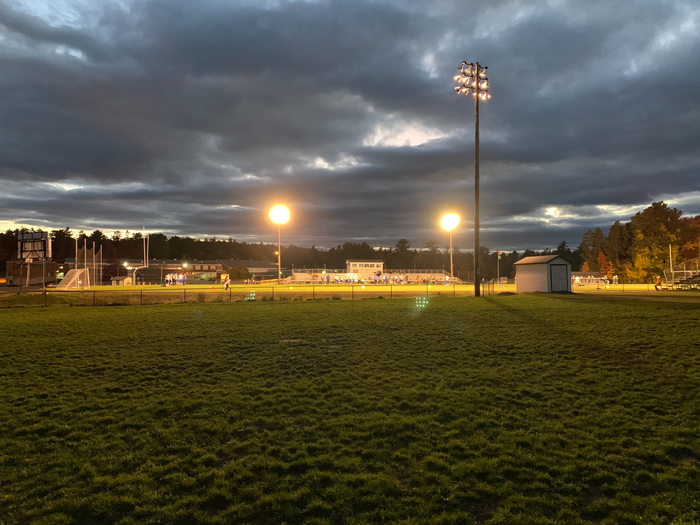 Tuesday night under the lights for OT boys and girls soccer - Perfect night for a soccer game - thank you to all the Senior members of the soccer program, the dedication has been special! 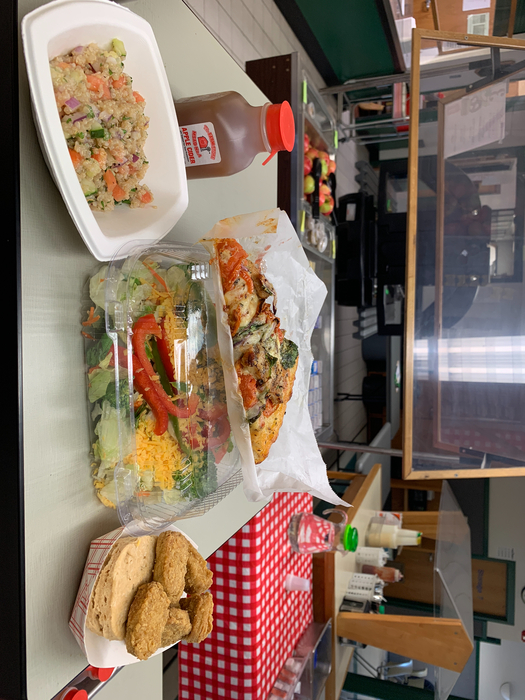 Big shout out to our food service and the increase in yummy and unique food options being offered to our student body.... Thanks for your dedication and creativity! 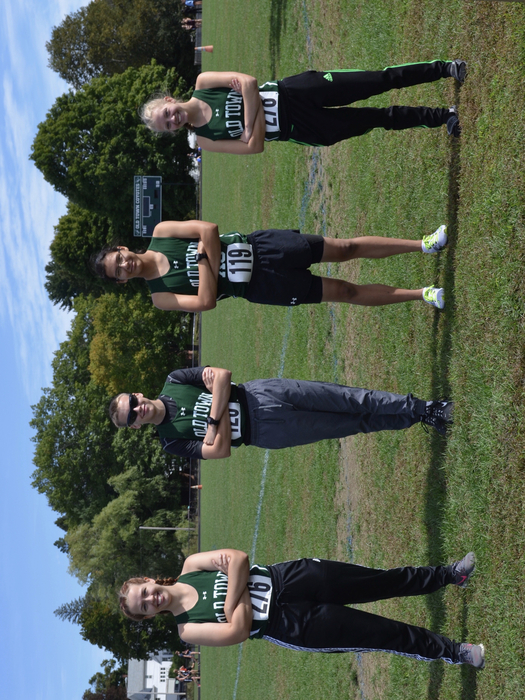 XC PVC Results: Both teams finished 5th, and individually, top finishers for the boys were Nick Letourneau in 14th and Philip Alyokhin in 16th, and for the girls Audree O'Meara finished 10th and Izabelle Trefts finished 16th. 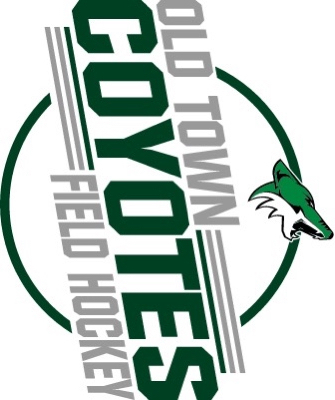 Good luck to all our athletes competing across Maine - XC in the county, FH at home, Golf individuals at Natanis... Make Coyote Nation Proud! 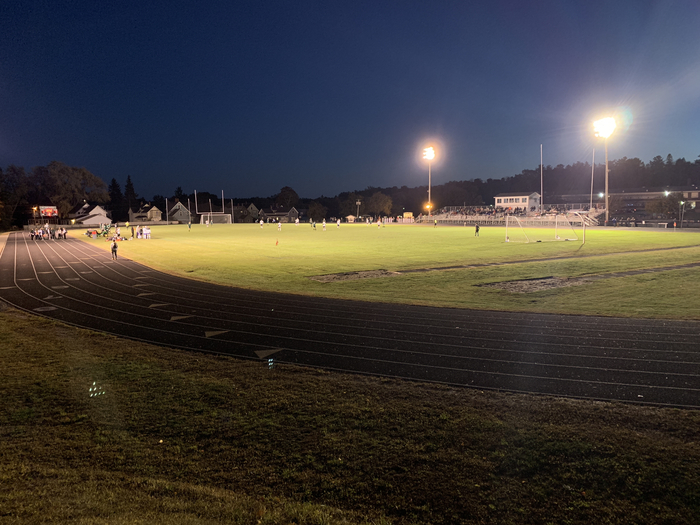 Friday Night Lights - OT Football v. Belfast - Senior Night - thank you Senior Football players and cheerleaders for your service to the program! 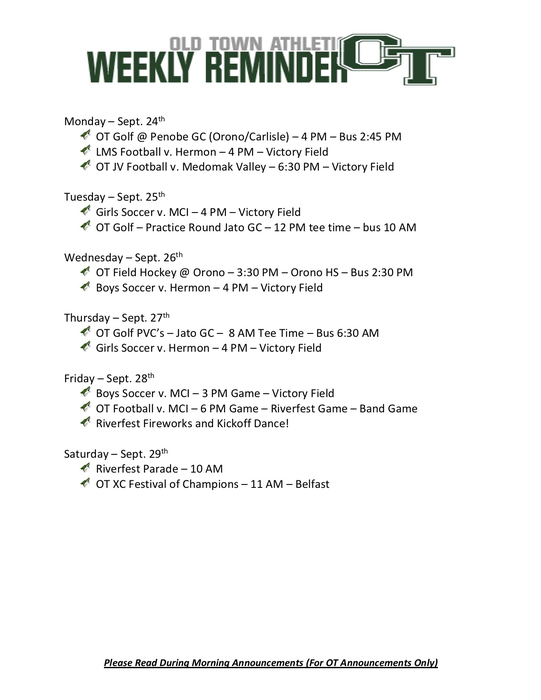 Just a reminder that permission slips for the Thomas College Field trip are due Friday 10/12 and permission slips for the UMFK field trip are due Friday 10/19. This is open to juniors and seniors. Wednesday's Testing Schedule. All students in grades 9 - 11 need to be at school by 8 AM. Students will not be allowed in to a testing rooms after testing has started. There is no make up for the PSAT. Seniors have an optional college application session (see schedule). Saturday OT XC Action - the boys finished 2nd at the Orono Invitational, the girls again did not have enough finishers to have a team score. Individually, Nick Letourneau finished 5th and Philip Alyokhin finished 7th, Audree O'Meara finished 5th and Izabelle Trefts finished 6th. 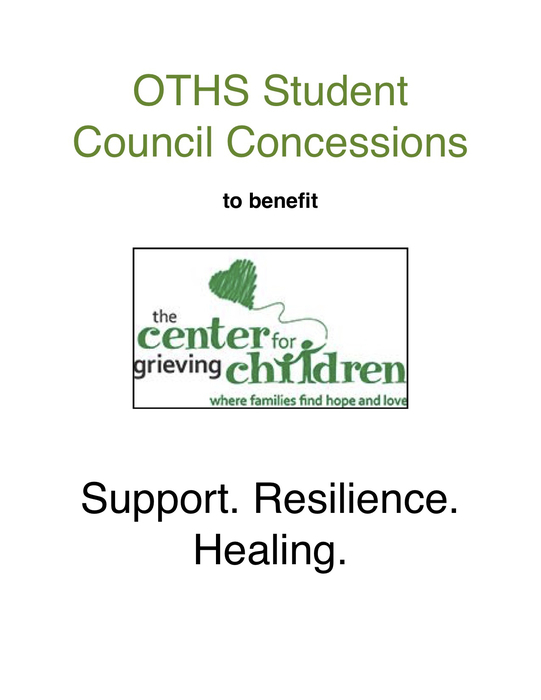 Calling all OTHS friends and family!!! We had our first project graduation meeting tonight and have our first fundraiser to accomplish!! We are putting together a cookbook of recipes from friends and family to be sold to help raise money for the class of 2019 project graduation. We need to have this put together by the beginning of November so please find an awesome recipe for a main dish, dessert, sides, soups, salads,etc. Please email- kparadis70@gmail.com THANK YOU!!! 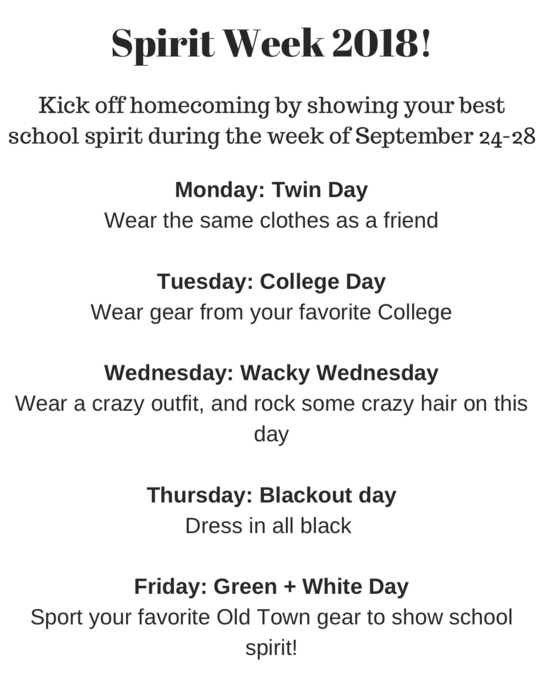 Attention OTHS Senior Parents! 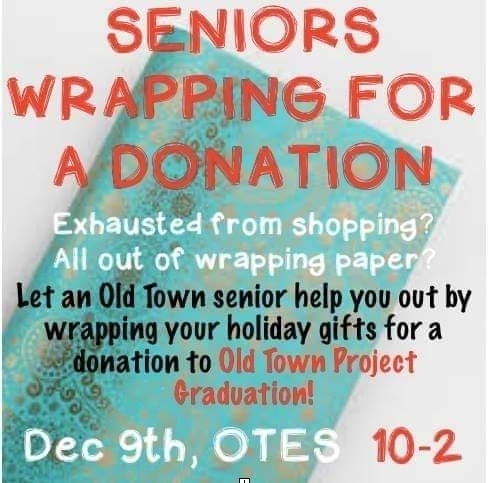 There will be a Project Graduation planning meeting this afternoon at 4pm at the OT Elks Club. This is the opening meeting for this year. 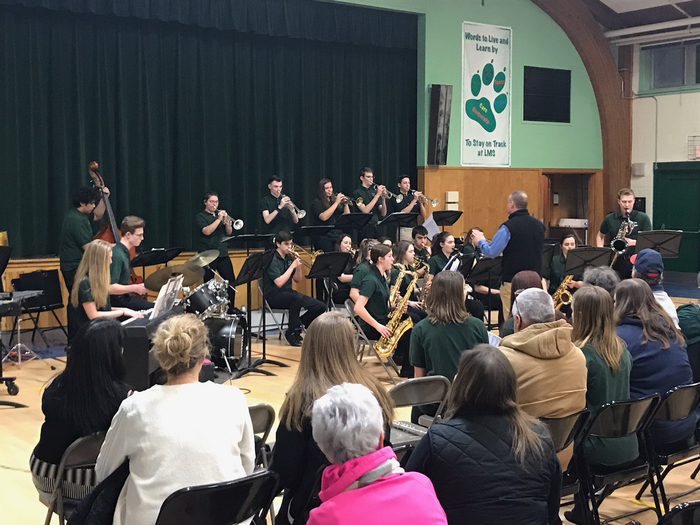 It takes many hands to create this amazing event for our seniors. We’d love to see you there! 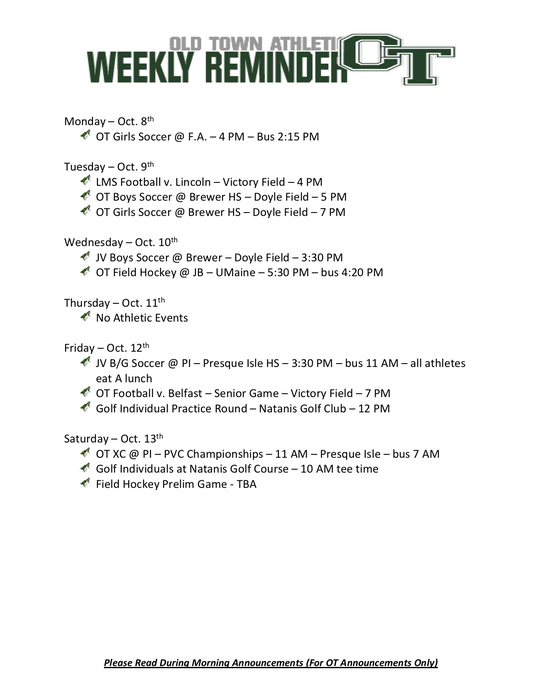 Juniors & Seniors - We are visiting 2 Colleges in the Month of October. 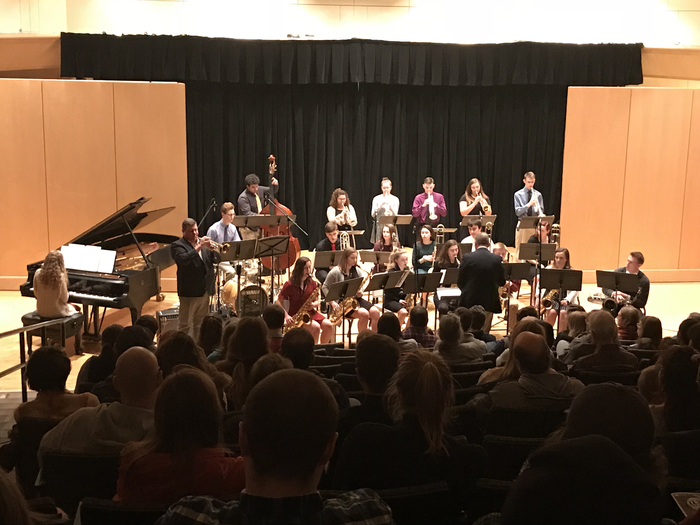 Thomas College on 10/17 and Univ. 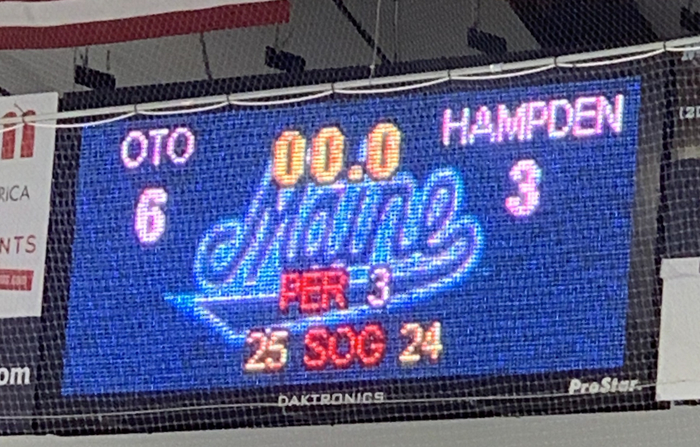 of Maine at Farmington on 10/23. 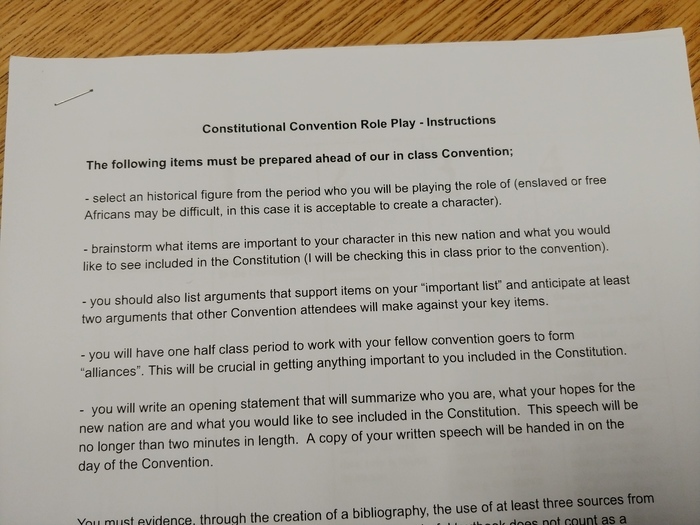 See Ms. Dow in Rm 103 for permission slips and more information. 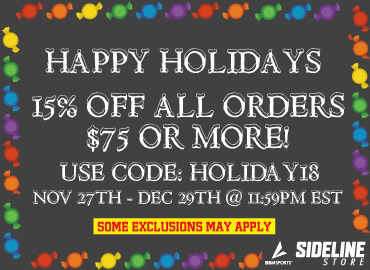 Shop Now and SAVE with your Official Online Sideline Store. Students, athletes, parents, alumni, and fans can now purchase their favorite SCHOOL custom Nike, Under Armor logo’ d apparel products at a great price. It is as easy as 1, 2, and 3: Pick your product, Pick your color, Add your favorite logo, and it ships directly to your front door. Don’t forget you can customize many apparel items with your name, number, or year to celebrate your athlete’s journey. 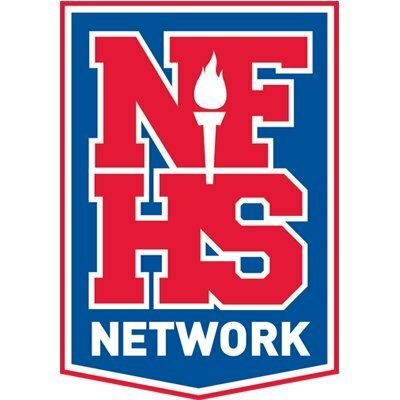 Seniors - There are a couple of important dates this week... Monday 10/1 - FAFSA opens for 2019 - 20 school year Friday 10/5 - November SAT Registration Deadline Sunday 10/7 - Project Grad Parent Meeting Stop by the Guidance office with Questions! 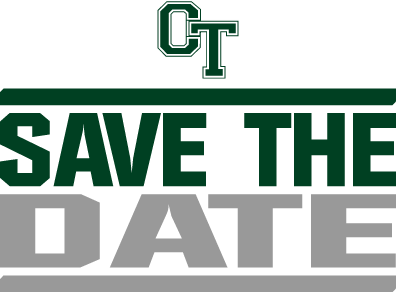 OTHS School community would like to thank our OT community, athletic family, parents/guardians, and student body for a great Riverfest Weekend full of fun and entertaining events... 354 more days till next year! 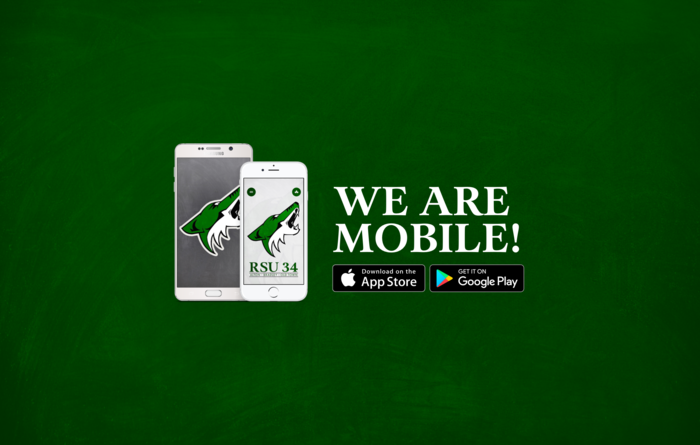 Remember - we are mobile now - download the new RSU34 app and keep informed on district and building level information.... Remember to enable notifications! 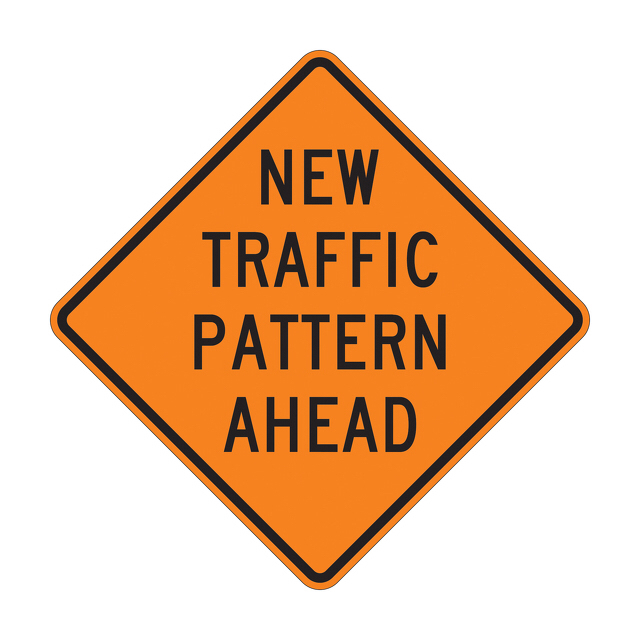 Beginning on Monday morning, September 24th - all parent pick up and drop off traffic between the hours of 7am to 8am and 2pm to 3pm - will need to drive to the back of the building. Only bus traffic will be allowed in the front loop from 7am to 8am and 2pm to 3pm. Drop offs or pick ups that happen outside those two hours - may happen in the front of the building. 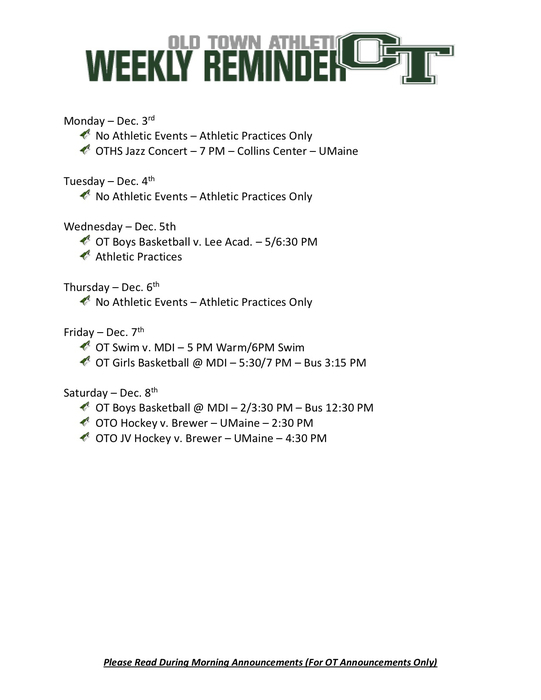 The College Fair at UMaine is Monday, 9/24 from 6:30PM - 8:30PM and Tuesday, 9/25 from 9AM - 11AM. 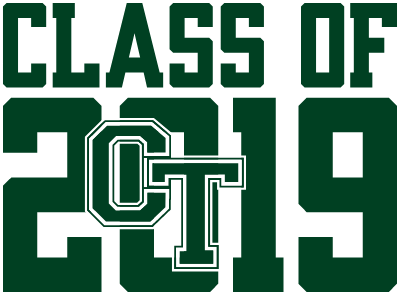 Juniors and seniors who wish to attend the college fair on the 25th need to turn in permission slips by the end of the day Friday 9/21. Lunch is included. 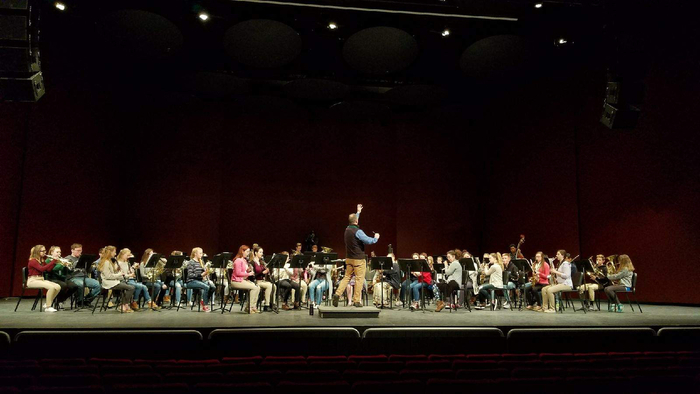 Practice Update! 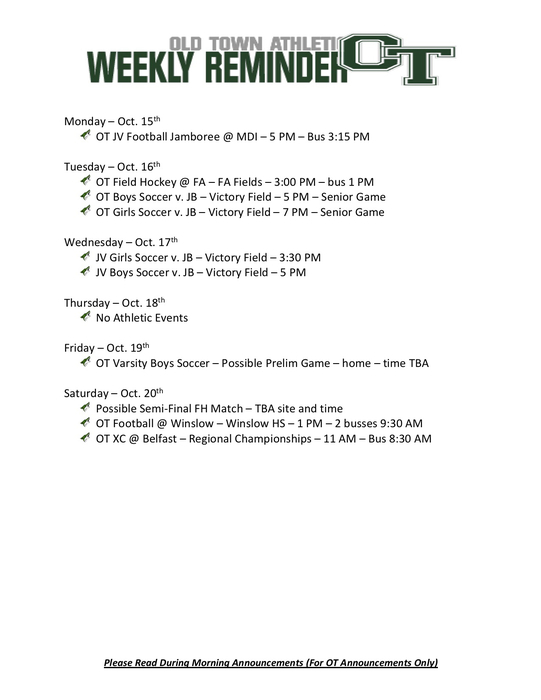 B Var Soccer Only - 3:30-5 LMS, G Var Soccer Only - 3-5 LMS, Field Hockey no practice - team meeting at 2:45 PM rm 113, Golf no practice, - team picture, Football is as scheduled, XC practice after team pictures, Cheer no practice, team pictures. 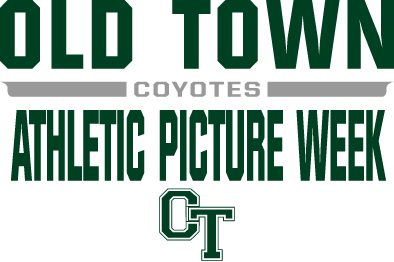 Fall pictures for the athletic programs are this week... Remember your forms and payment for your picture day. 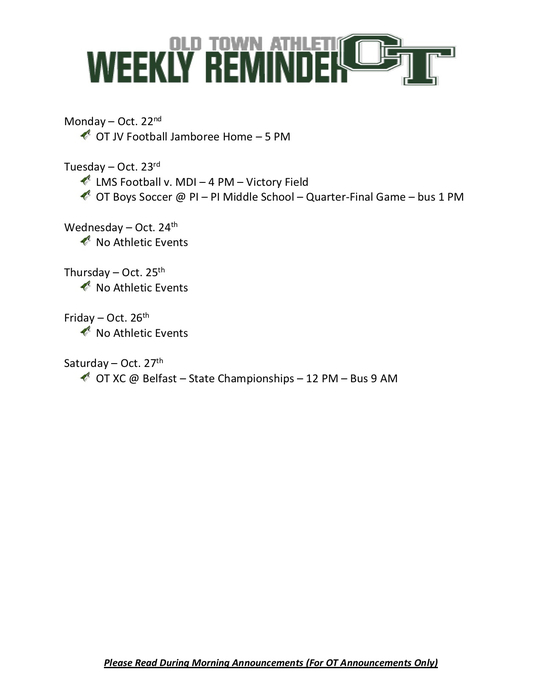 Schedule is in the weekly athletic schedule or on the webpage!